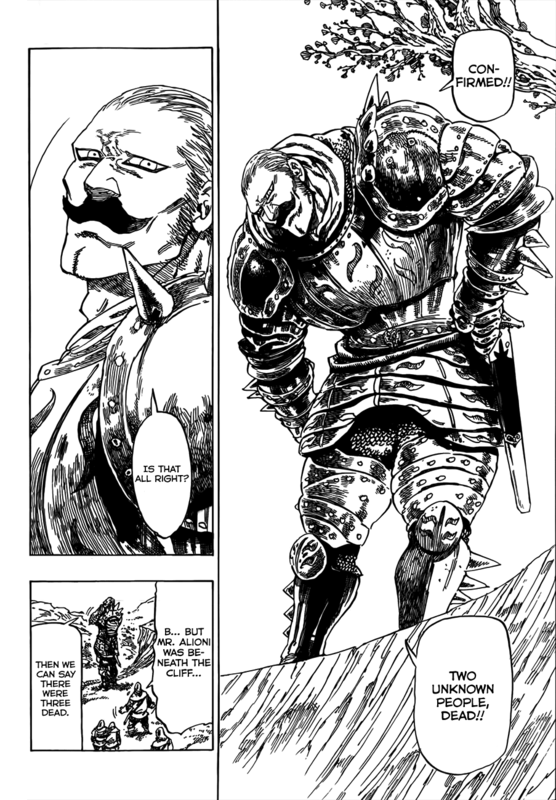 Feats of Tier 9-B or below will not be included. 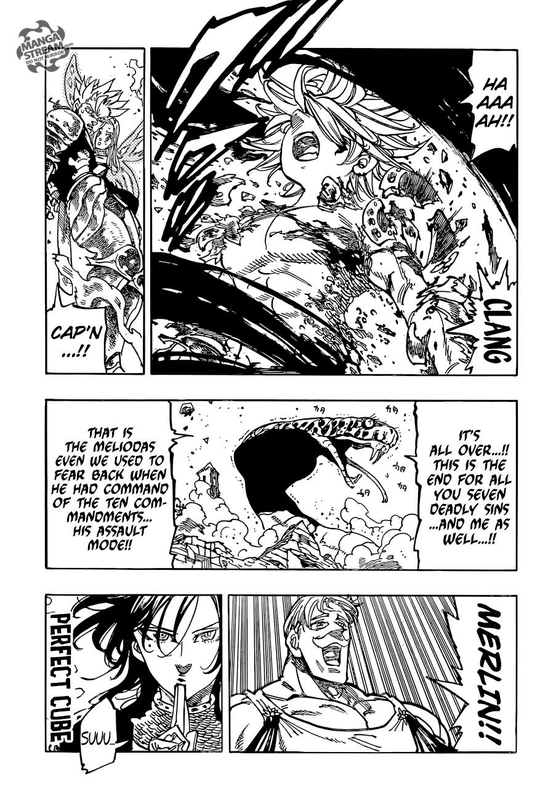 Feats against non superhuman characters will not be included. 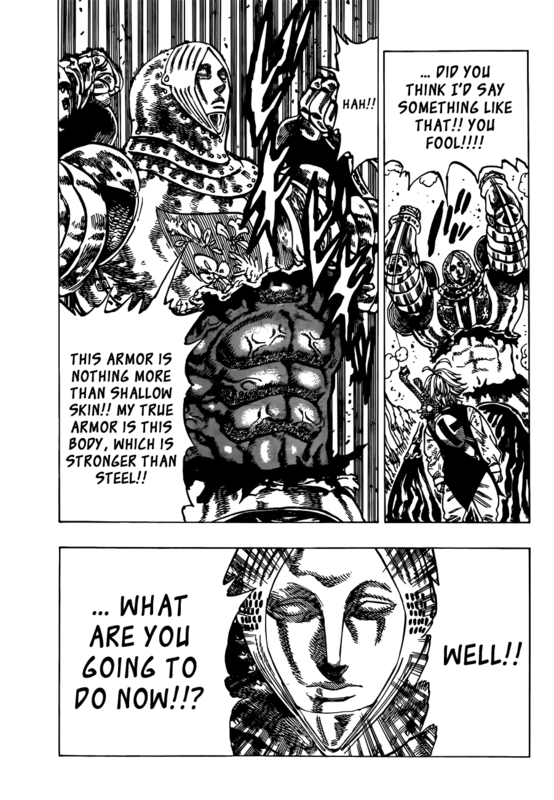 Gag feats will not be included. 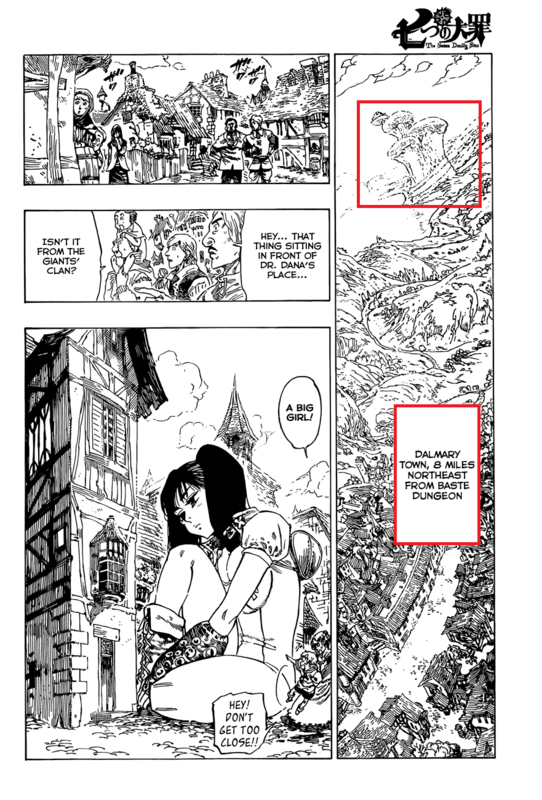 Proof the series uses Cinematic timing. 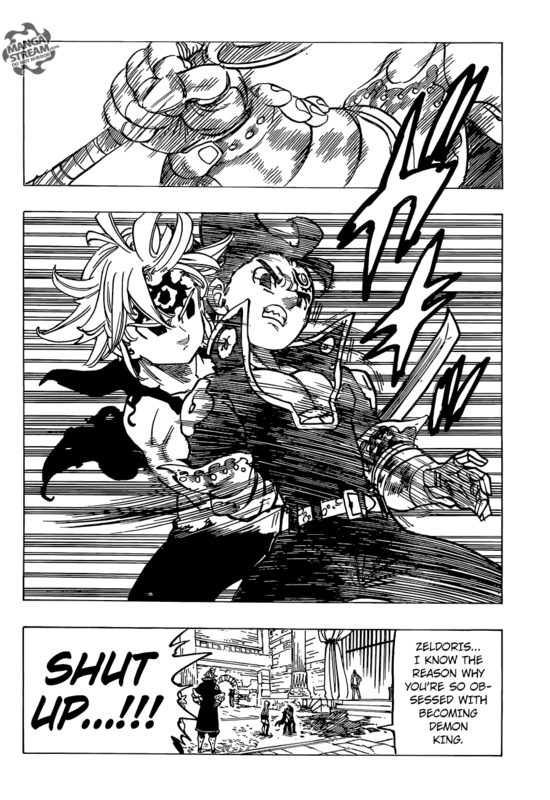 This section is non canon. 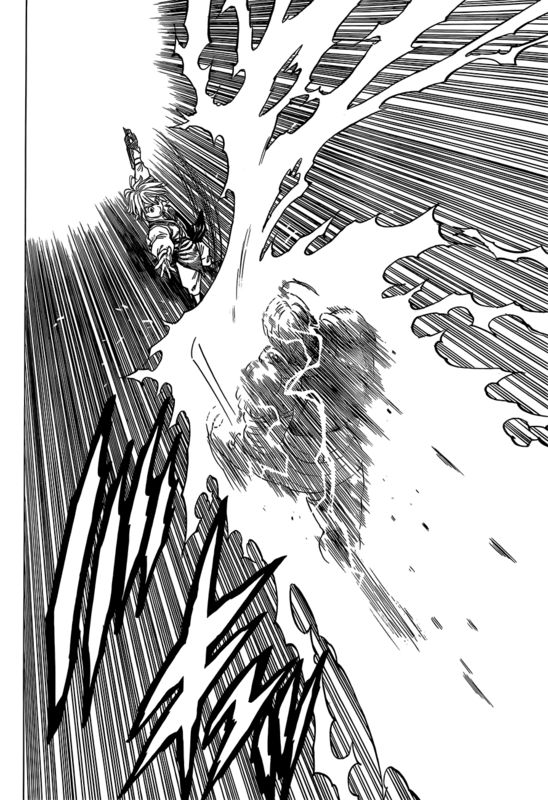 Alioni can one shot people with a causual swipe of his blade. 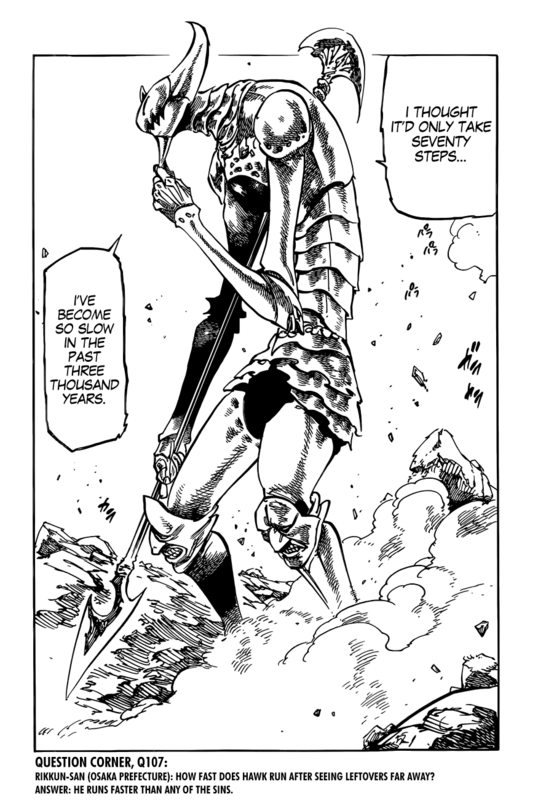 Normal Knights surpass the limitations of human beings, becoming "unparalleled" in strength. 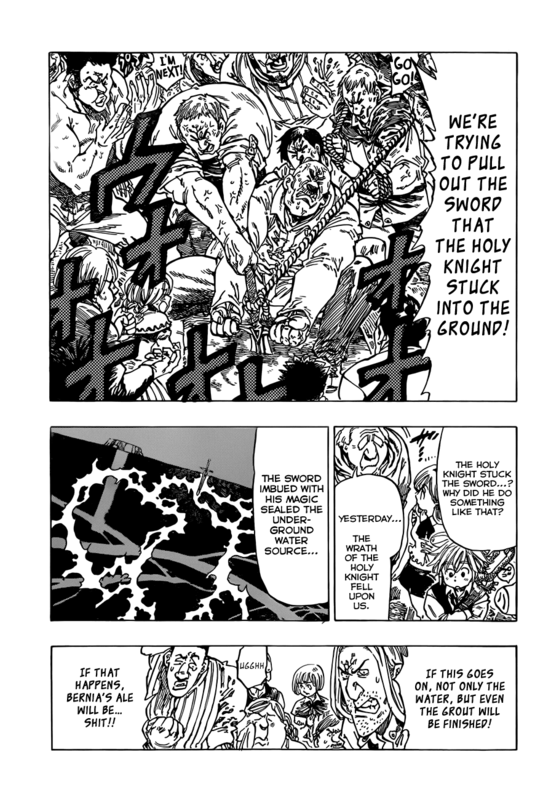 Took armies of Holy Knights to beat the Seven Deadly Sins. 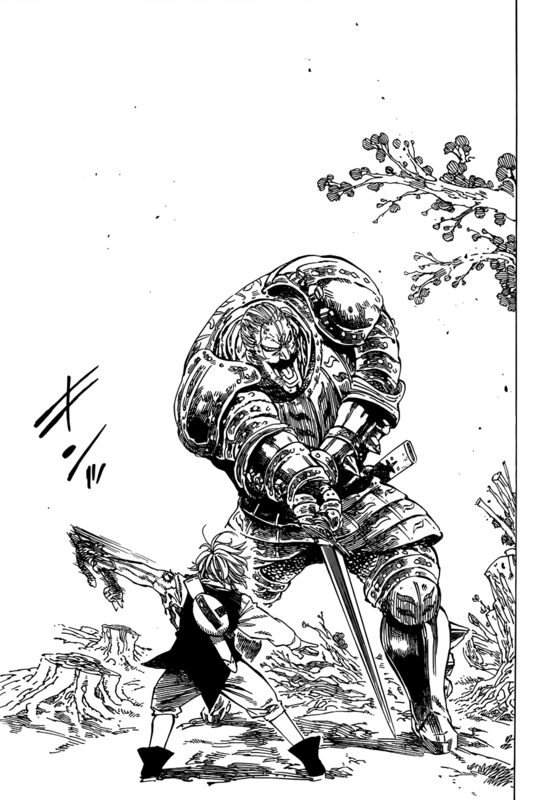 Can lift a massive sword. 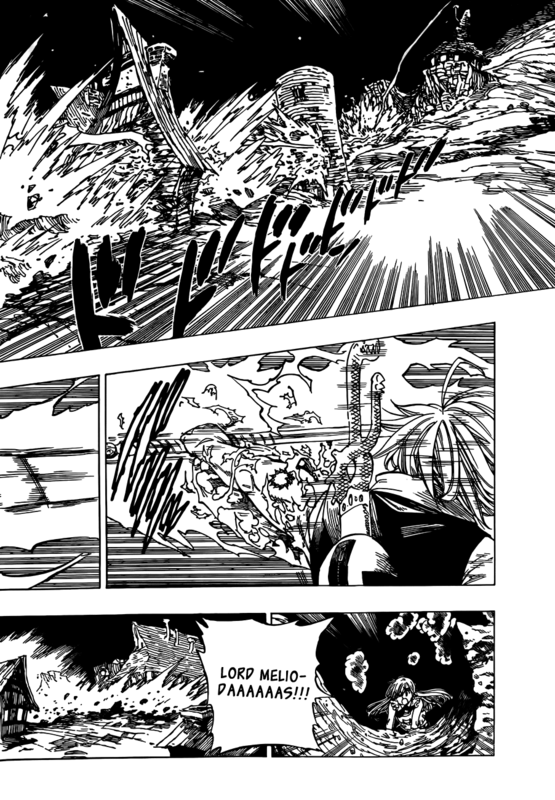 Punts Alioni hundreds of meters, creating a large shockwave. 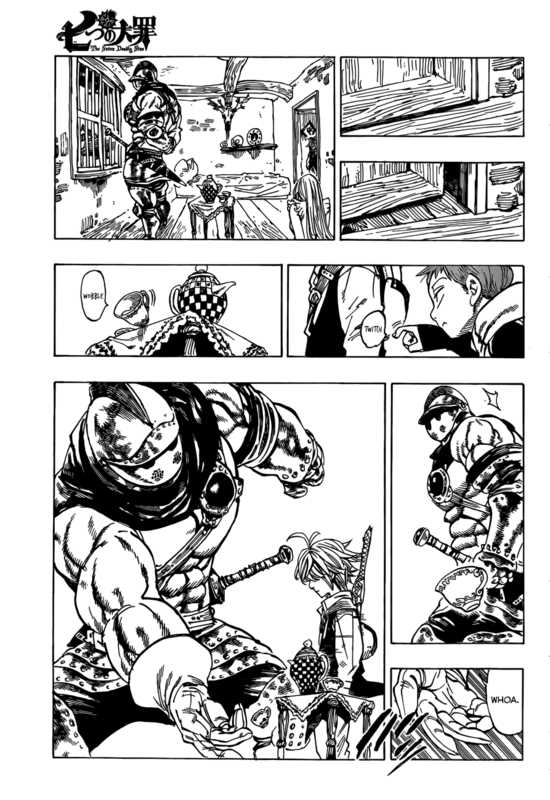 Intercepts a sword swing from a Knight. 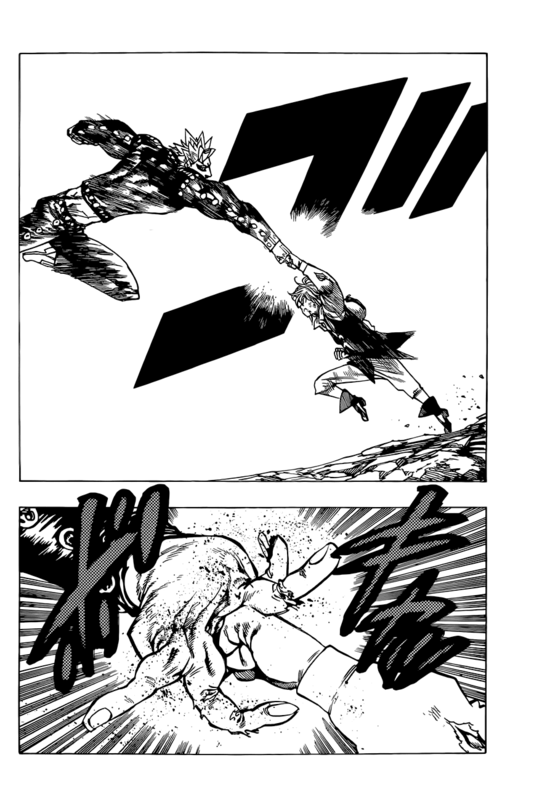 Intercepts a knife blow that's centimeters from contact. 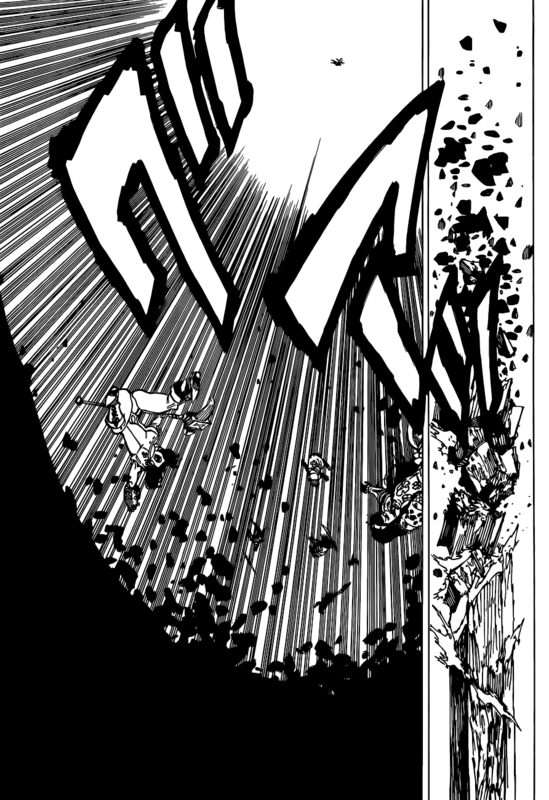 Blocks a shockwave from Alioni. 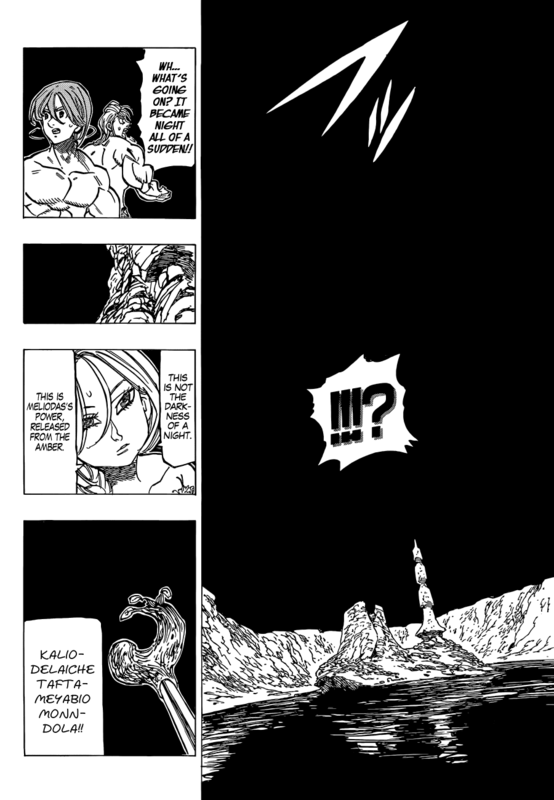 Blocks dozens of shockwaves at speeds Alioni can't see. 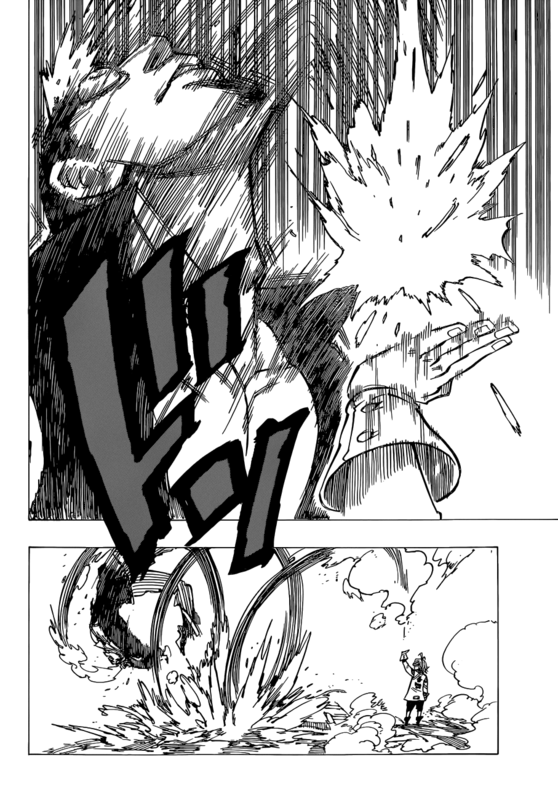 Withstands a room wrecking shockwave. 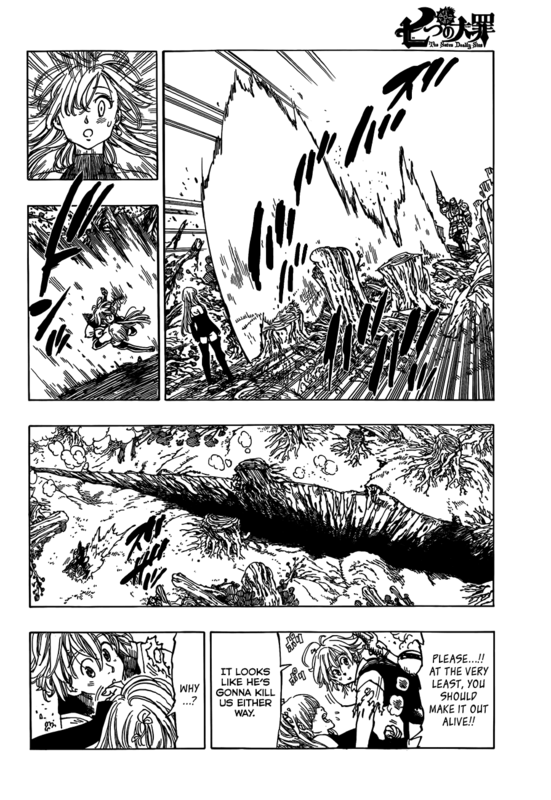 A Red Demon destroys a forrest that can't be burned by conventional flame. 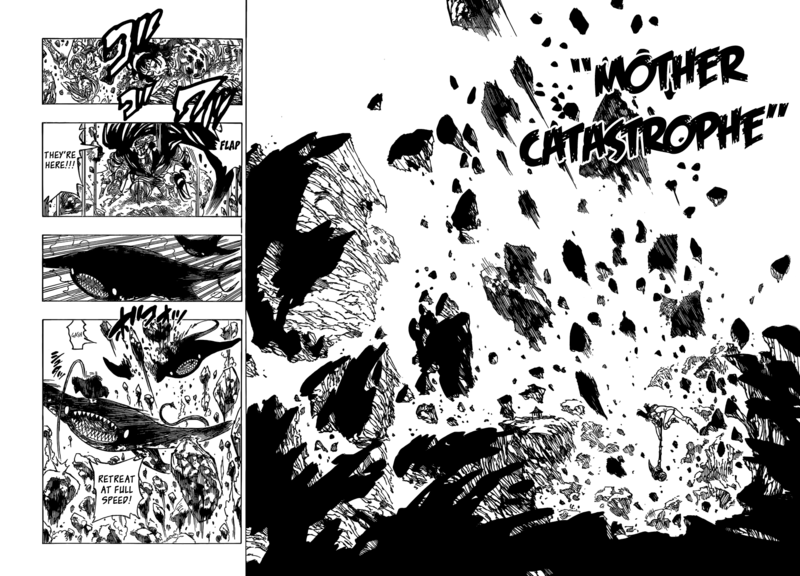 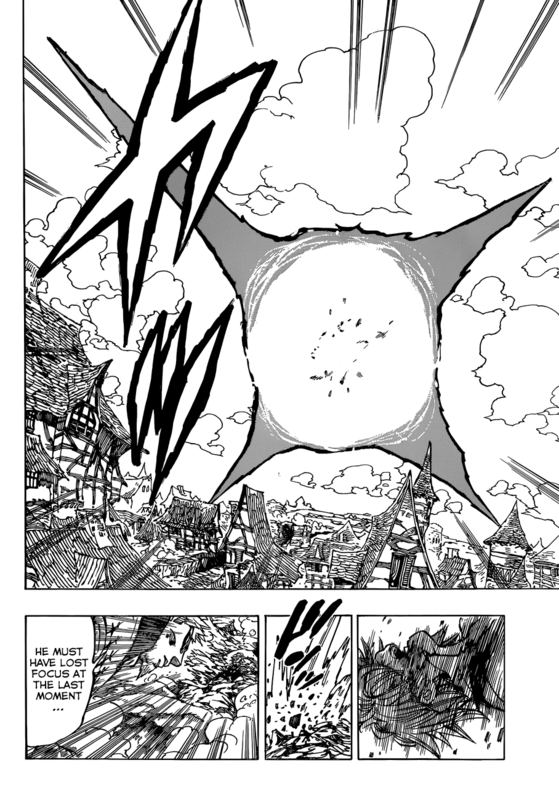 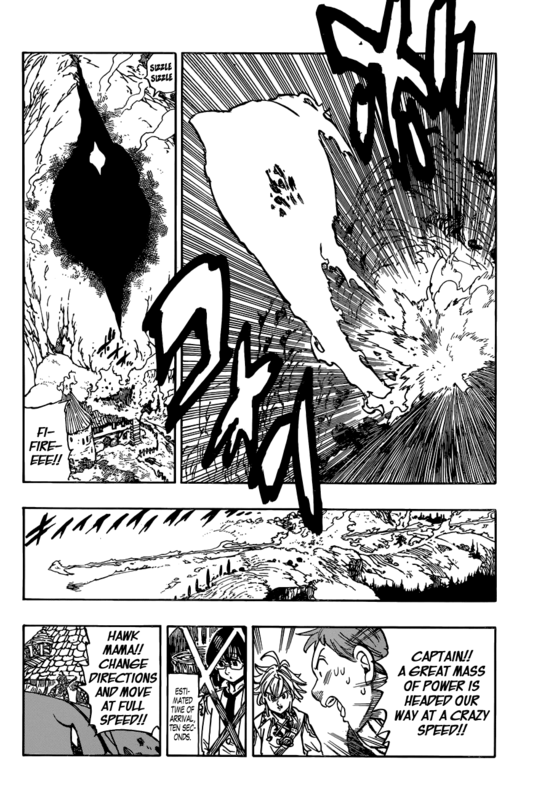 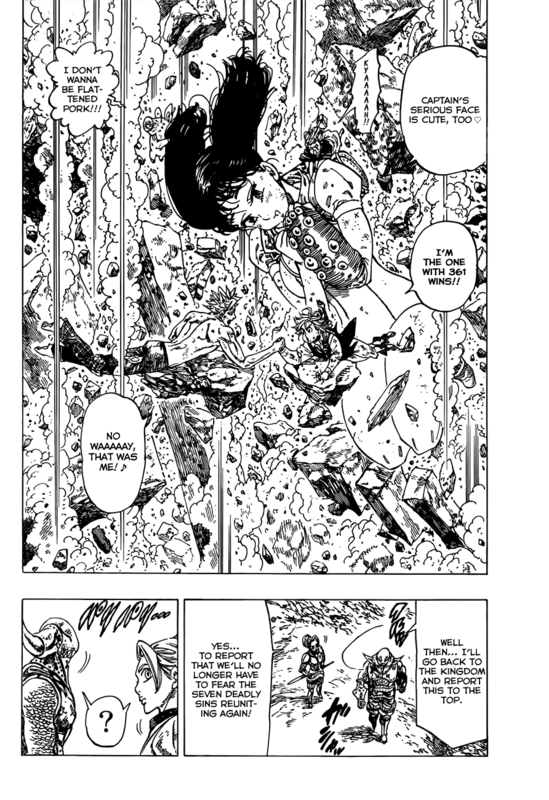 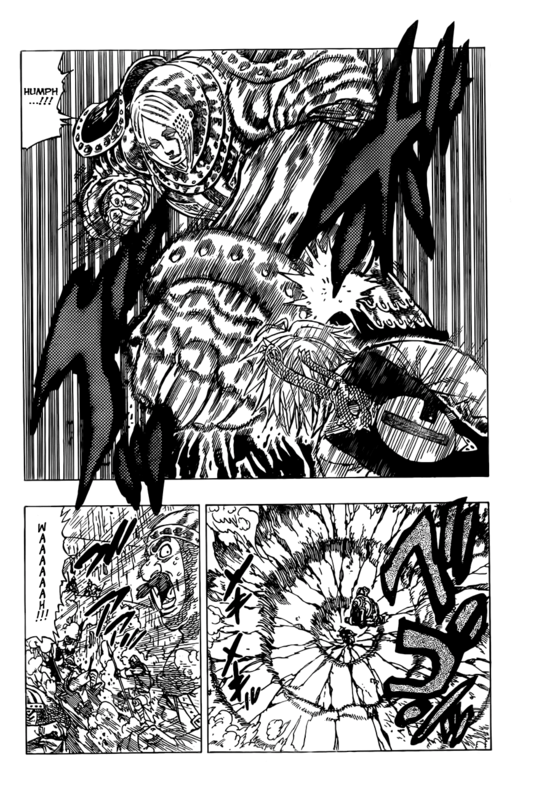 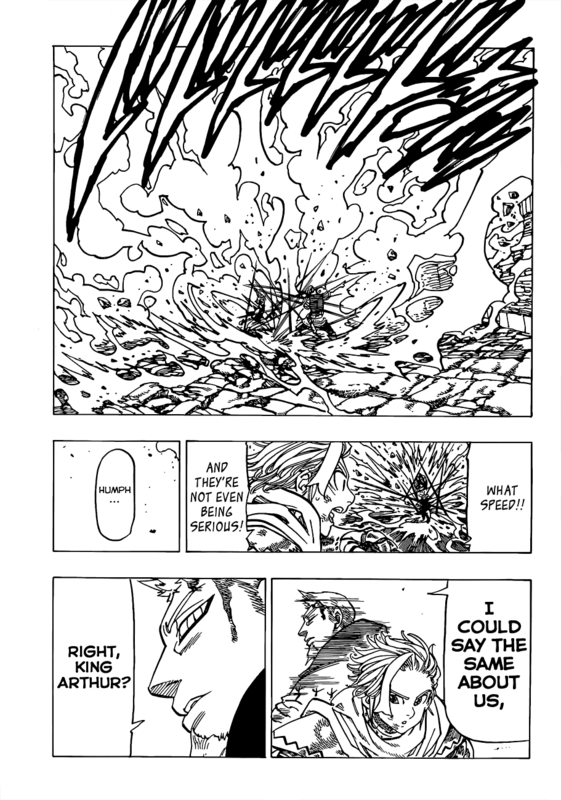 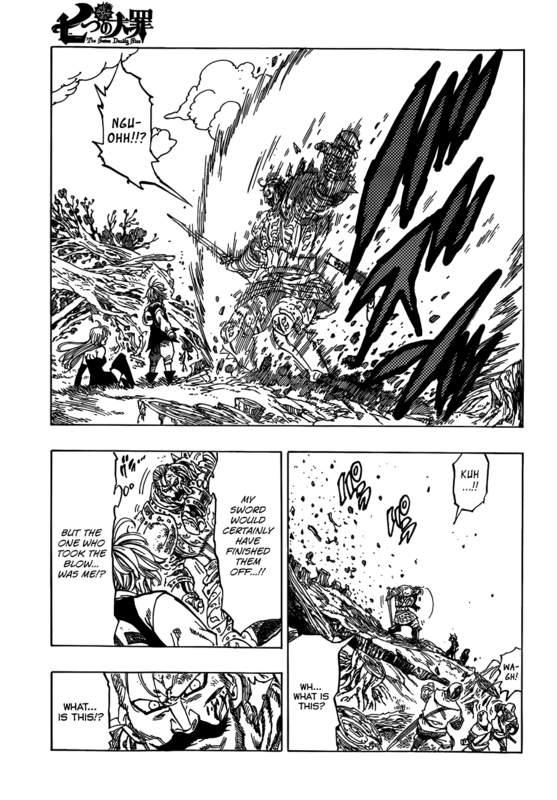 Ban and the Red Demon's battle destroy the Fairy tree which is at least a few kilometers in height. 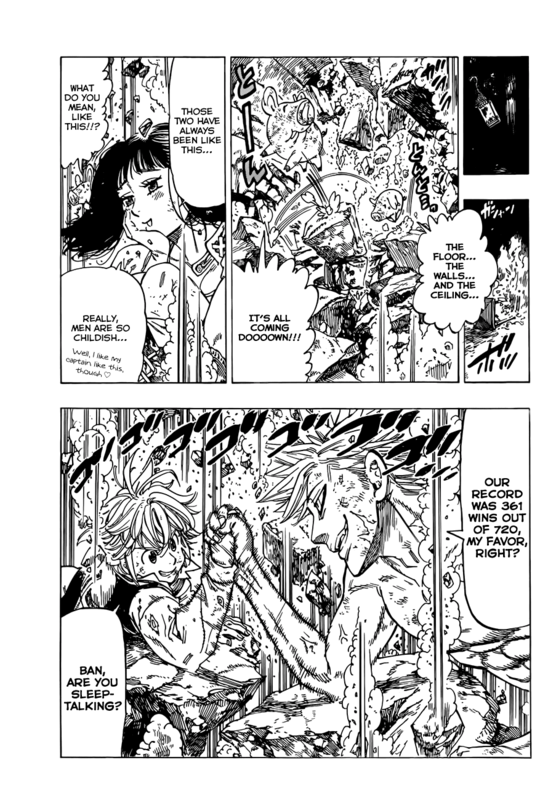 Ban and a held back Meliodas destroy Baste Dungeon with a casual arm wrestle, which was unaffected by 10 Town Level Dragons, and is quite big. 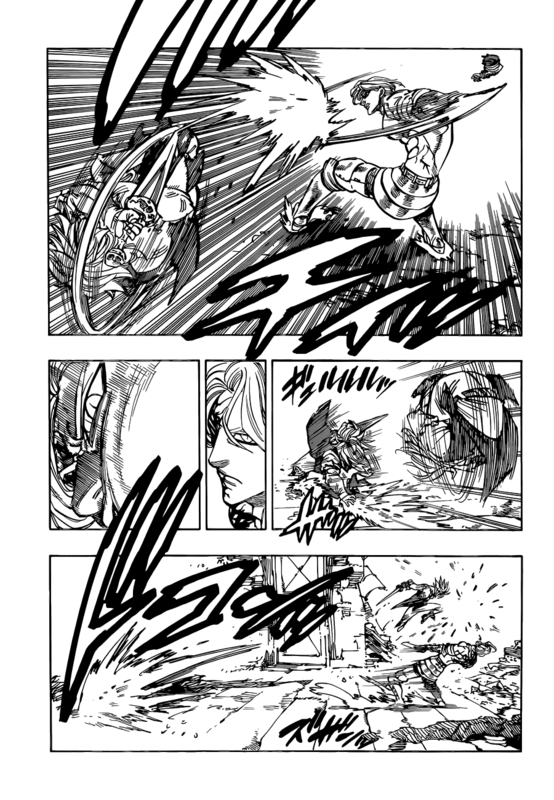 Knights (Twigo for instance) — Ave. is 300 — can do stuff like this. 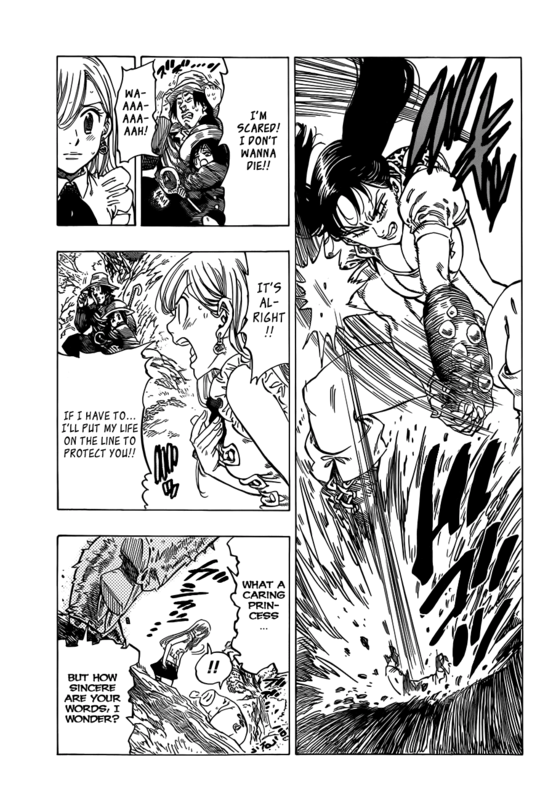 Mini Dianne could punch through Griamore's meteor proof barrier, more proof that it is. 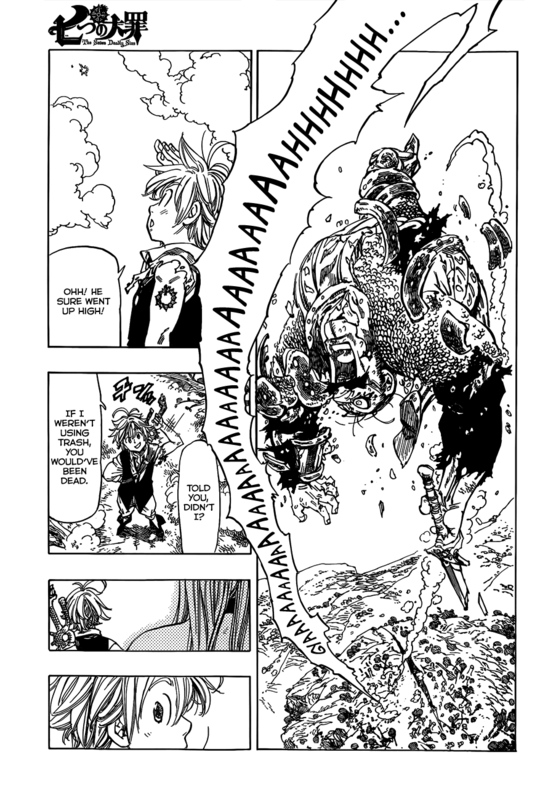 Dianne's Gideon can smash apart mountains, and lift large sections of land. 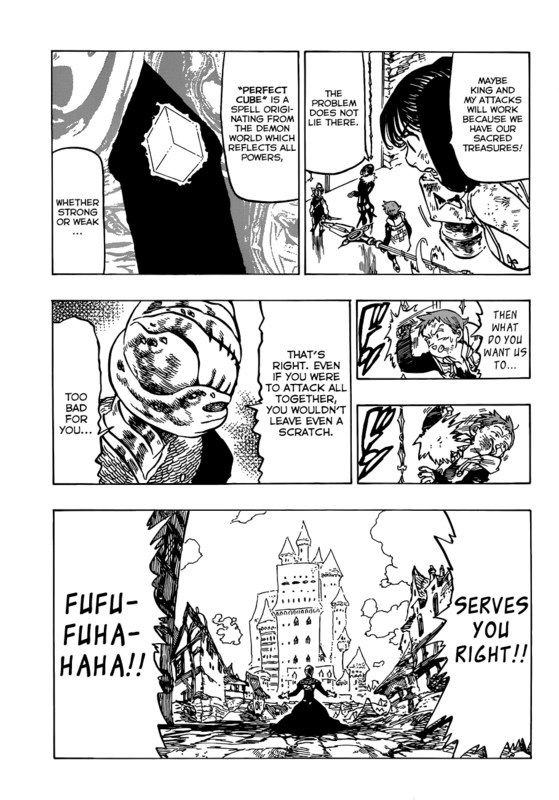 Demon Hendrickson could destroy a large castle (alternate angle another angle, last one). 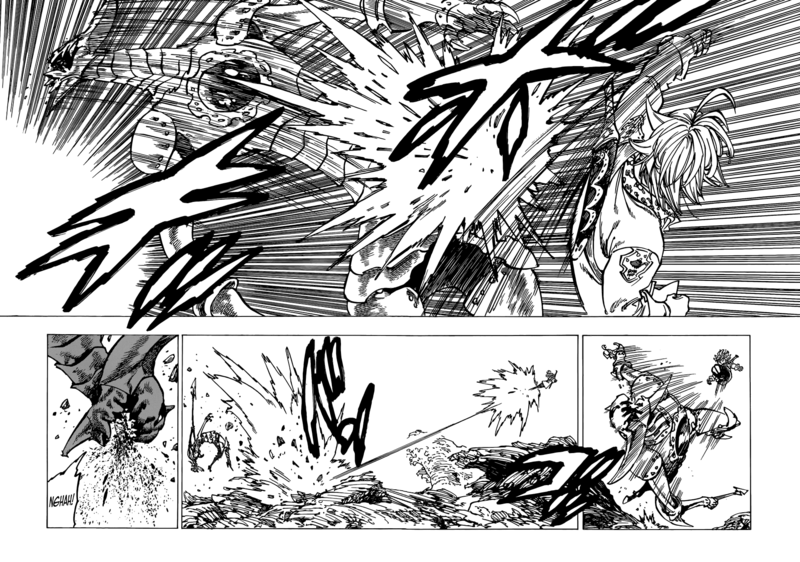 Grey Demon Hendrickson's hits were compared to Tremors. 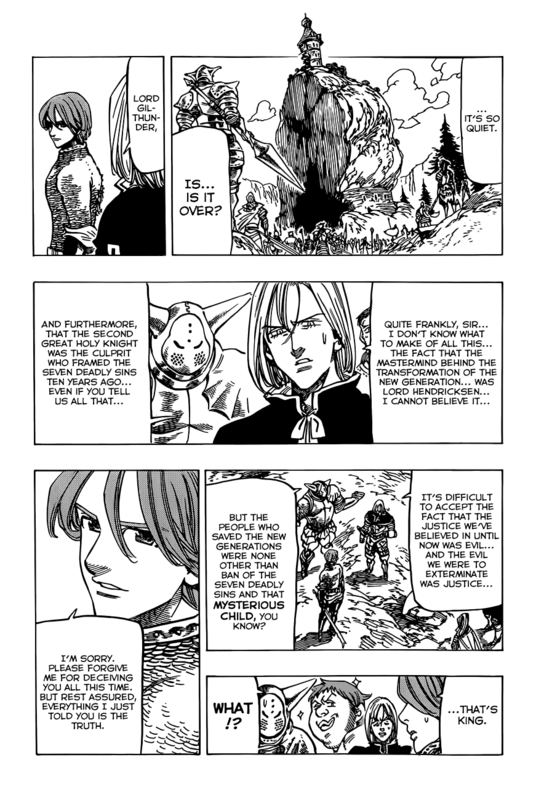 Galand moves hundreds of miles in a really short time. 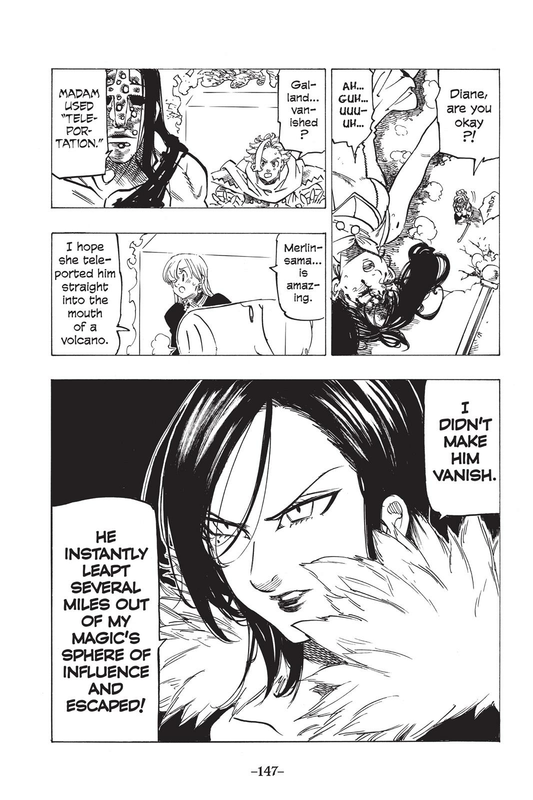 Galand moves several miles out of Merlin's range, which has been shown going to other areas with different climates. 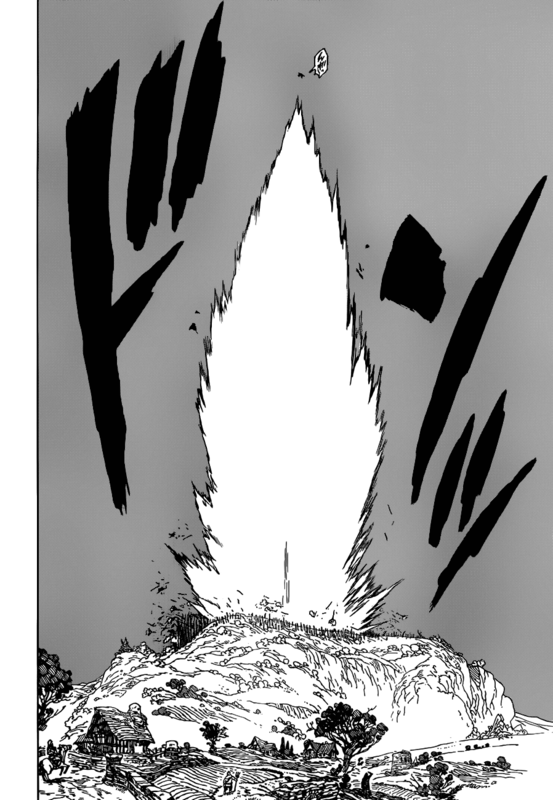 Monspeet's Flame Bird moves hundreds of miles in seconds. 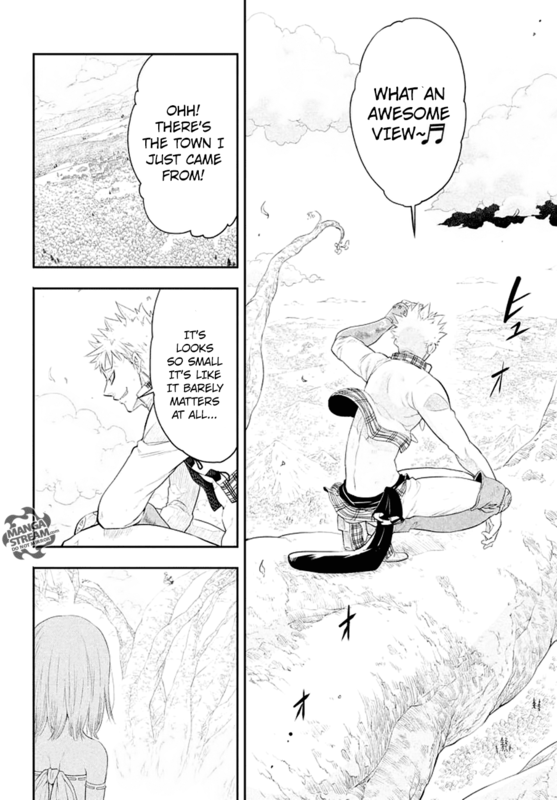 Galand chops the ground in half for kilometers judging by the city in the shot. 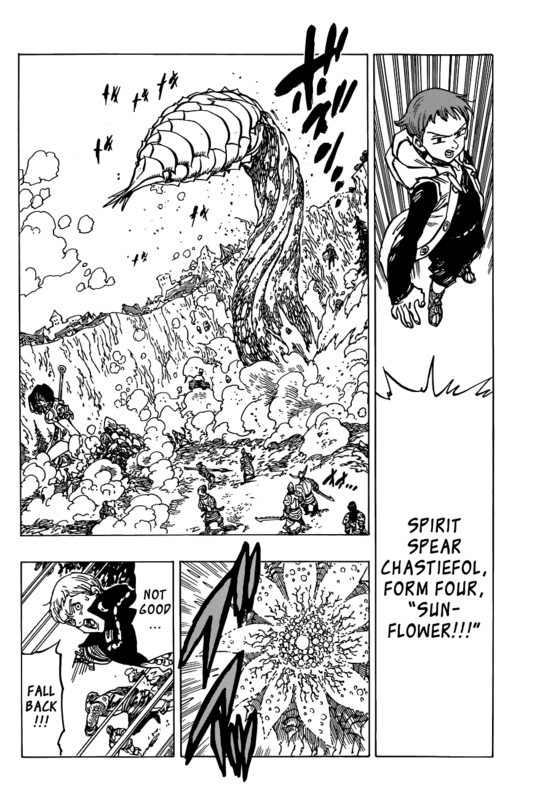 Gloxinia's explosion dwarfs a hill. 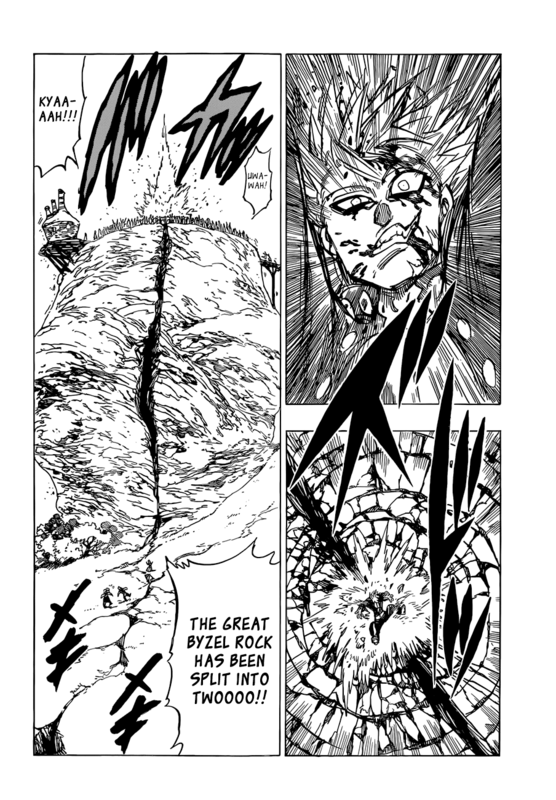 Just the after effect of hitting Meliodas with Gigafall covers the radius of Liones to Edinburgh (186 miles). 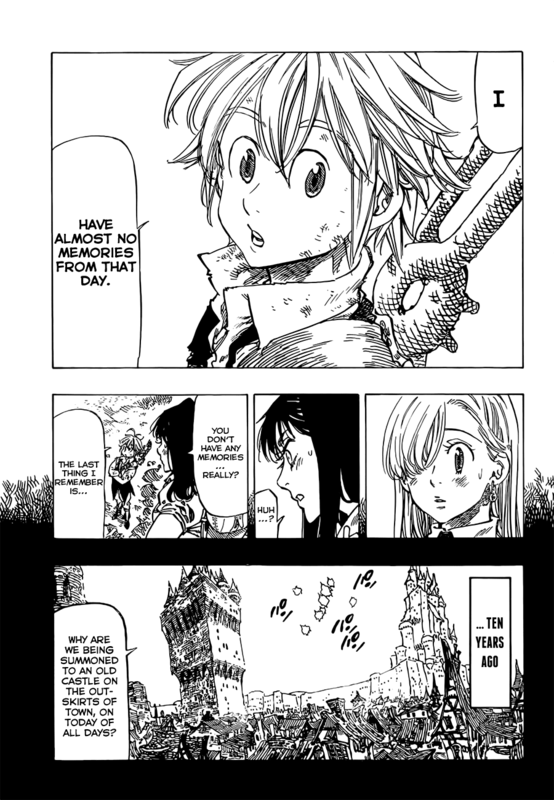 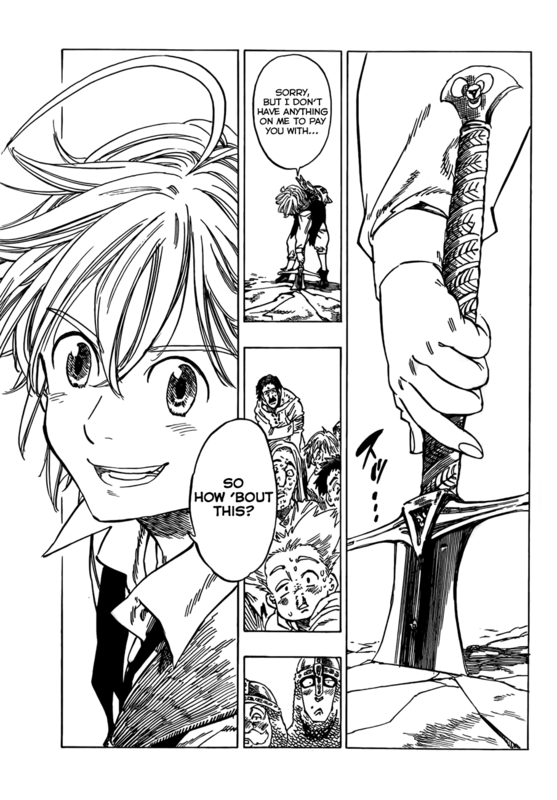 Meliodas never really wielded a true sword because he didn't need to. 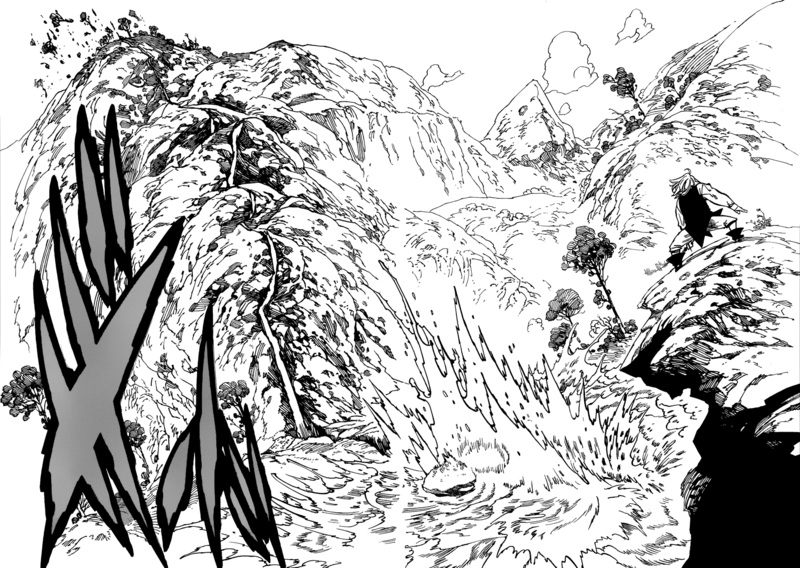 Destroys a forrest just by swinging his broken sword, it also splits the hill in half, and launches Twigo. 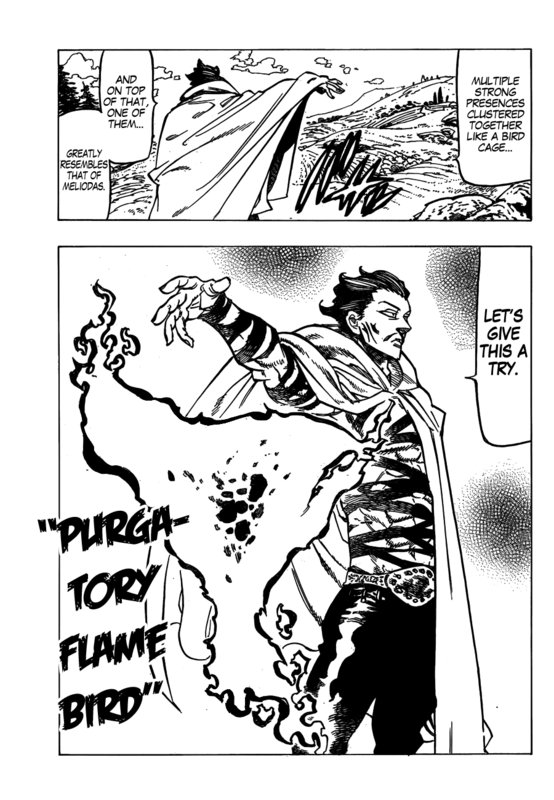 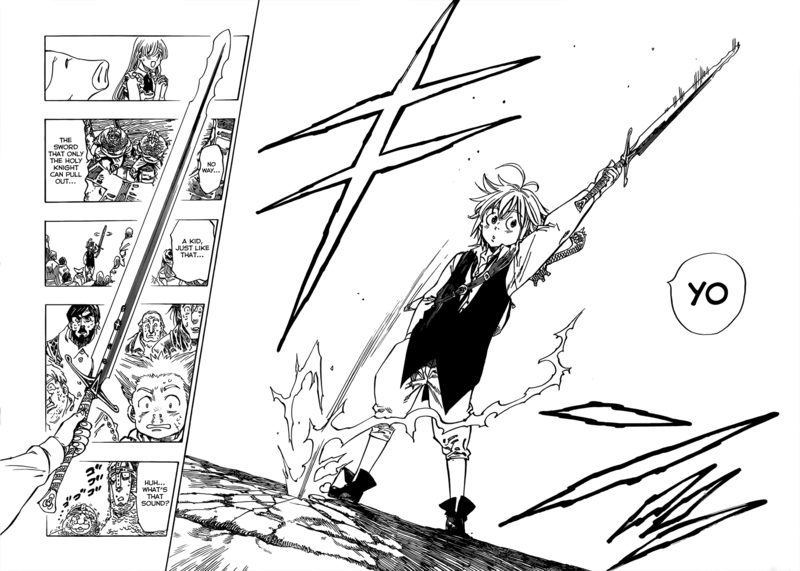 Effortlessly pulls out Gilthunder's sword with a single hand, which entire villages of people failed to even budge. 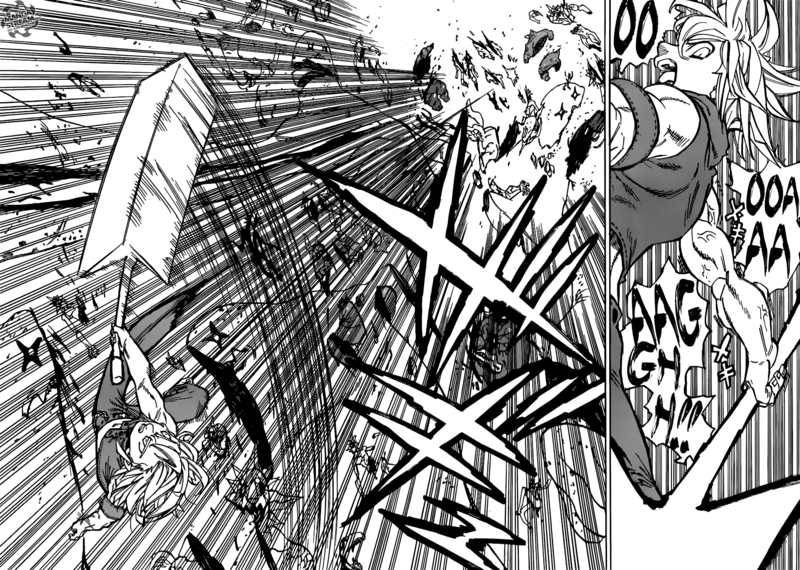 Manages to catch Gilthunder's lightning amped spear with one hand, , which destroys a large portion of a Village. 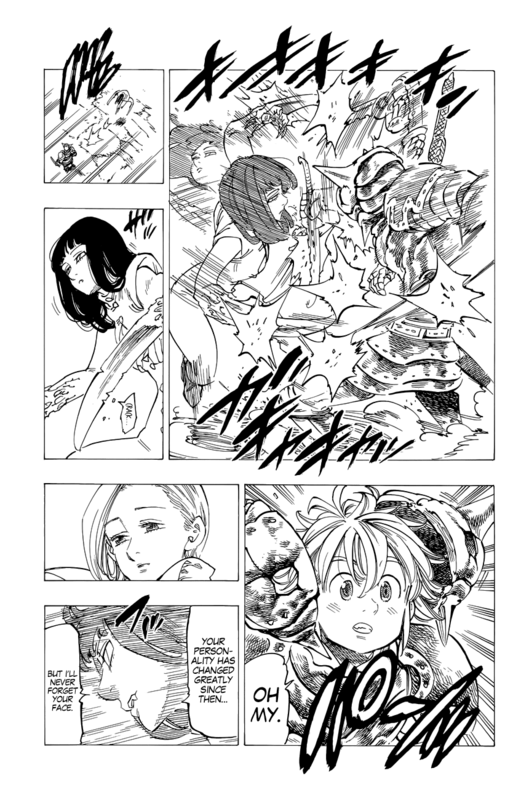 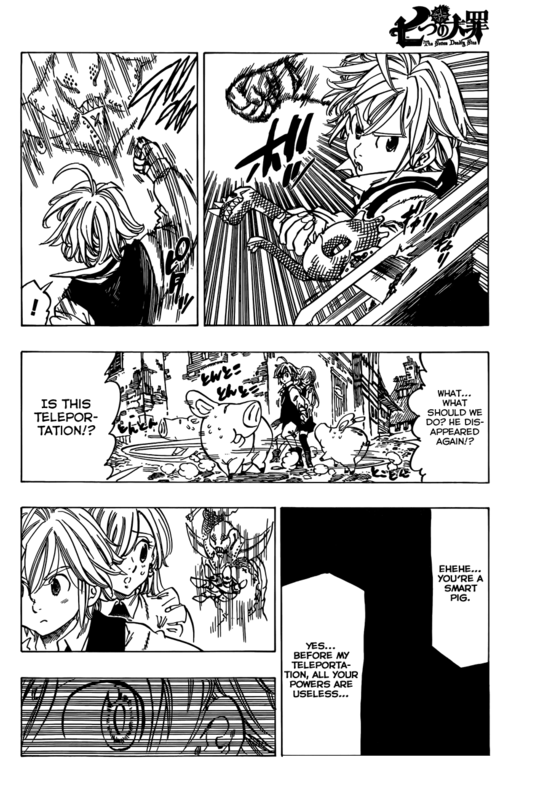 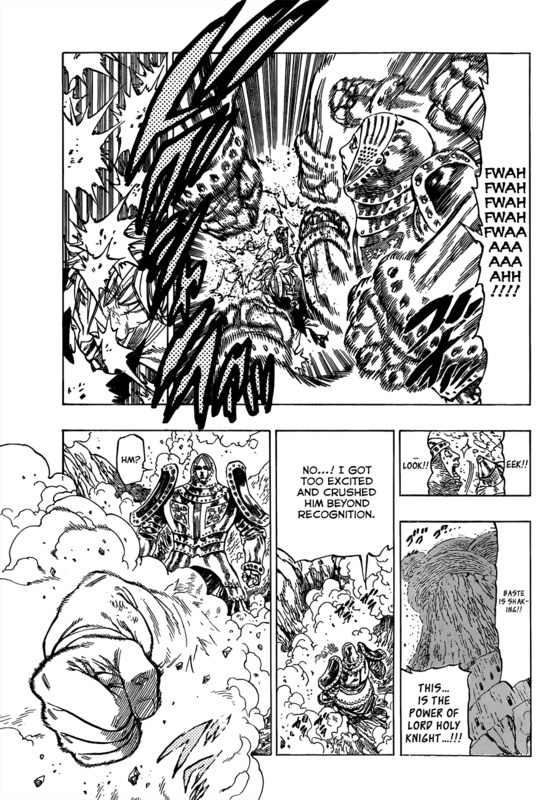 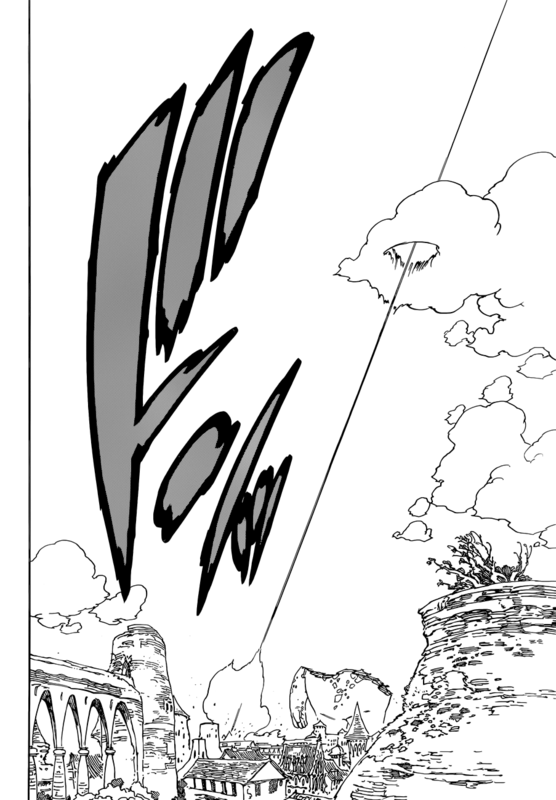 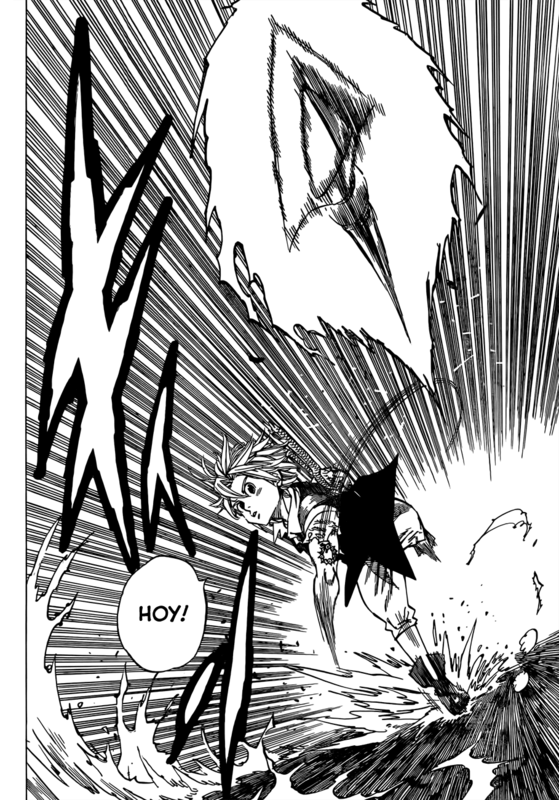 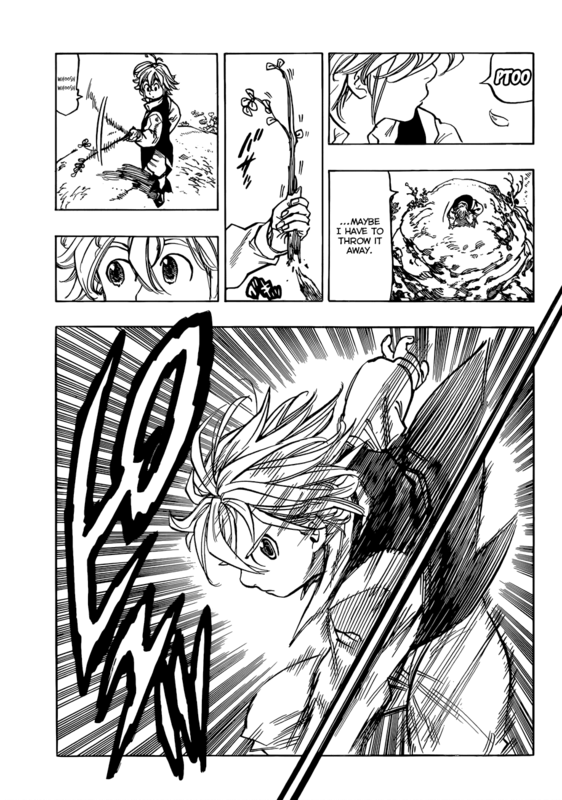 Meliodas throws Glithunder's spear back at extremely high speed, demolishing a tower. 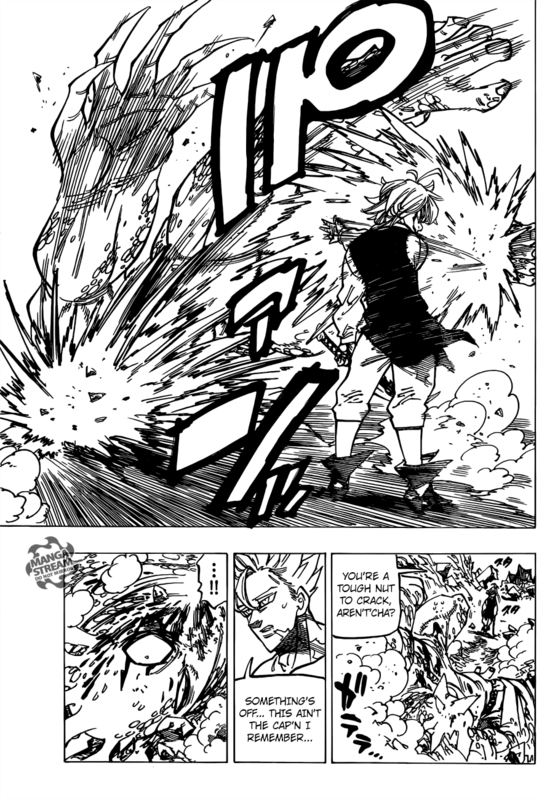 Casually breaks out of Gilthunder's lightning restraints. 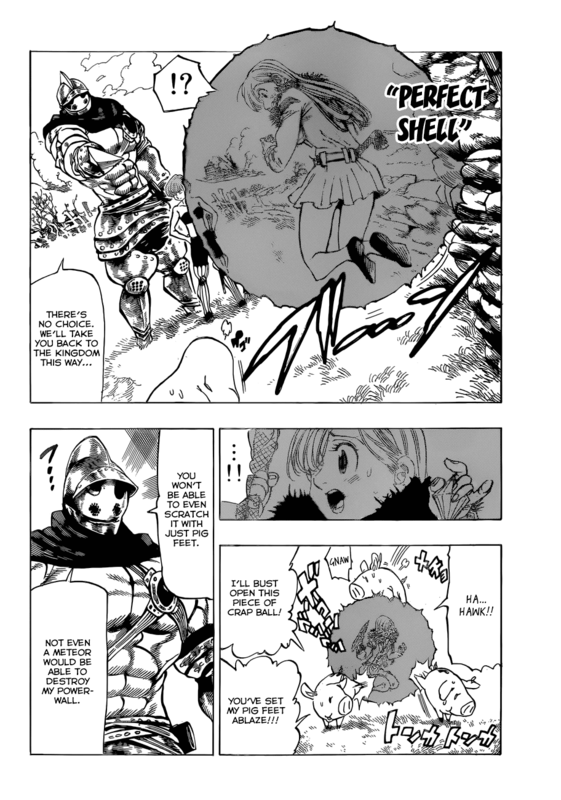 Manages to fight and stagger Giant Dianne. 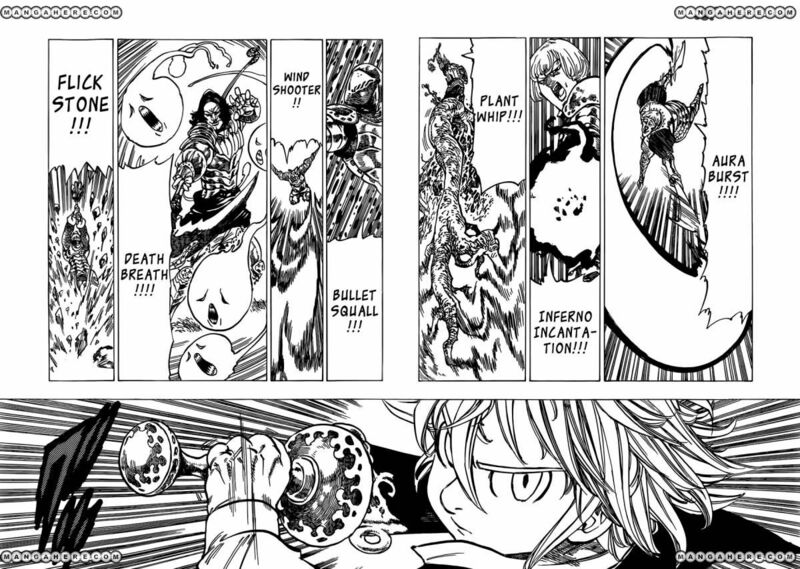 One shot, but didn't kill, Ruin, who has a body more durable than steel. 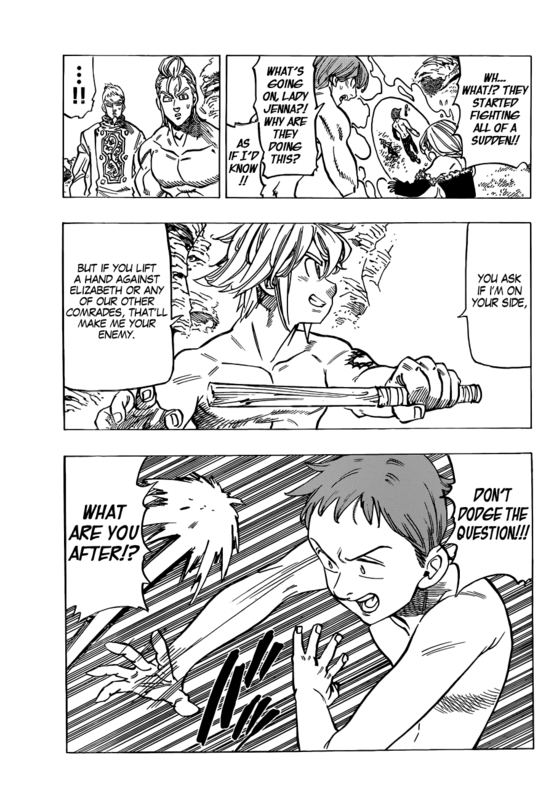 Destroys Baste Dungeon with a casual arm wrestle, which was unaffected by 10 Town Level Dragons, and is quite big. 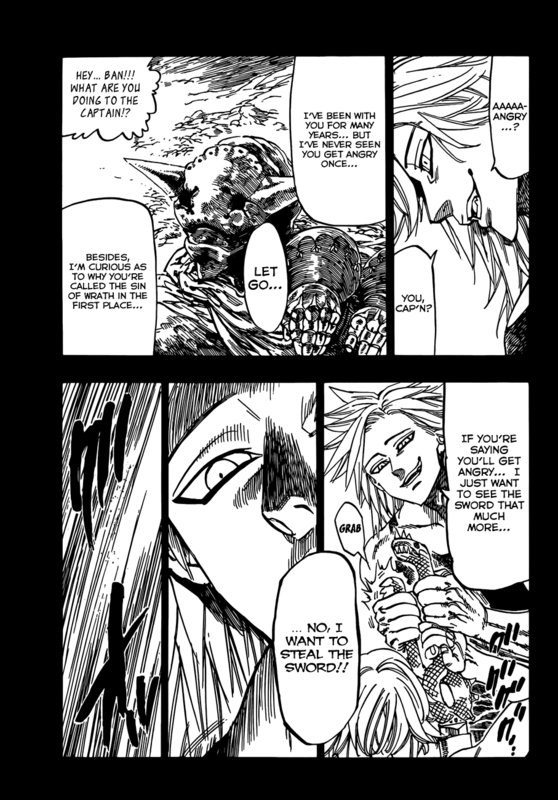 Swaps hands with Gulia even when not using his sword, also displays comparable swordsmanship with his broken sword. 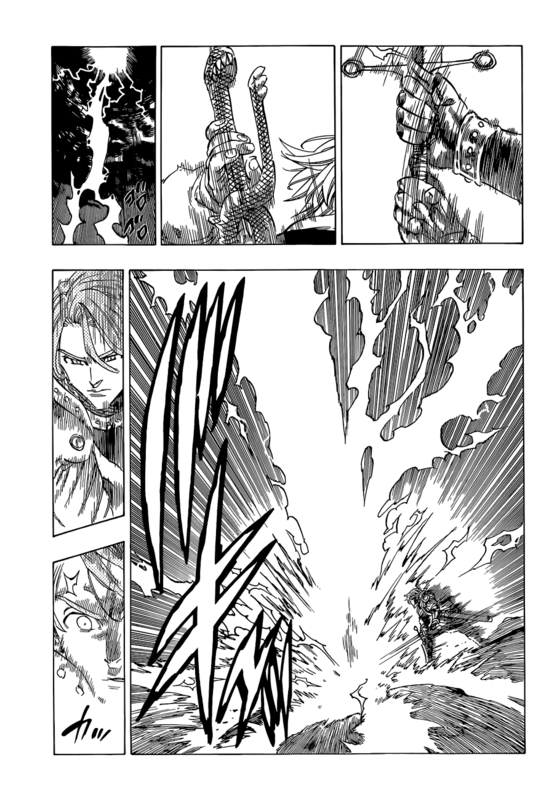 Has the strength advantage against Ban, and shows it in his fight against him. 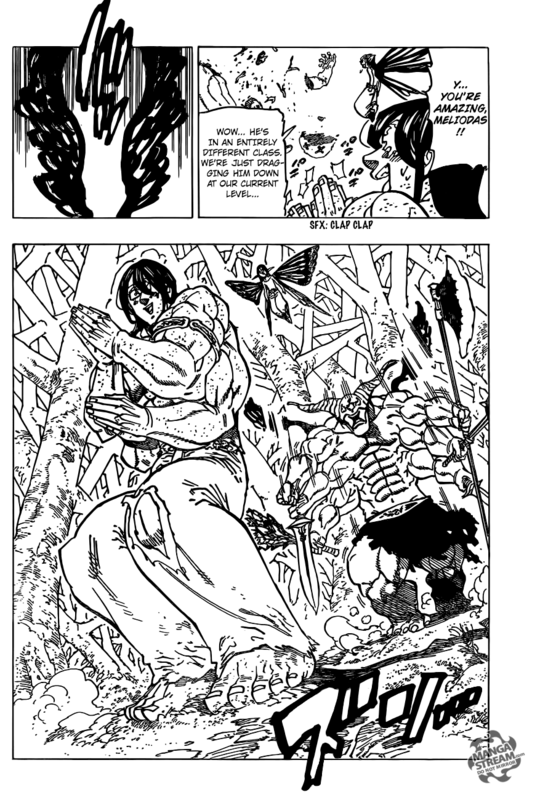 Splits Byzel Rock in two by punching Ban into it. 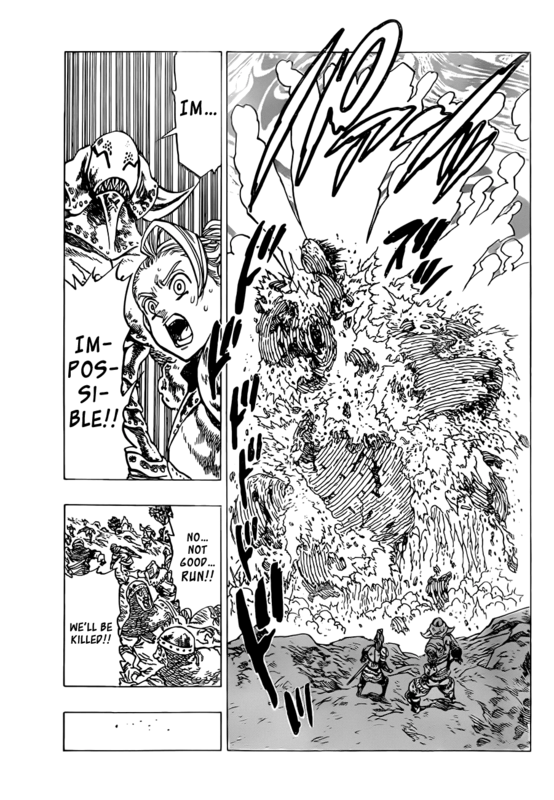 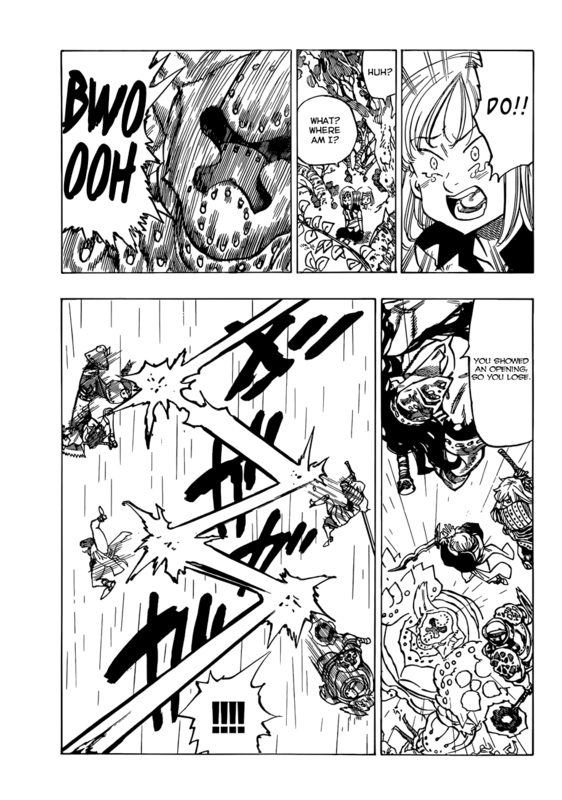 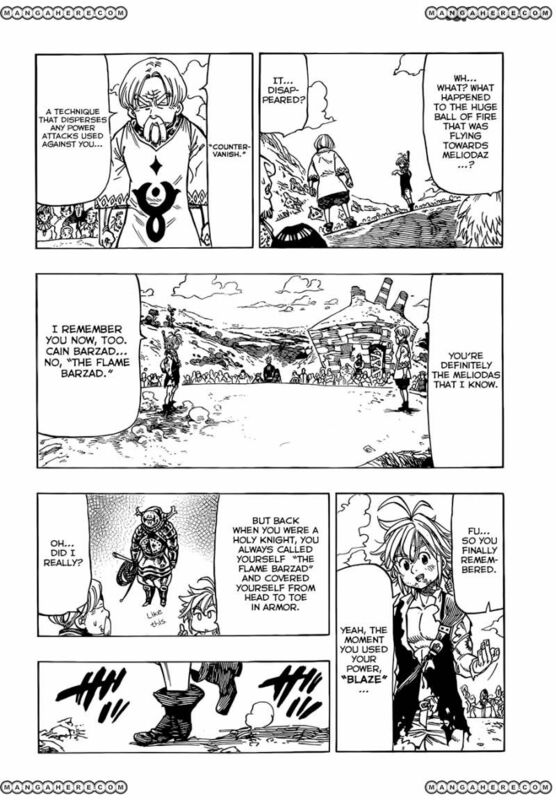 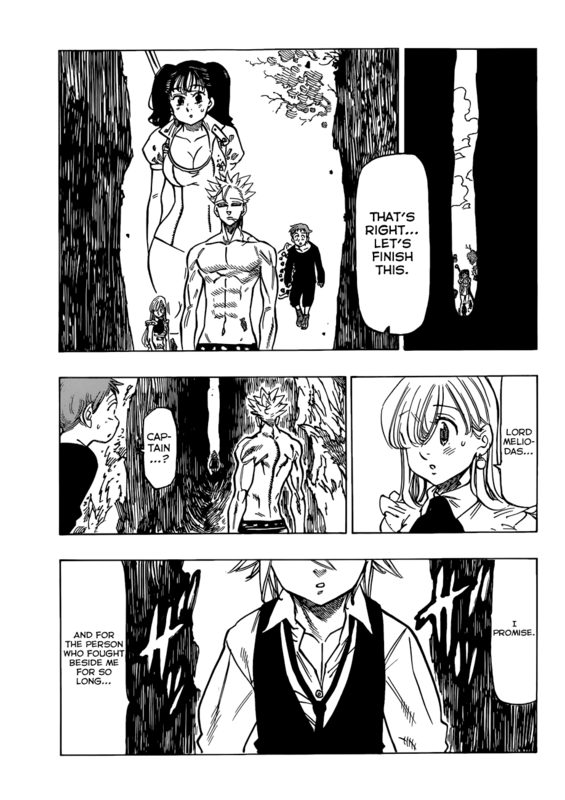 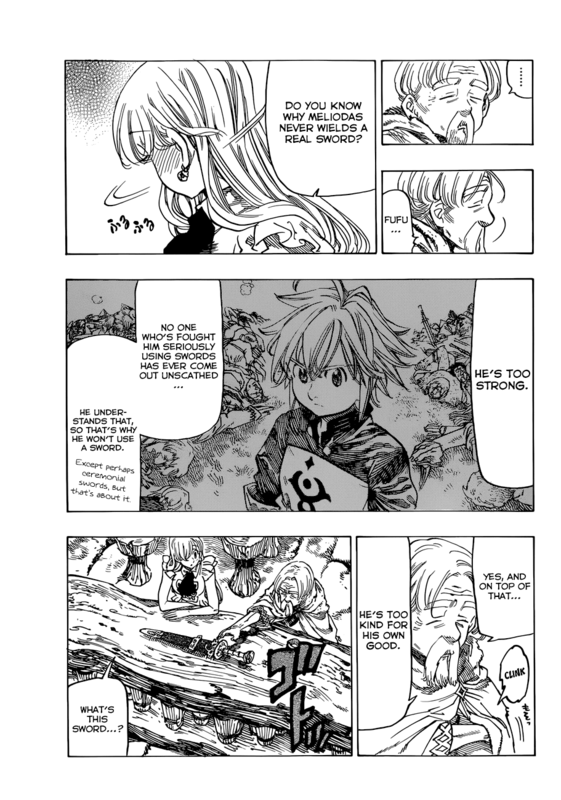 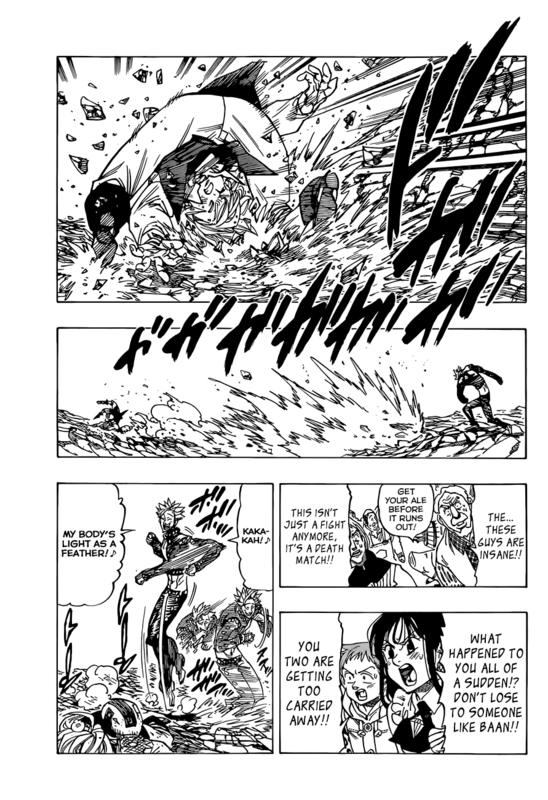 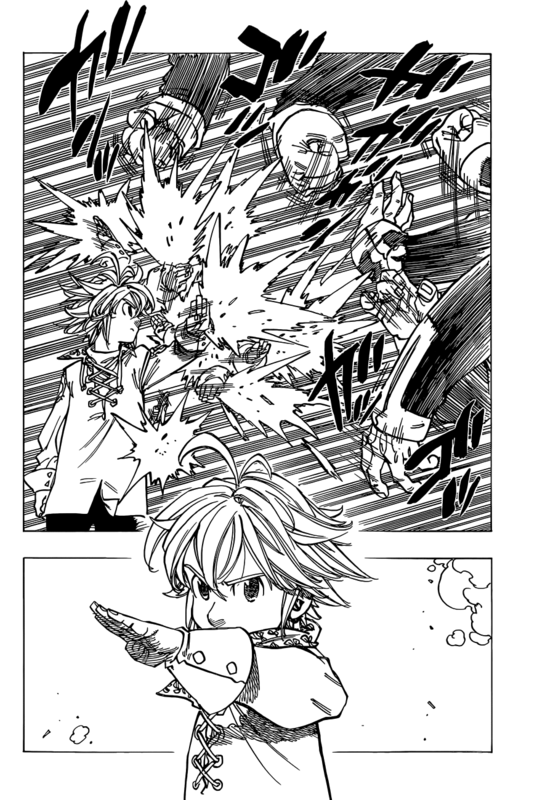 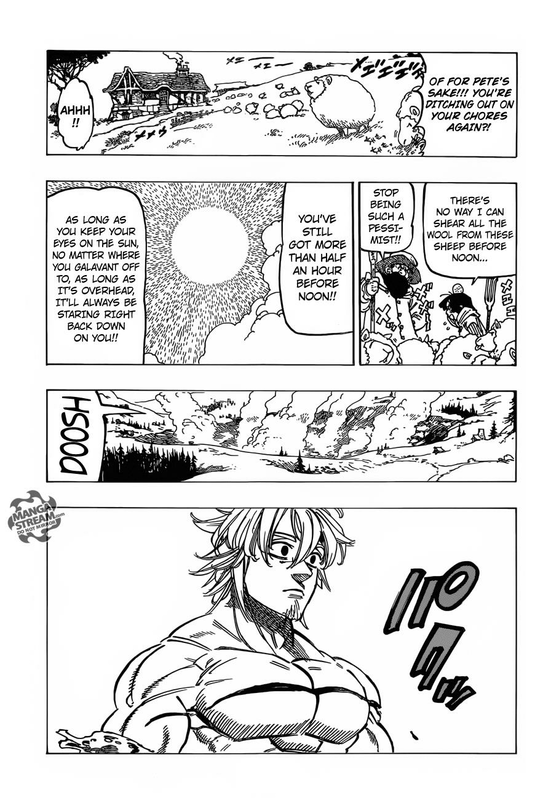 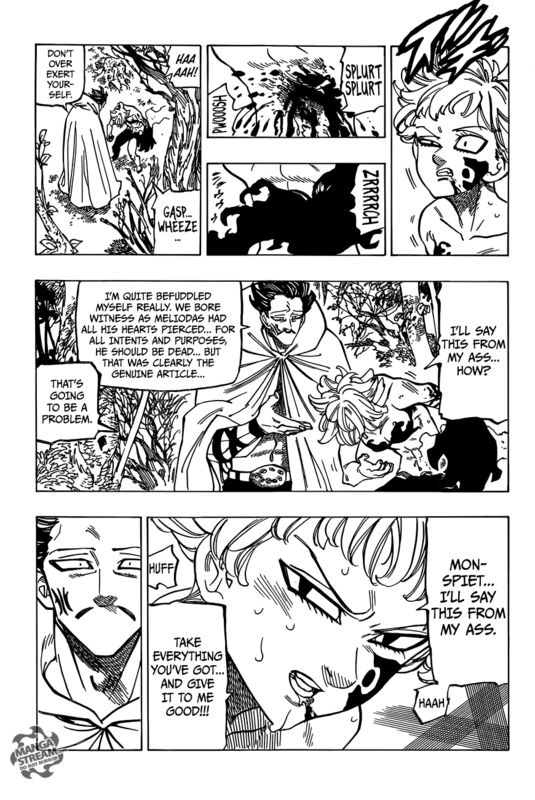 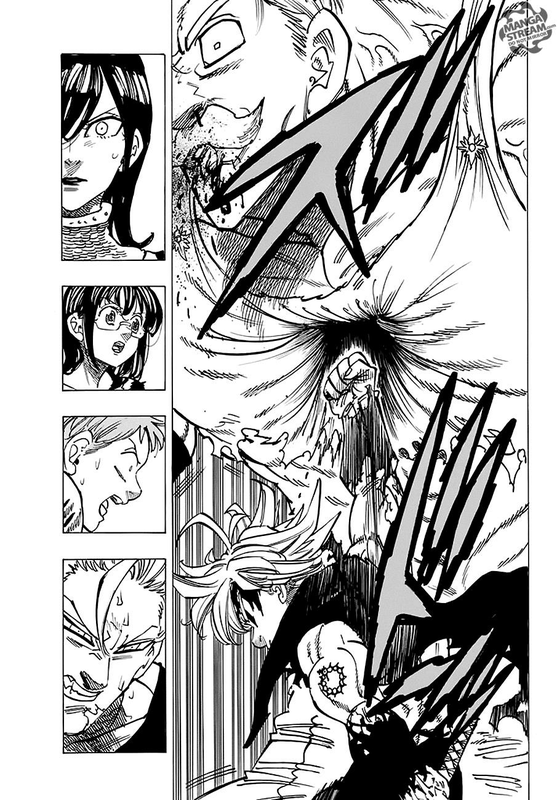 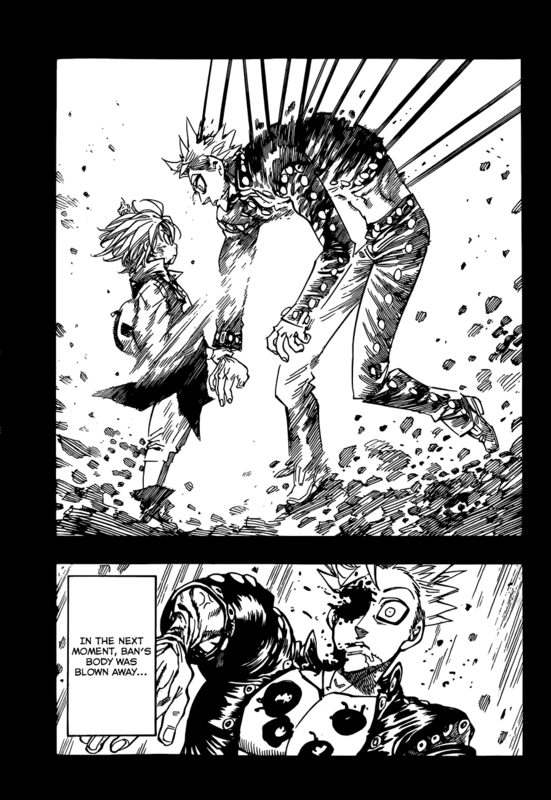 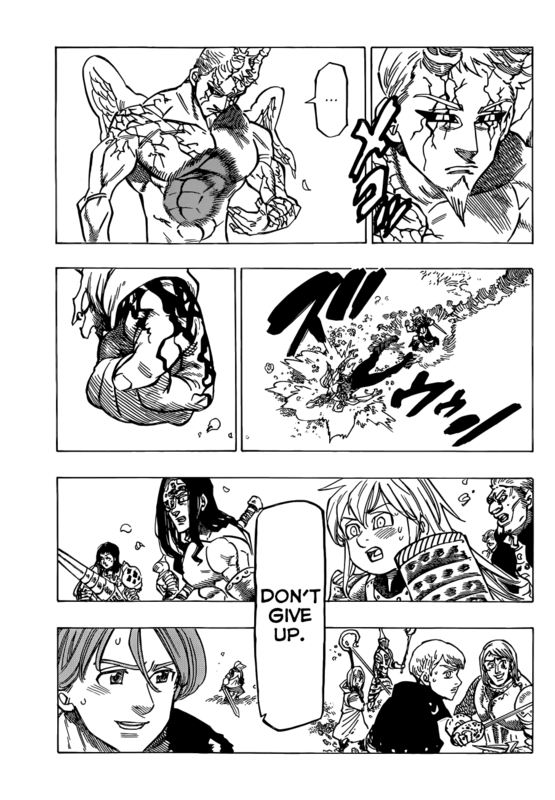 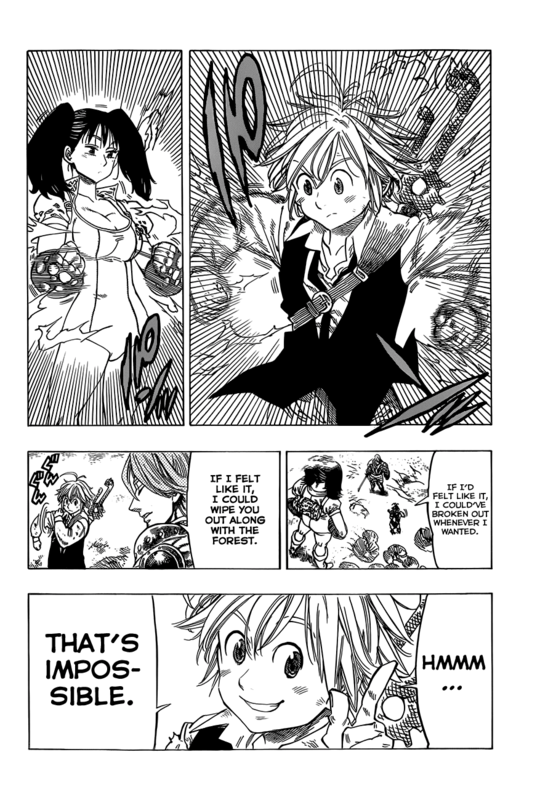 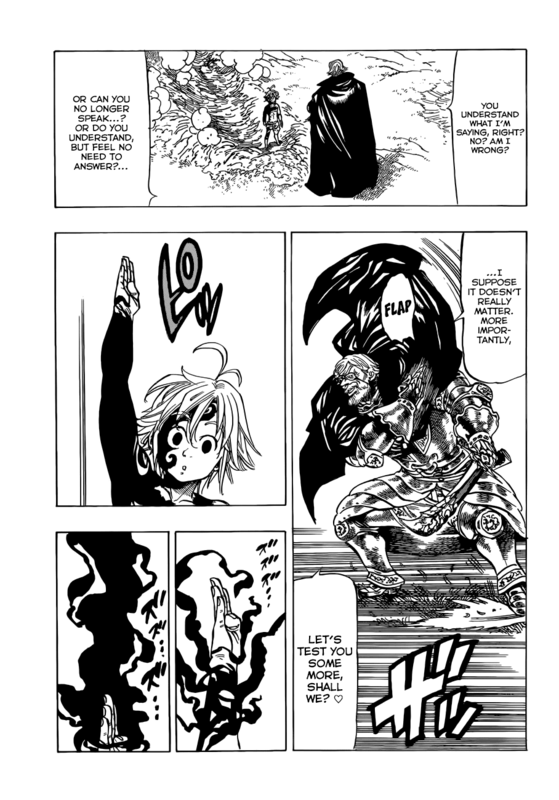 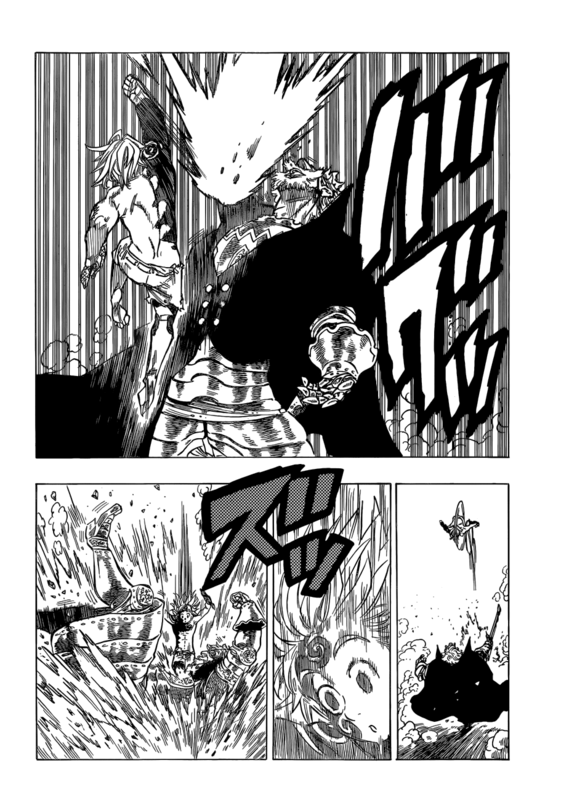 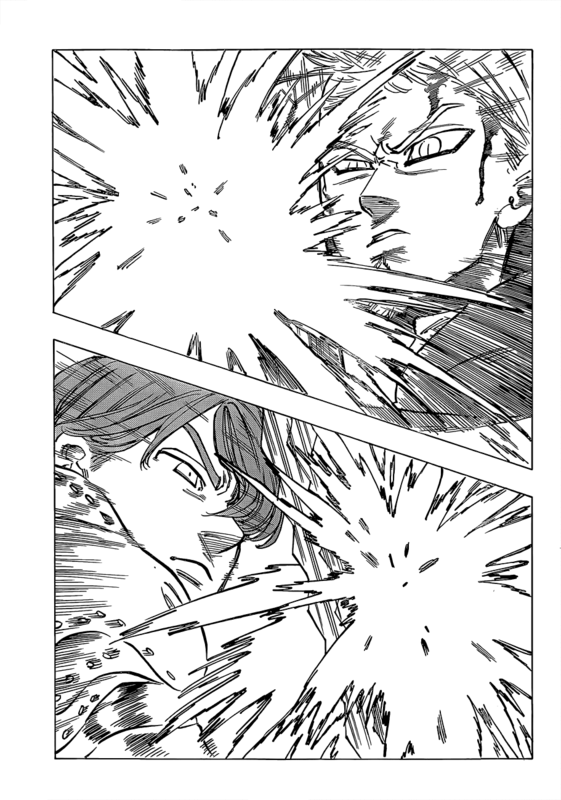 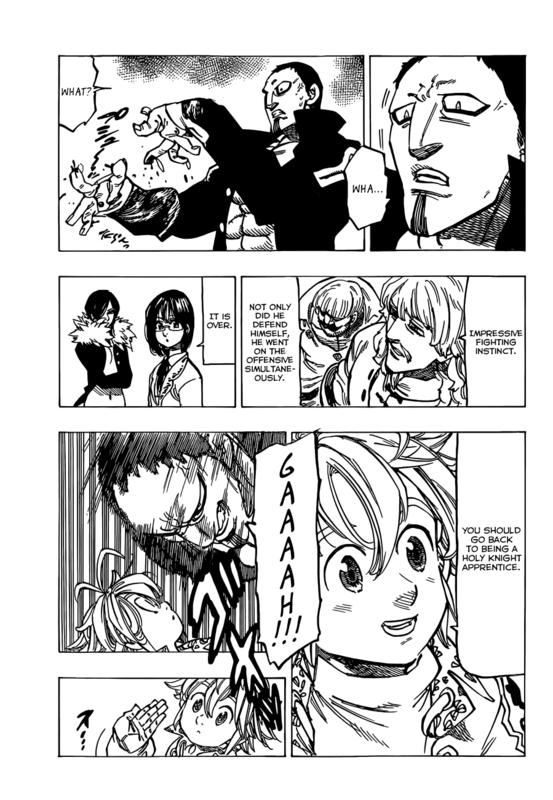 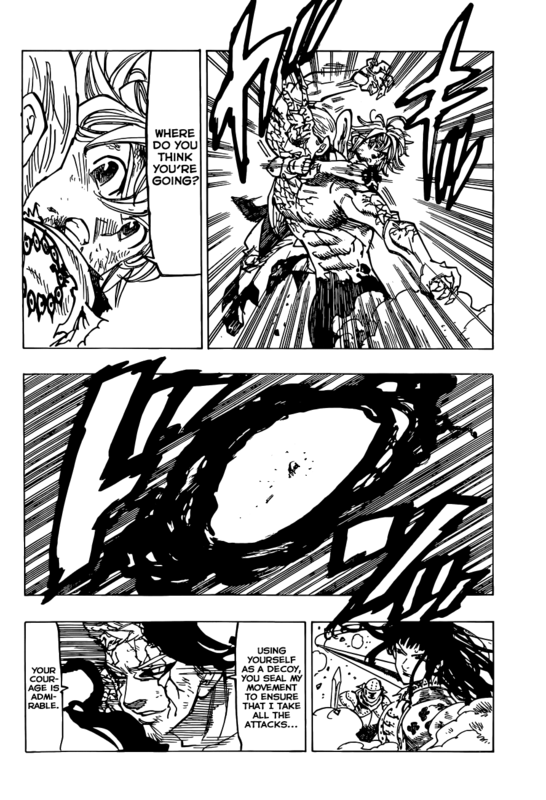 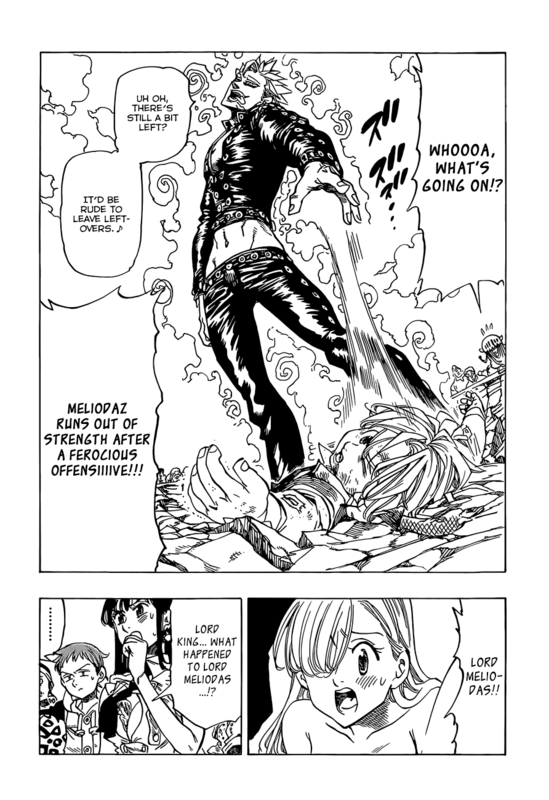 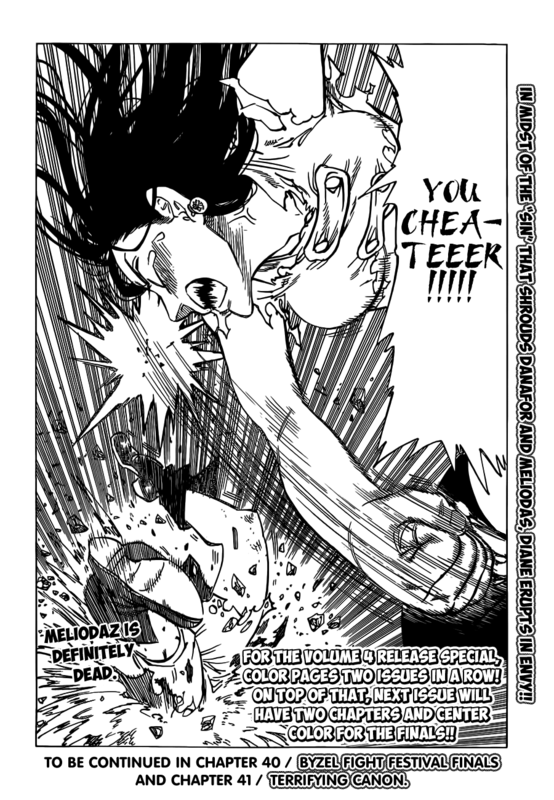 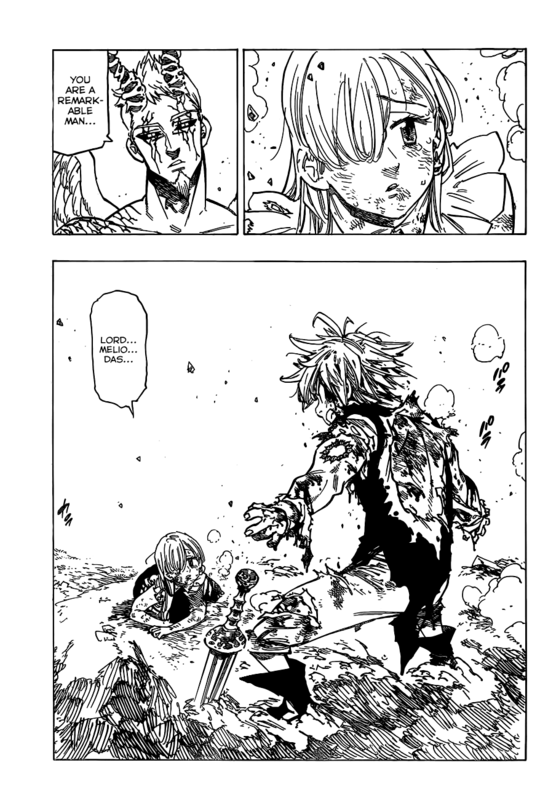 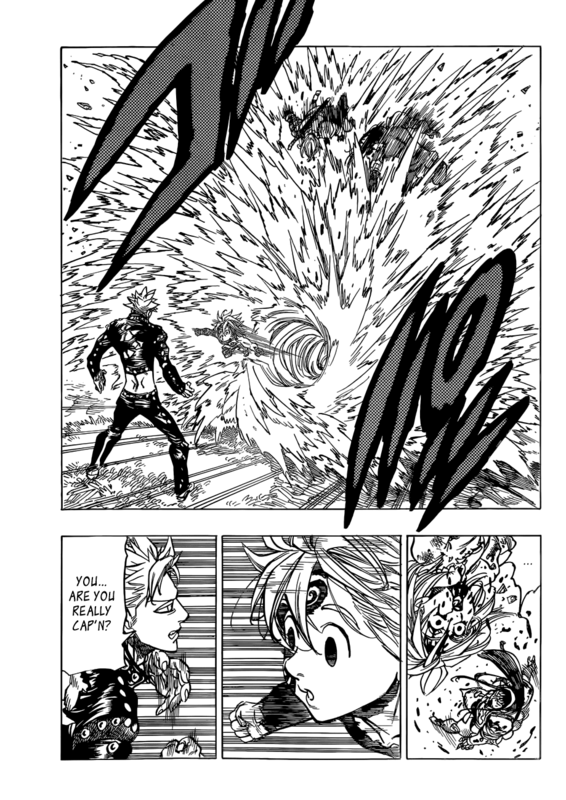 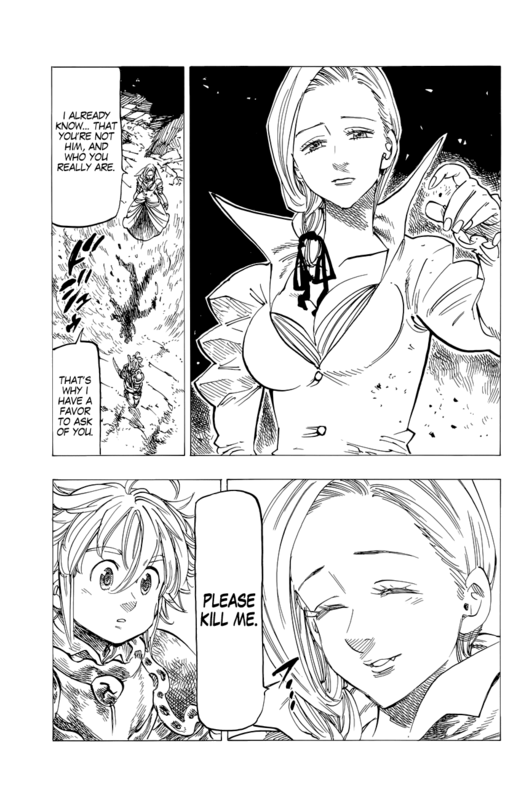 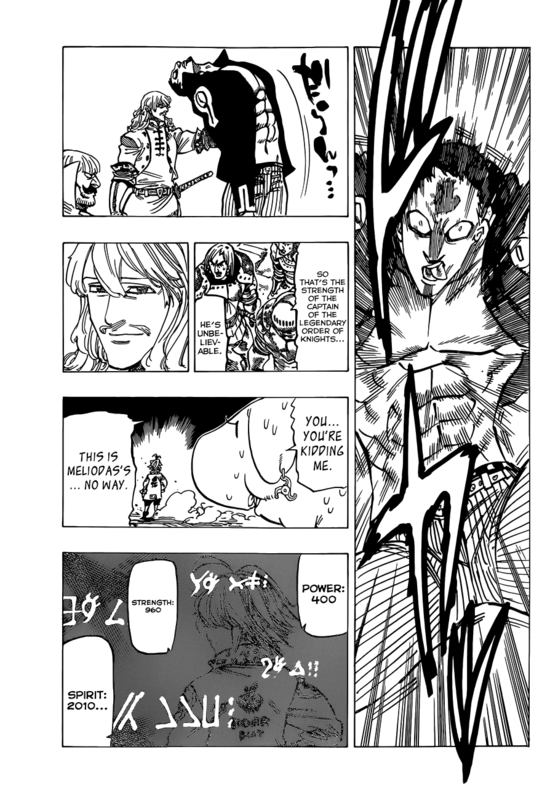 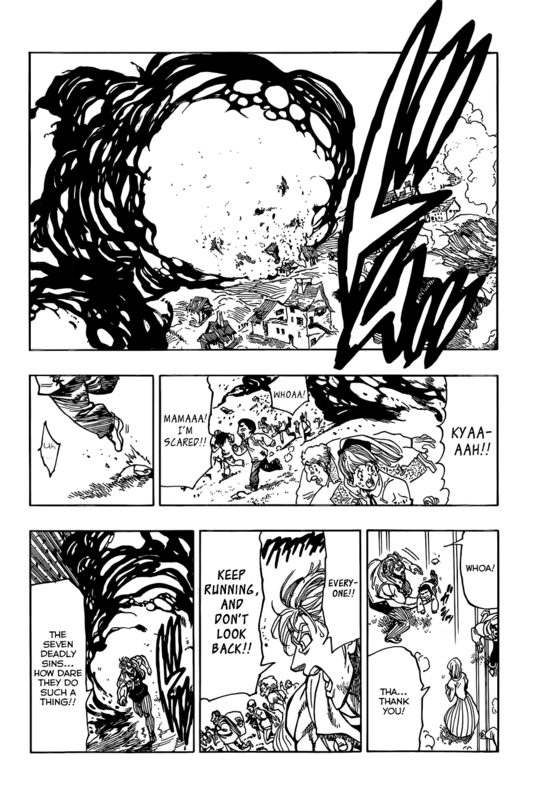 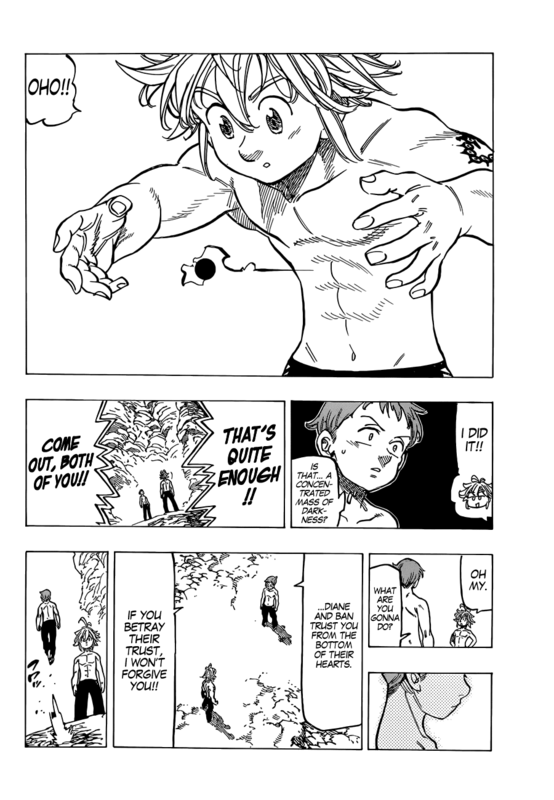 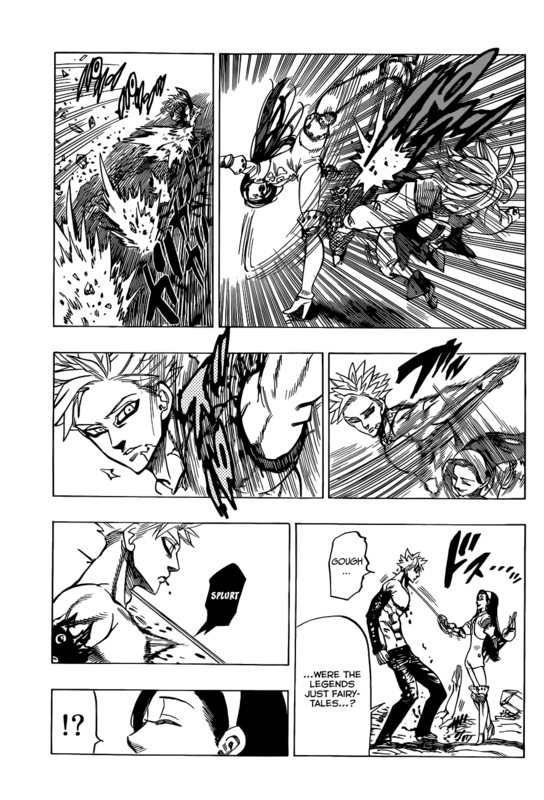 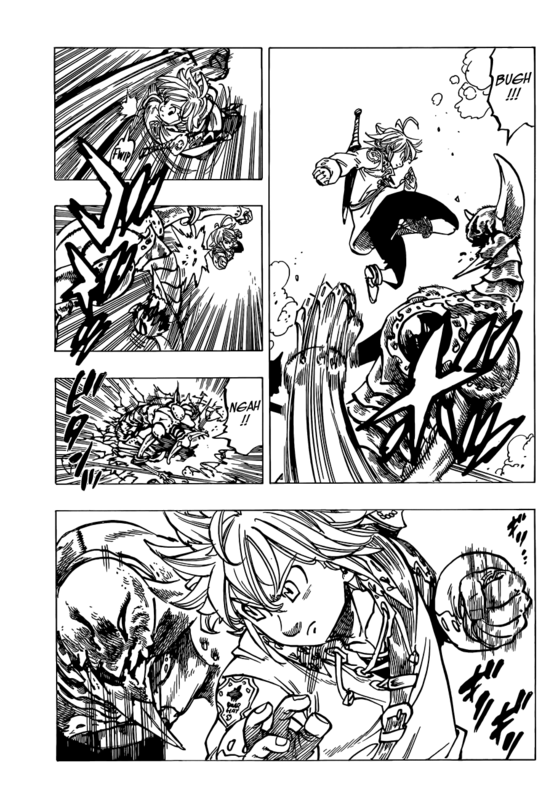 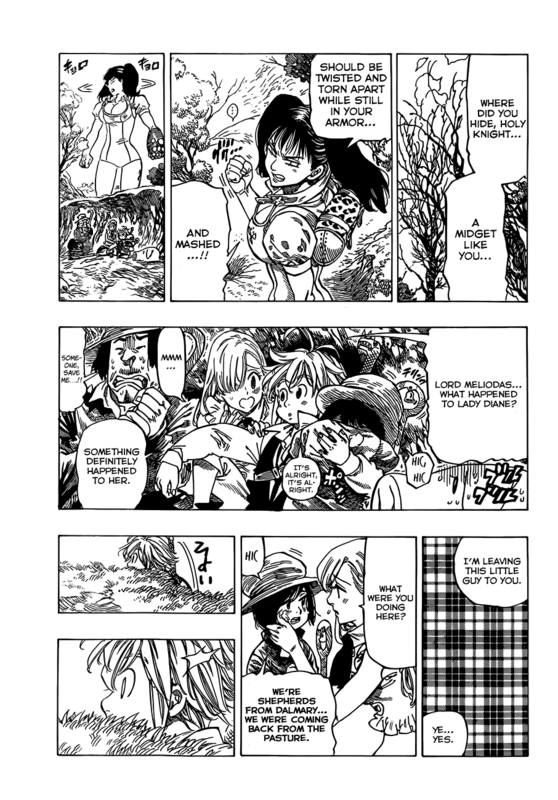 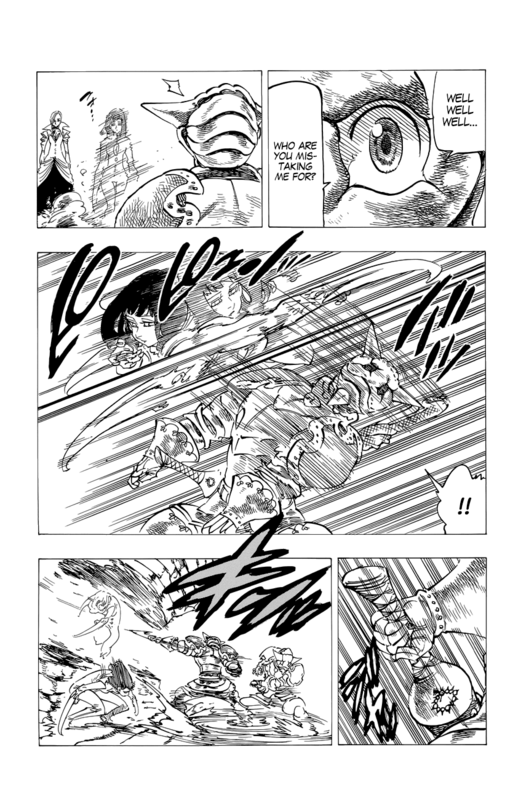 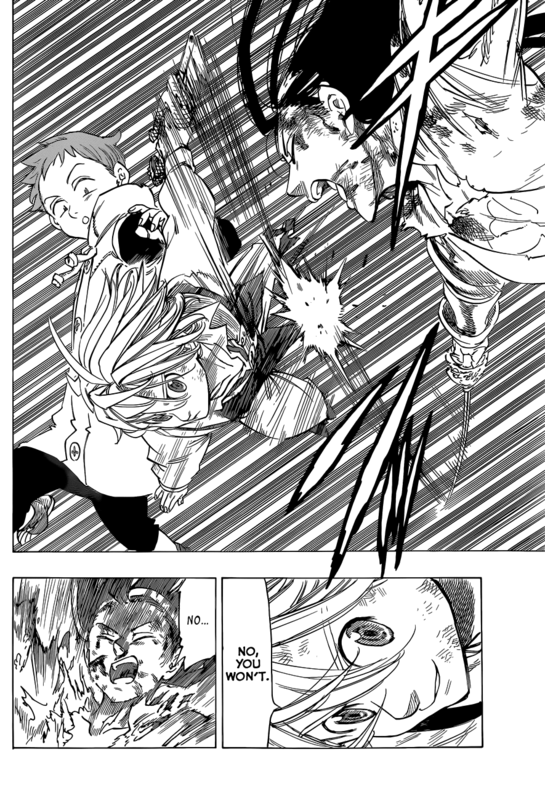 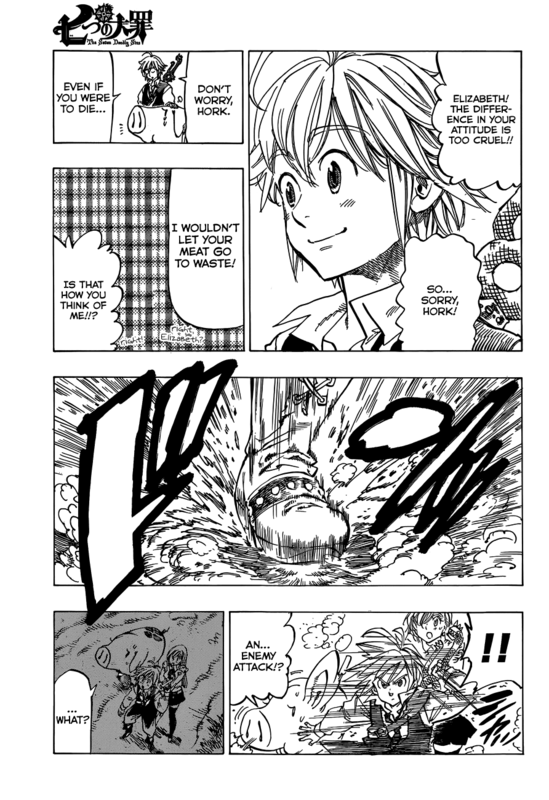 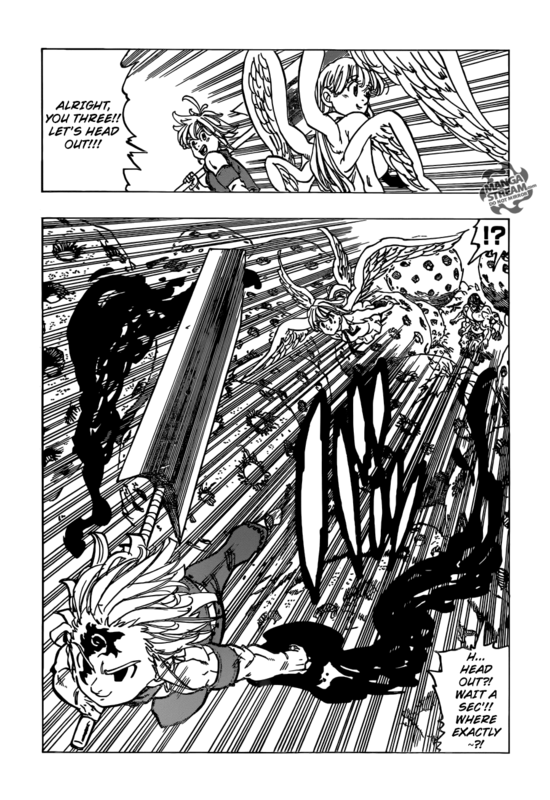 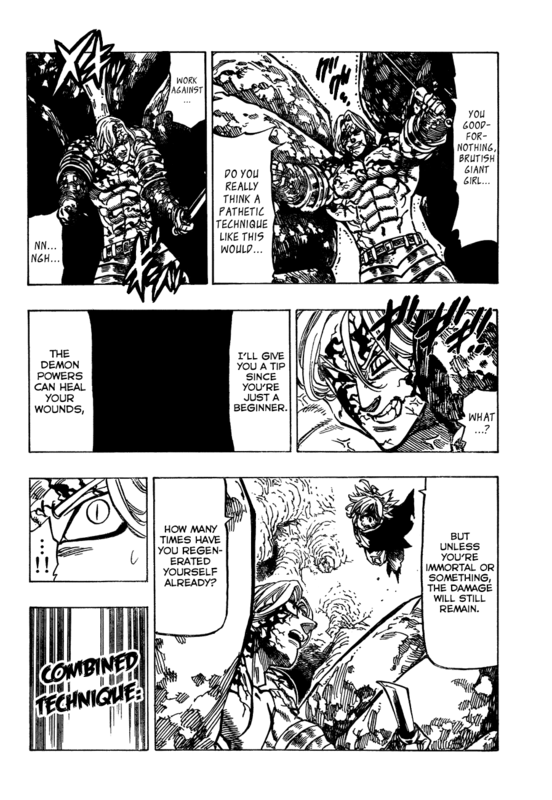 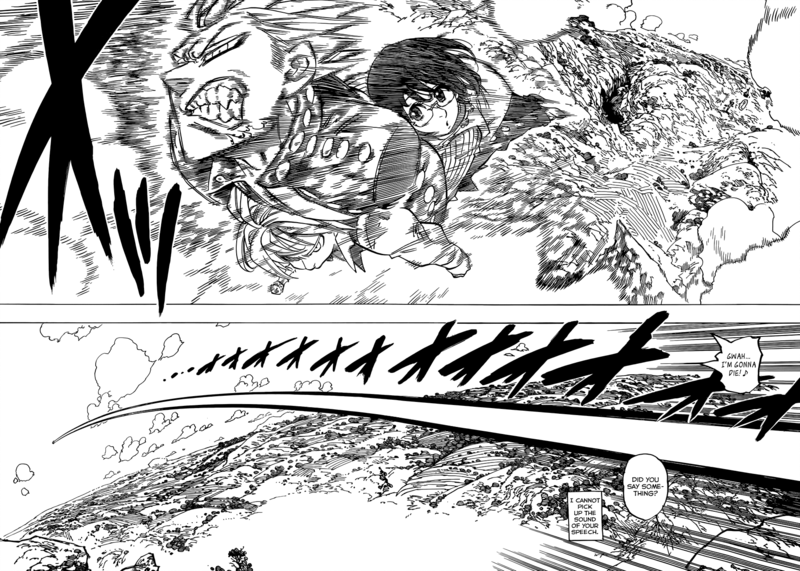 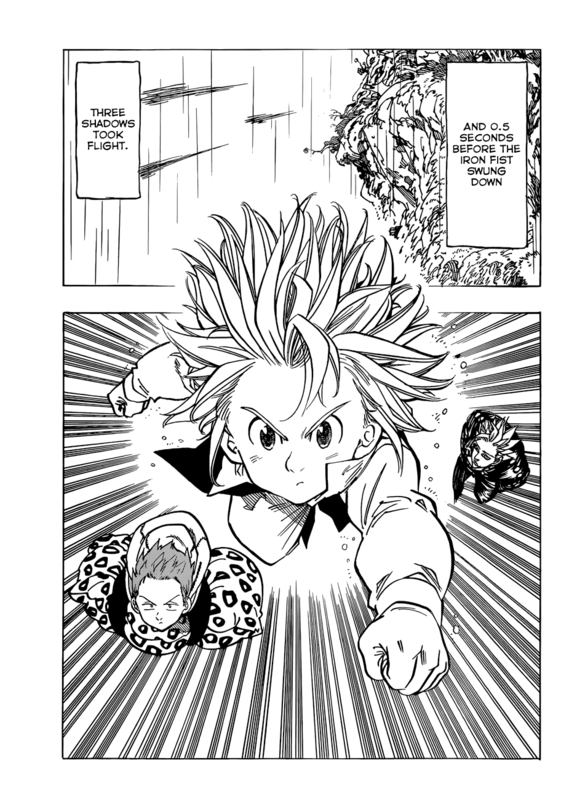 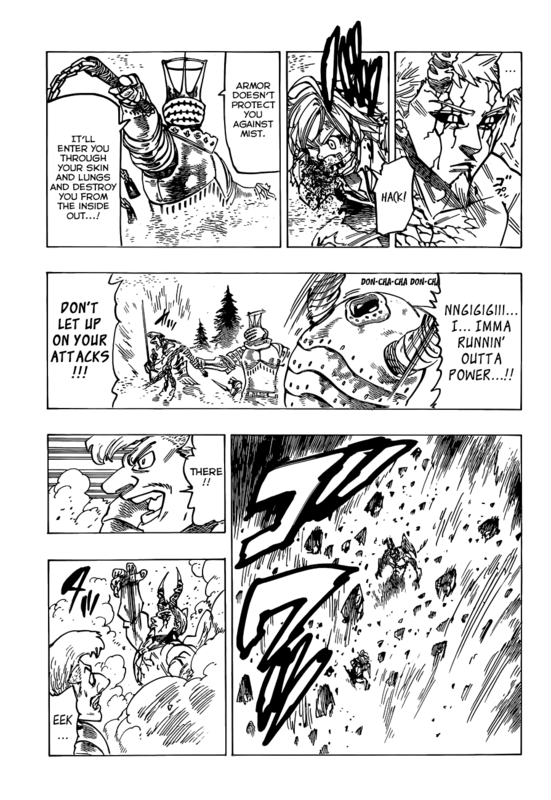 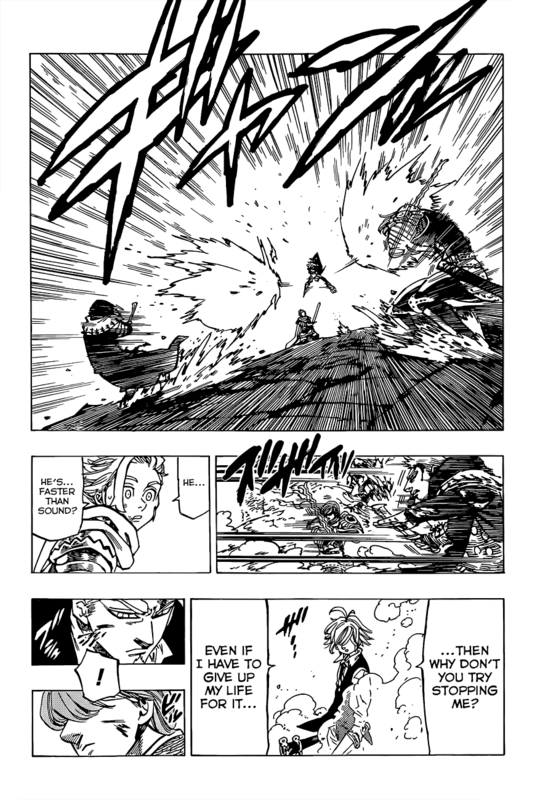 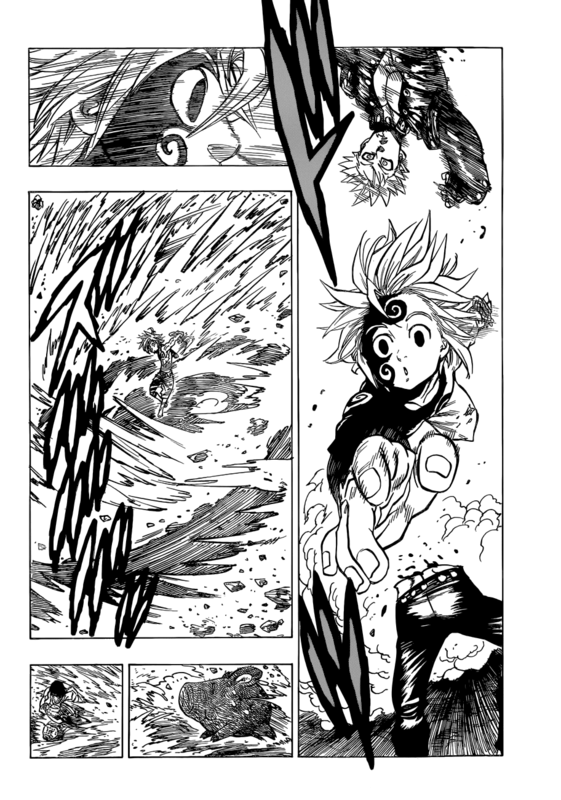 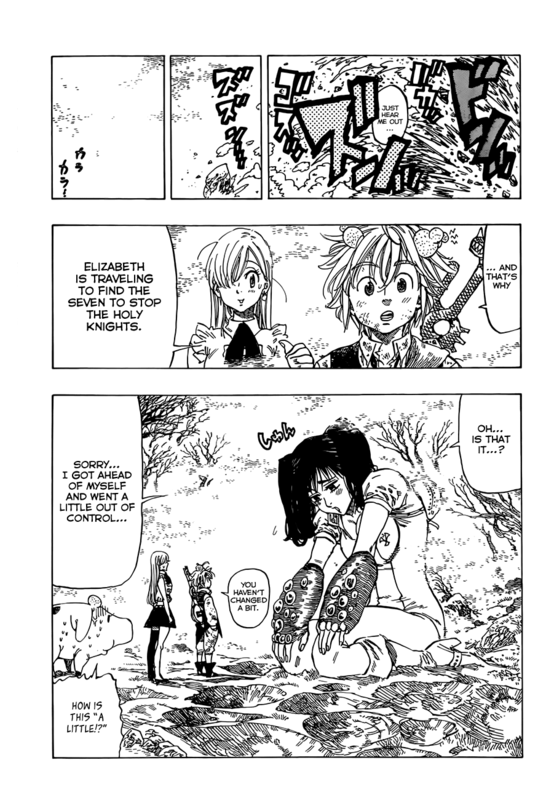 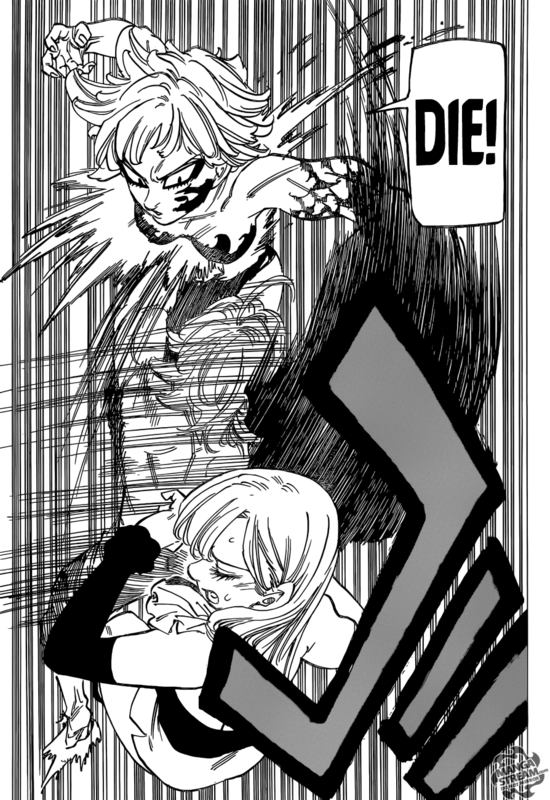 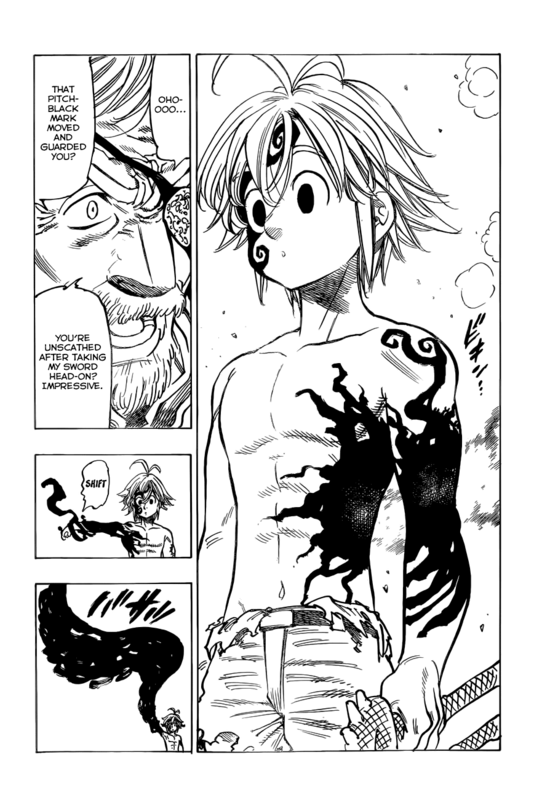 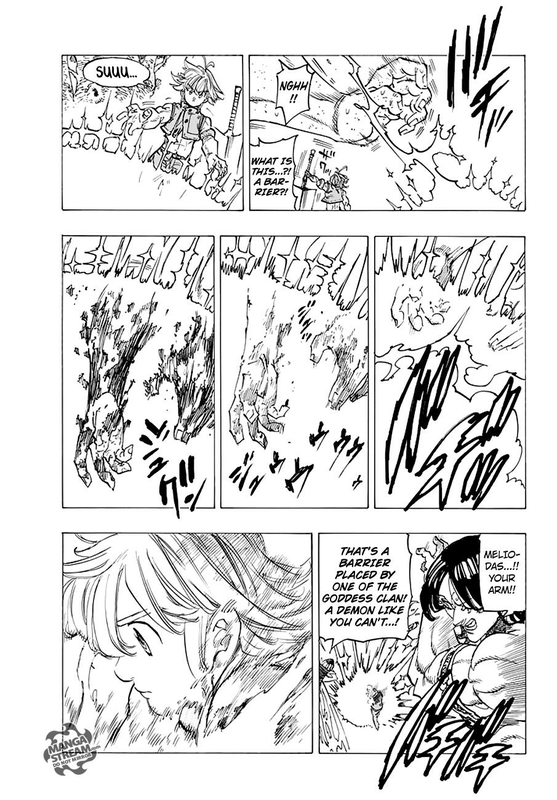 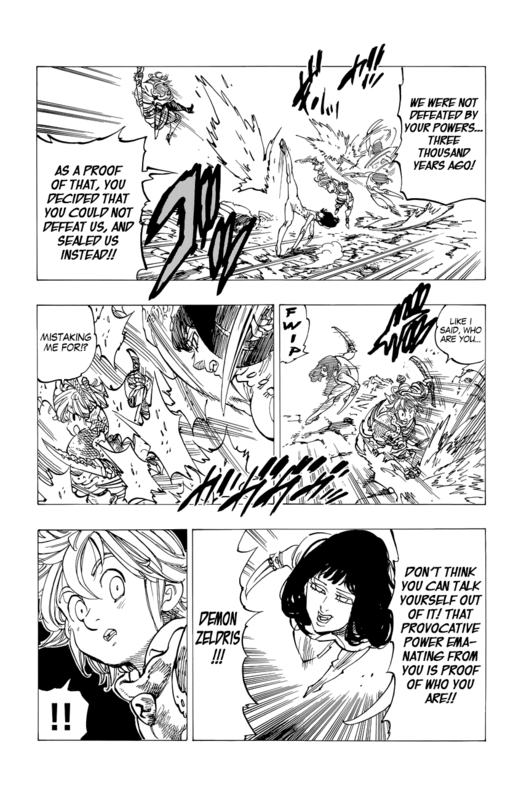 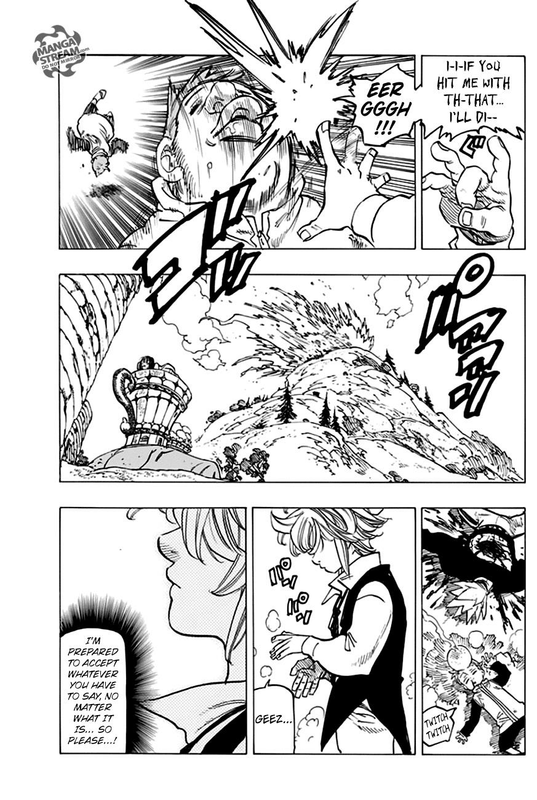 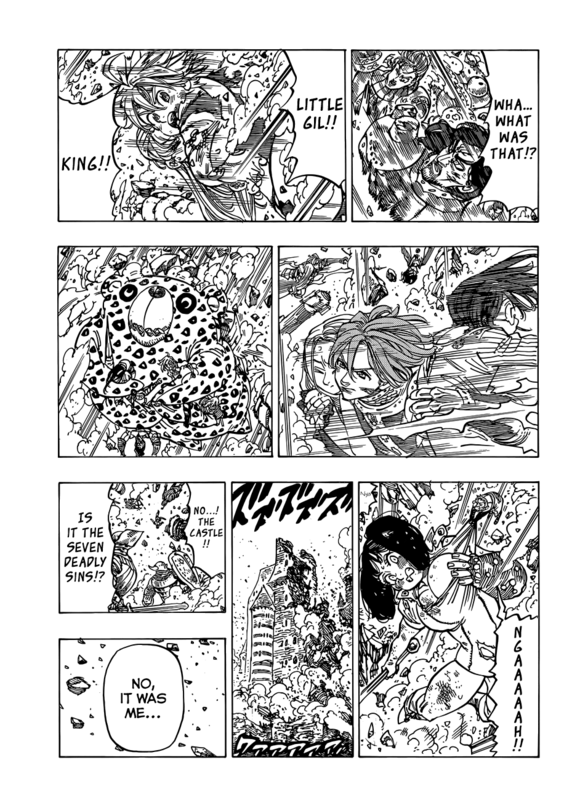 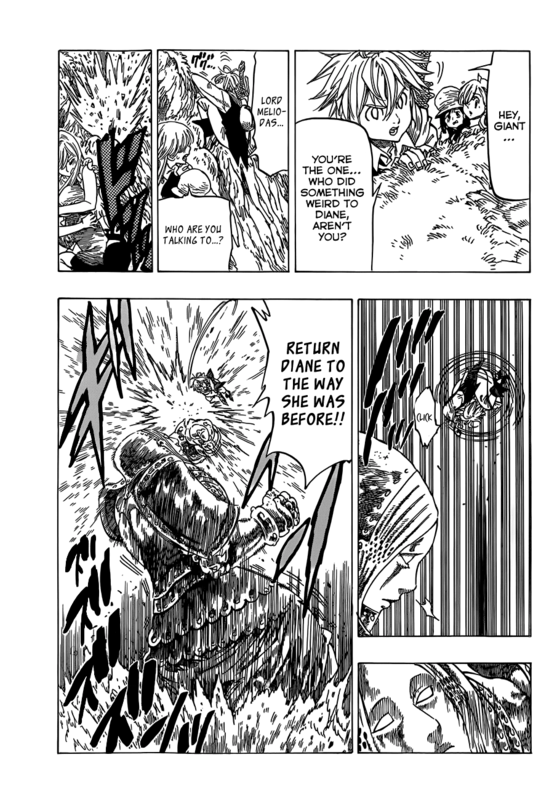 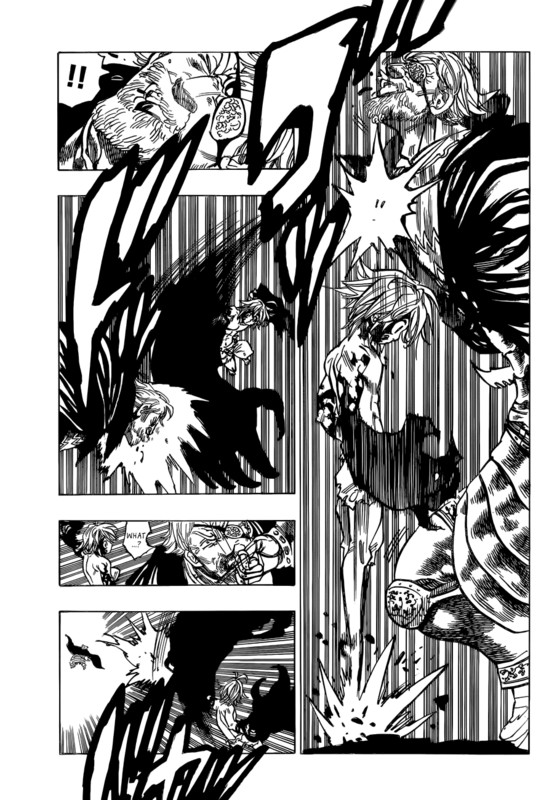 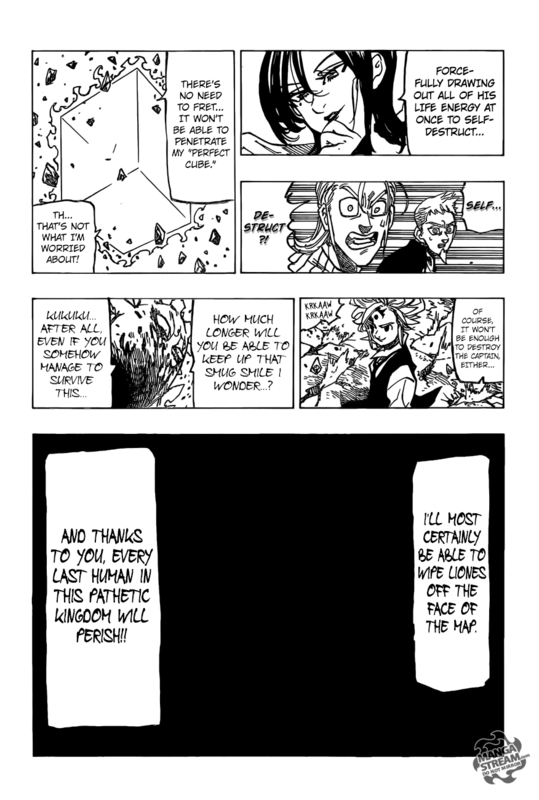 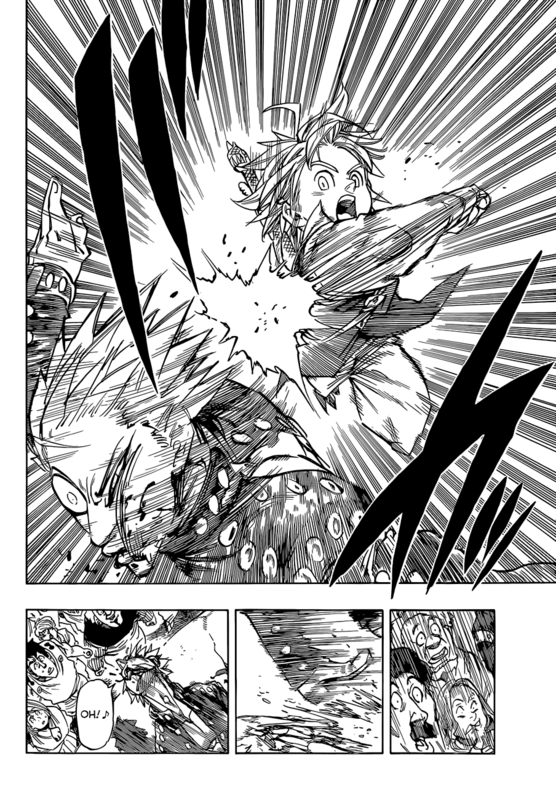 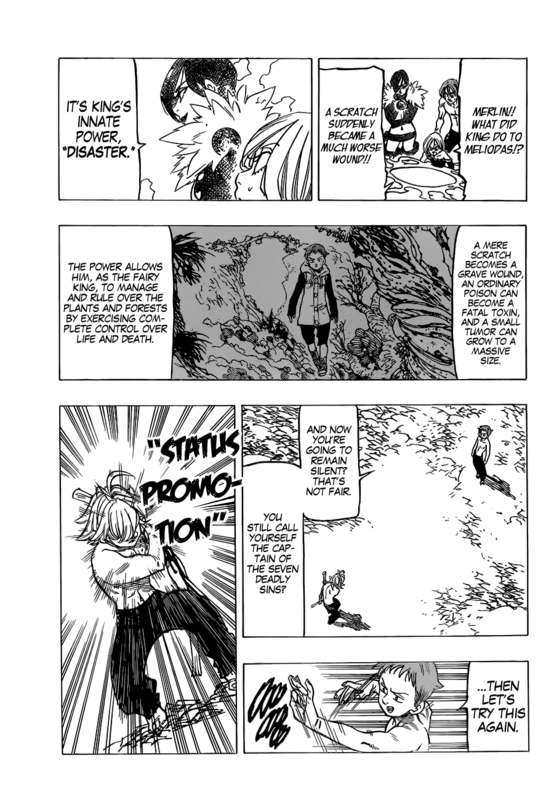 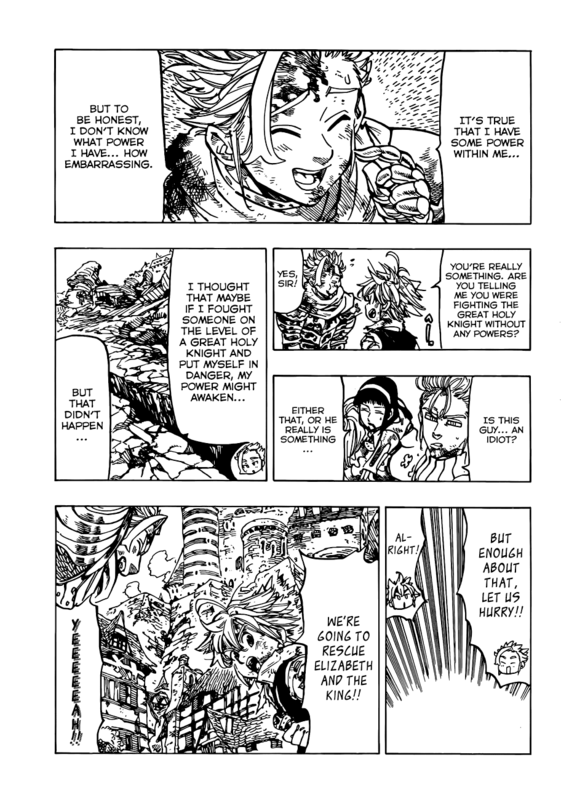 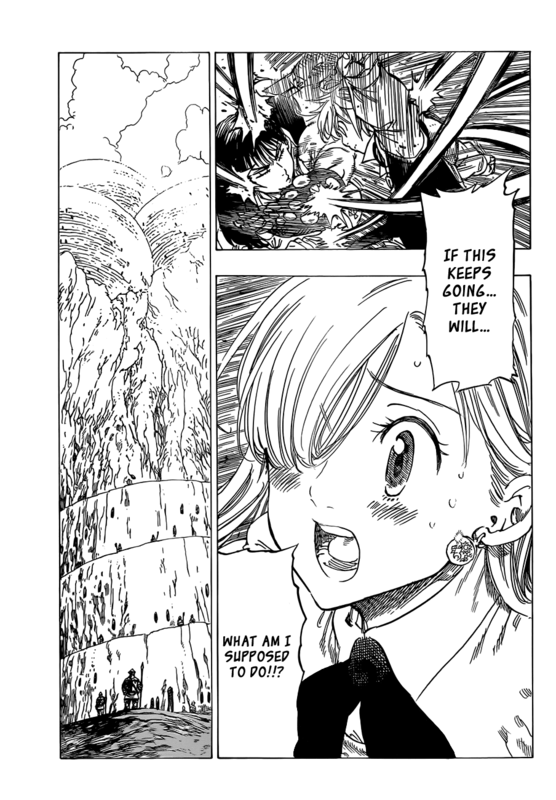 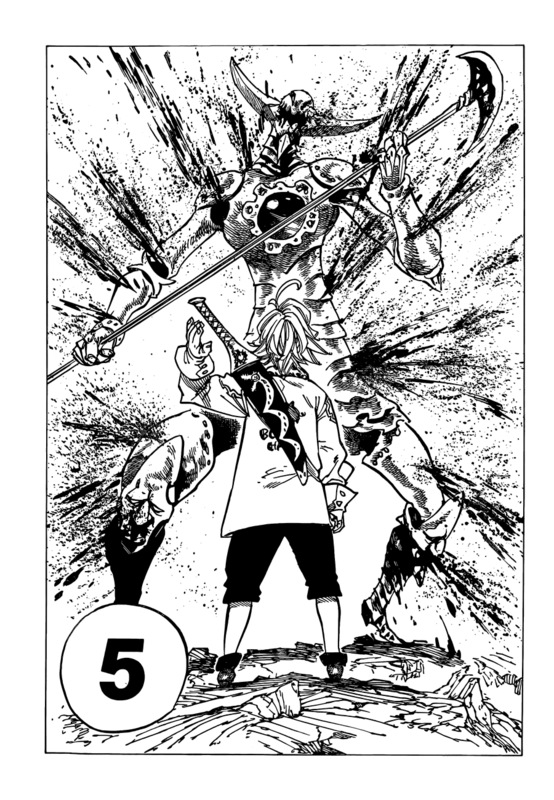 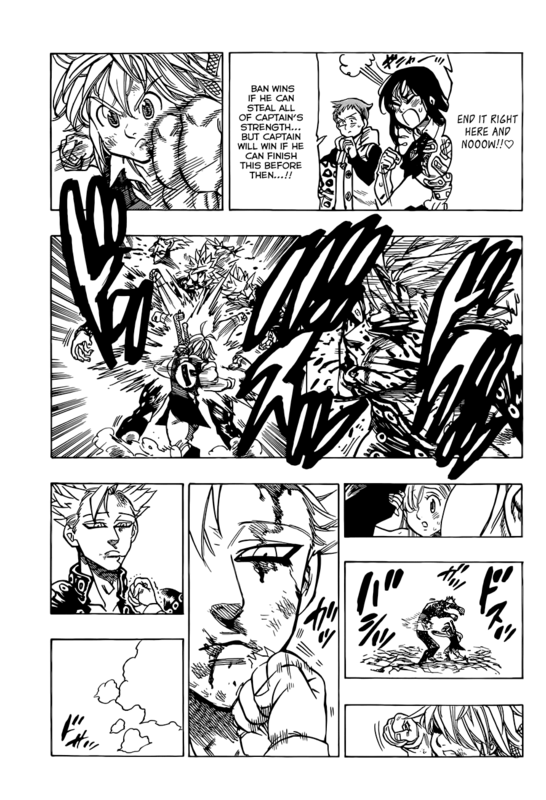 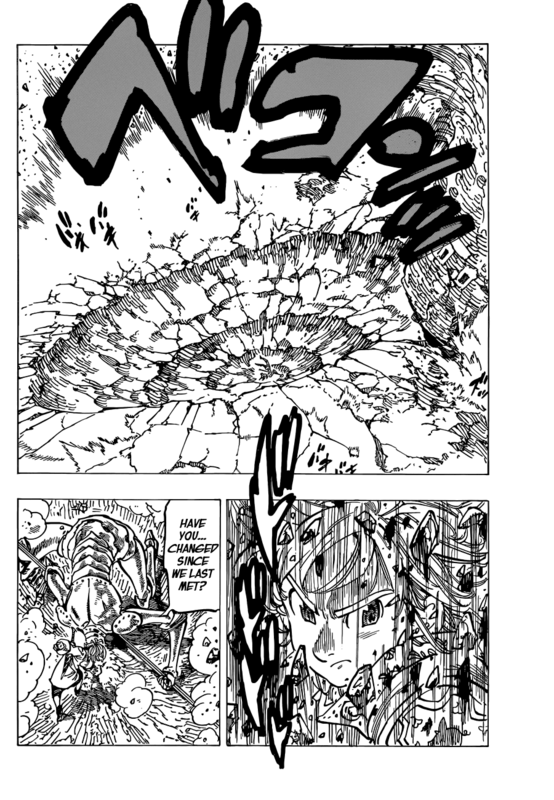 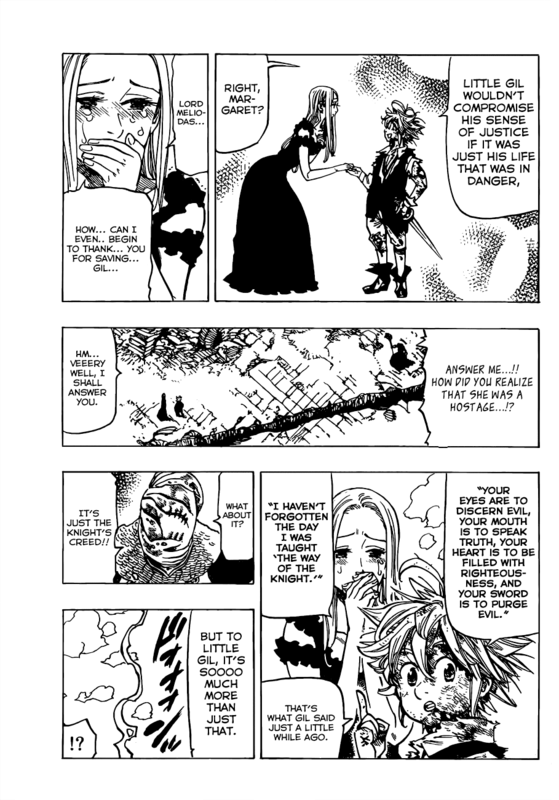 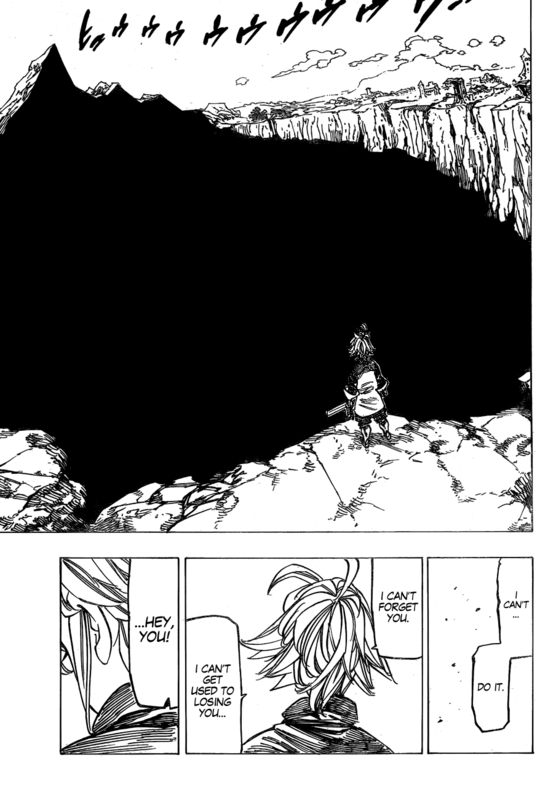 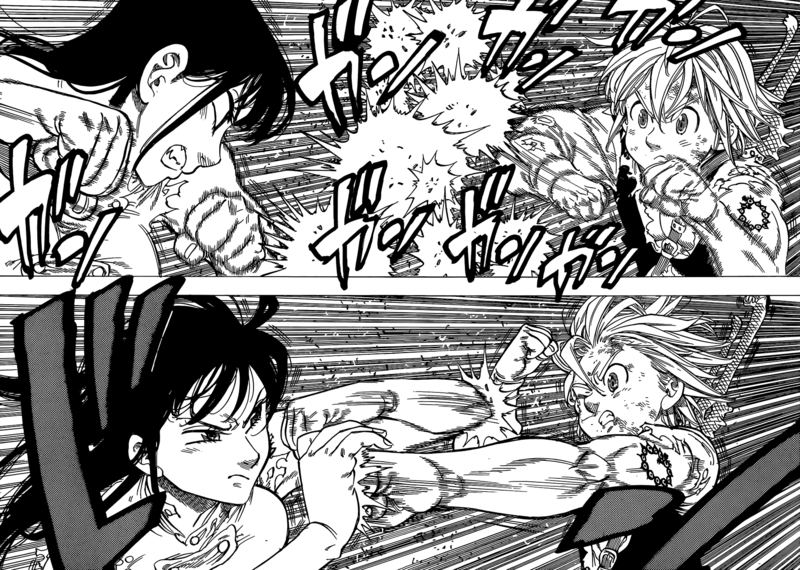 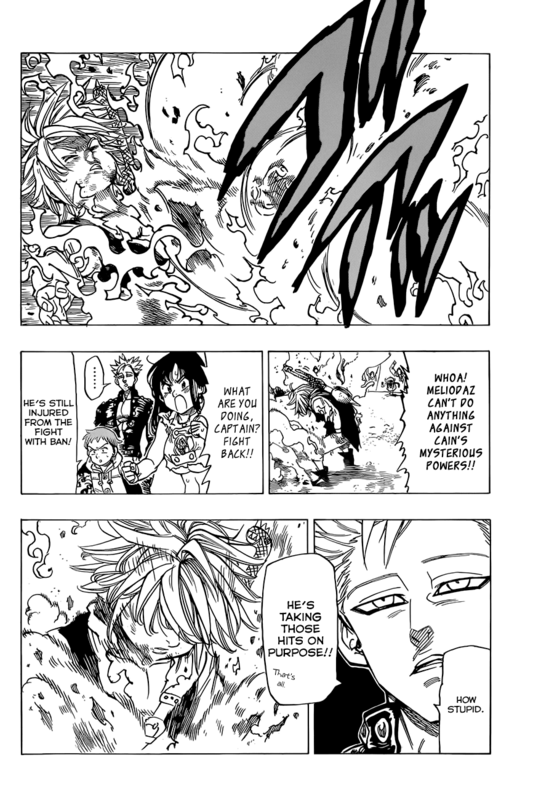 Ban steals even more strength from Meliodas, so Mel breaks his fingers, he then effortlessly overpowers Ban. 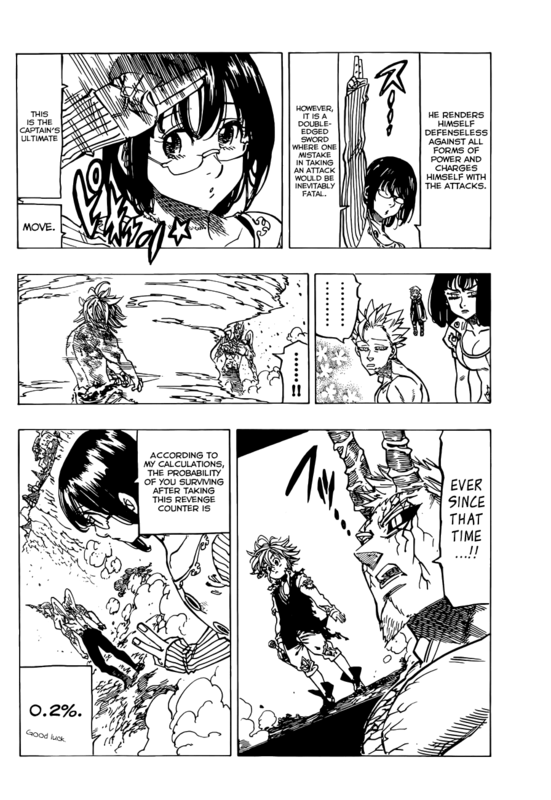 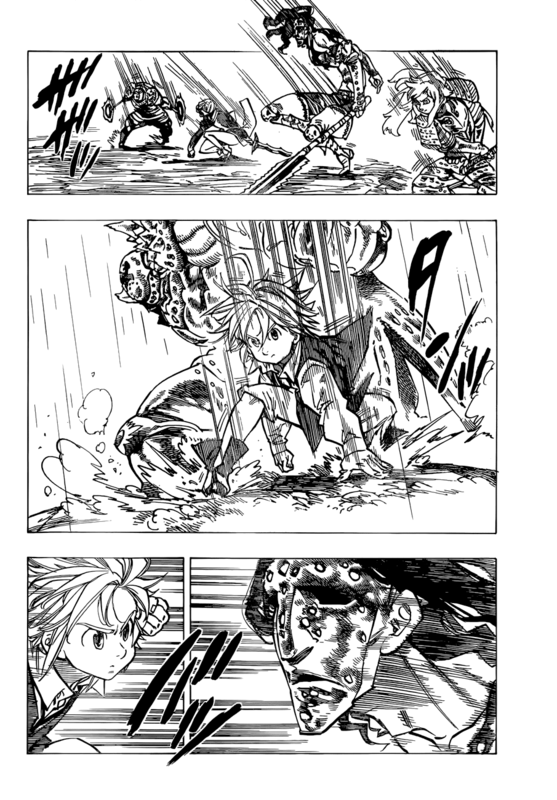 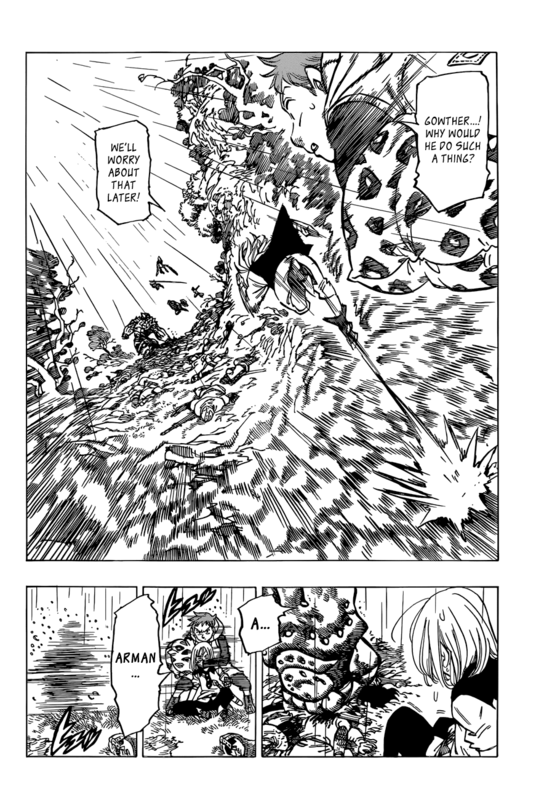 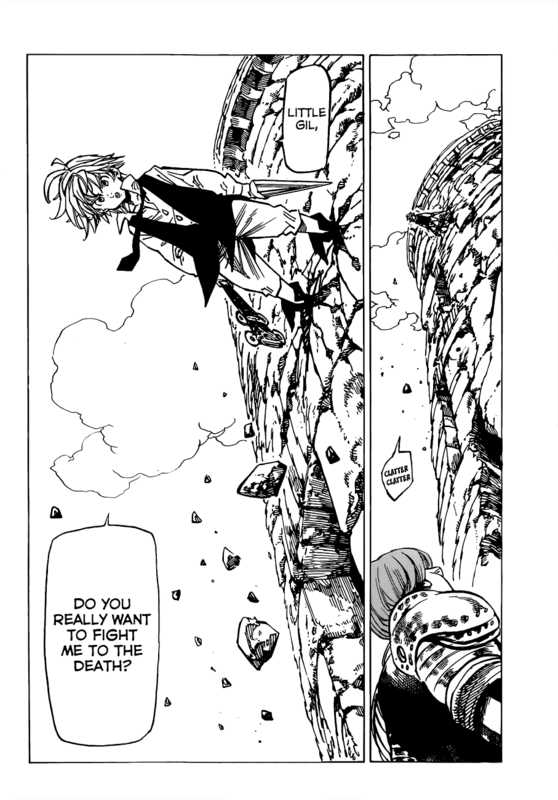 Ban steals almost all of his strength, so Meliodas keeps beating on him. 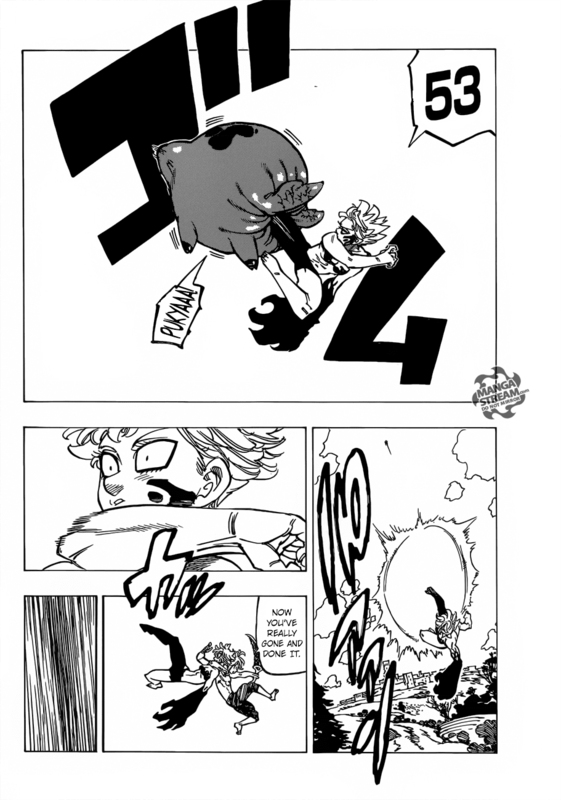 Swapped hands with Mini Dianne. 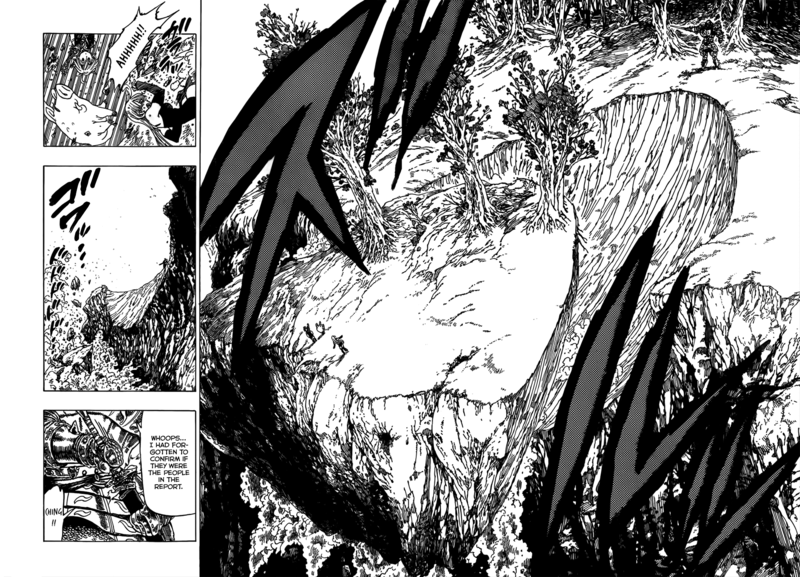 Cuts a large hill, or moderate sized mountain, in two by swinging a twig - Better angle. 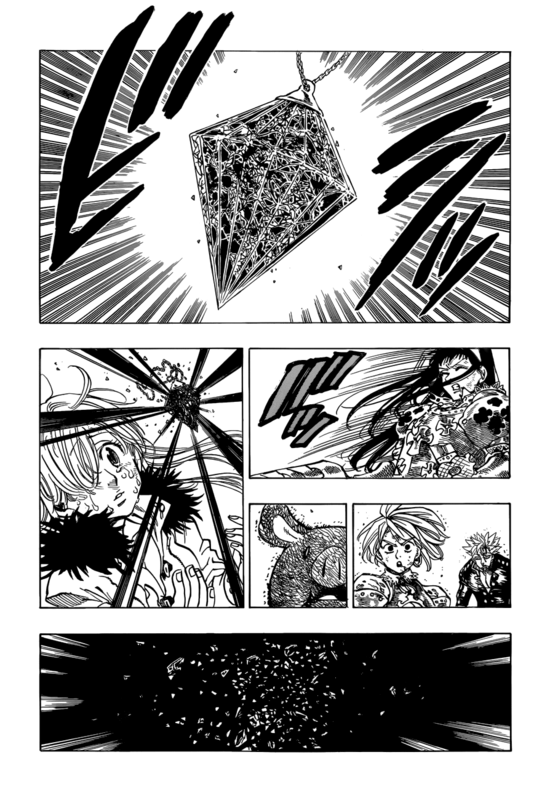 Blocks a blow from Gilthunder. 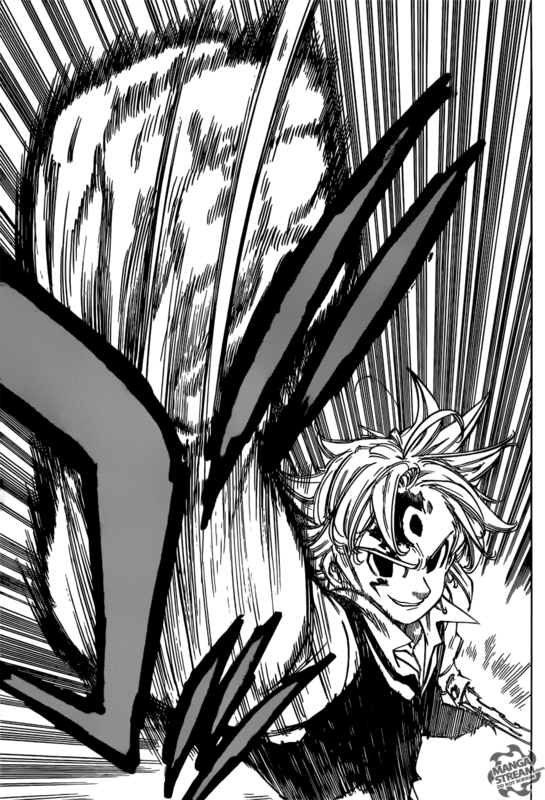 Blasts Gilthunder and Hendrickson away. 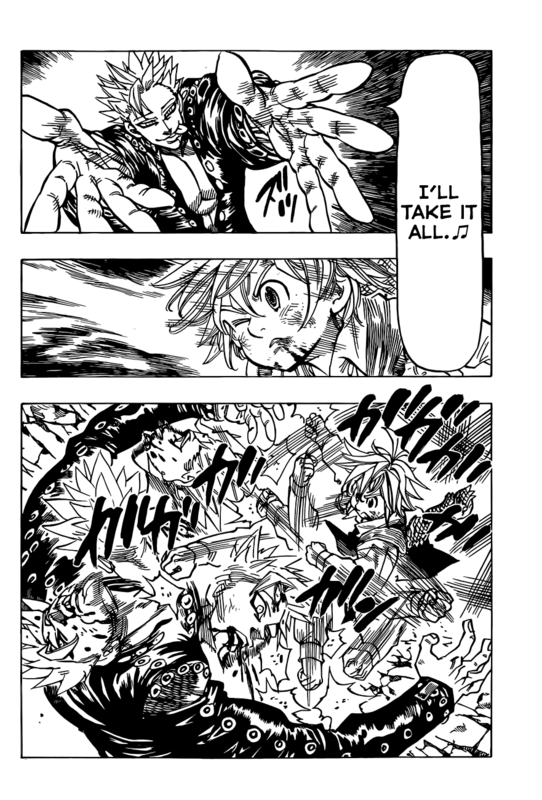 Swaps hands with Gilthunder and Hendrickson (not available). 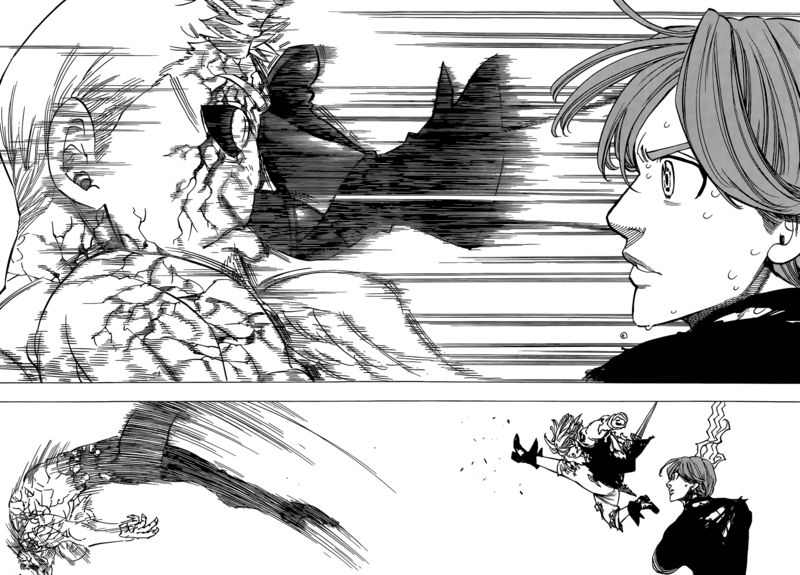 Cuts up the ground. 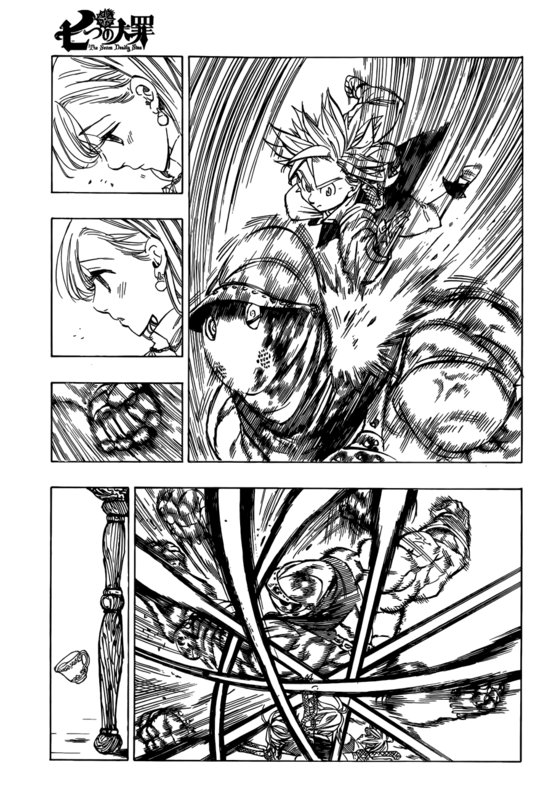 - Alternate angle, another one. 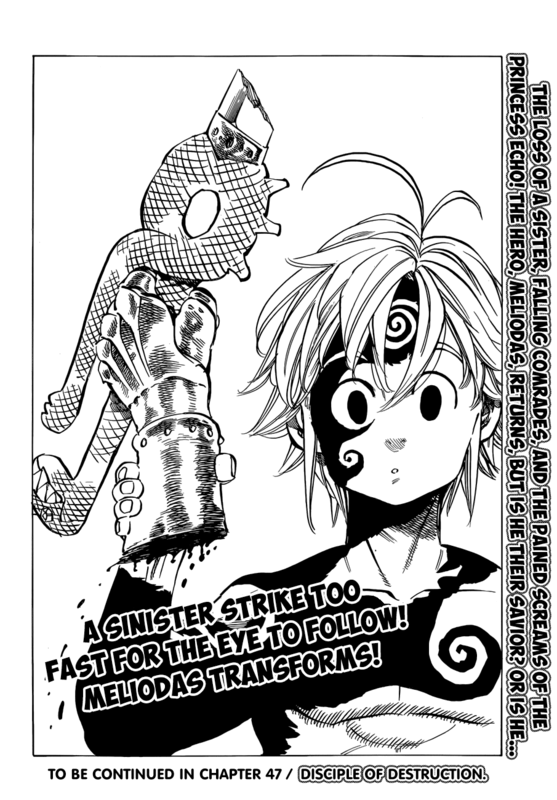 Swapped hands with Demon Hendrickson. 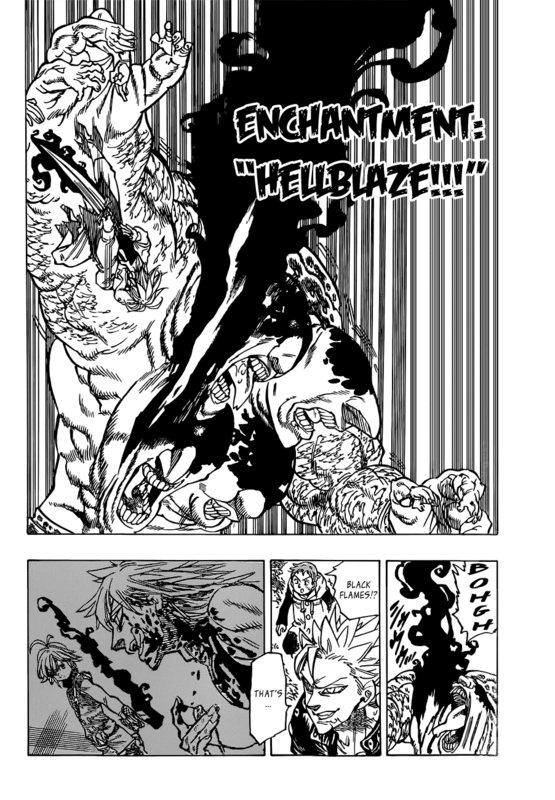 Caves in a weakened Grey Demon Hendrickson's chest. 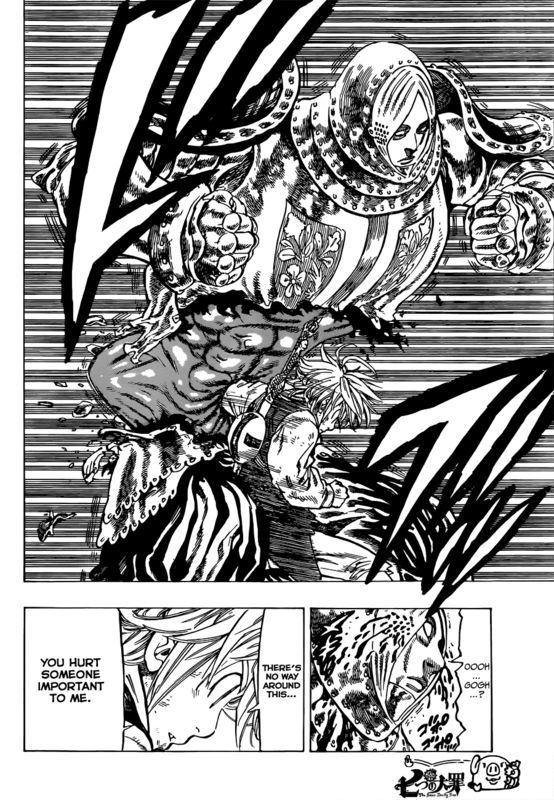 Breaks Dogedo's fingers, and then easily defeats him - Dogedo has a higher PL than Ruin. 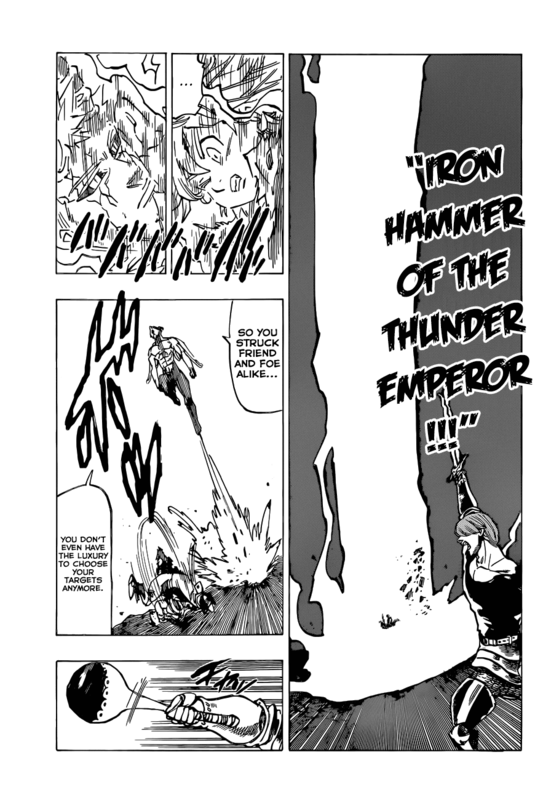 Manages to catch Gilthunder's lightning amped spear with one hand, which destroys a large portion of a Village, and he only recieves a small cut. 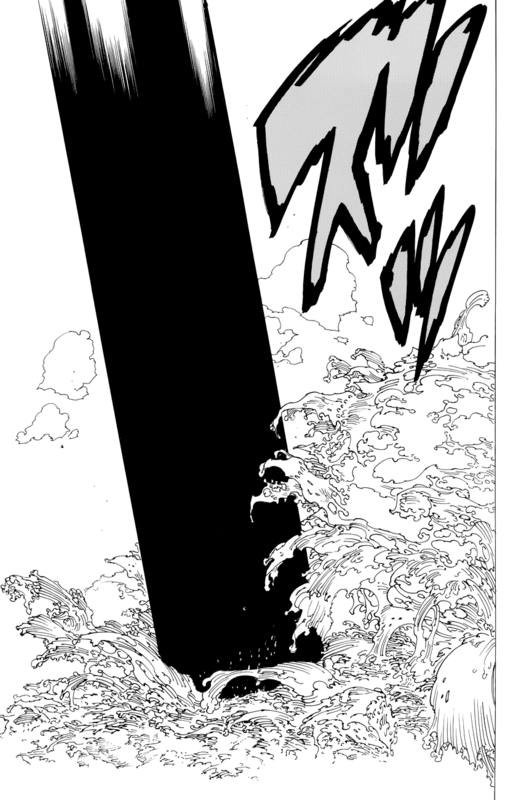 Withstands a beating from Giant Dianne with minimal damage. 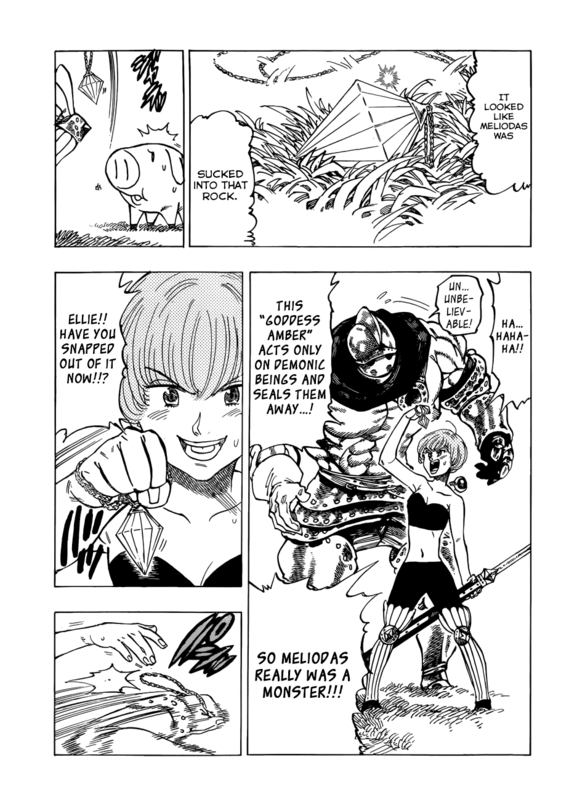 Withstands attacks from a bloodlusted Giant Dianne. 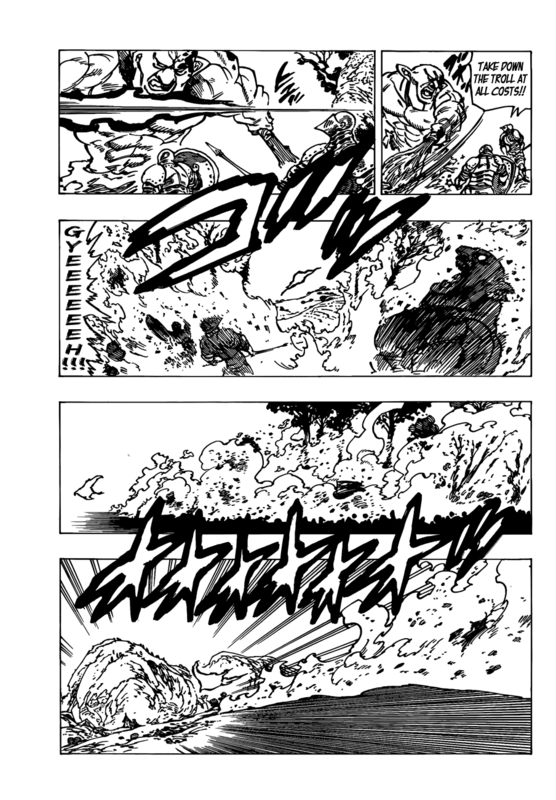 Tanks attacks from Ruin, which shatter the ground. 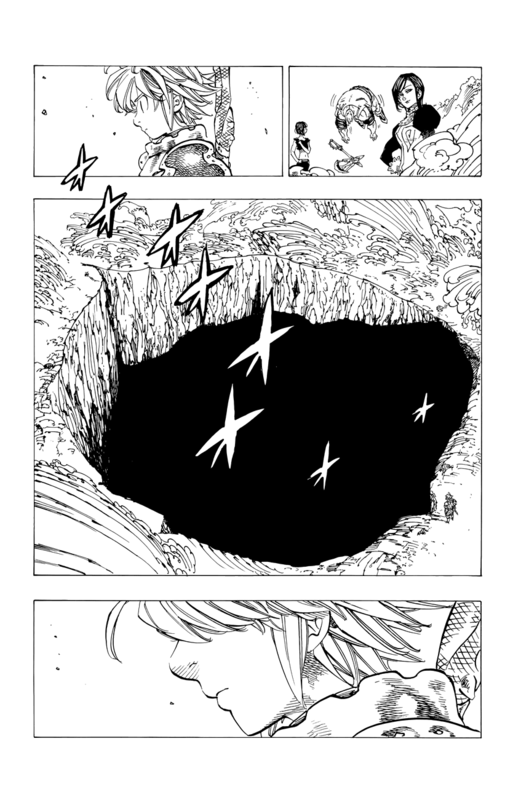 Tanks attacks from Ruin, which crater the ground and shake the massive Baste Dungeon - Baste Dungeon size. 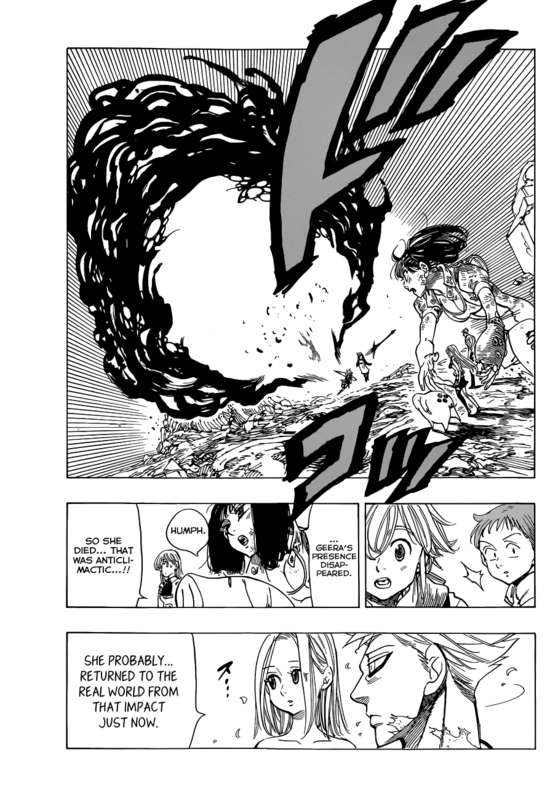 Tanks a kick from Gulia. 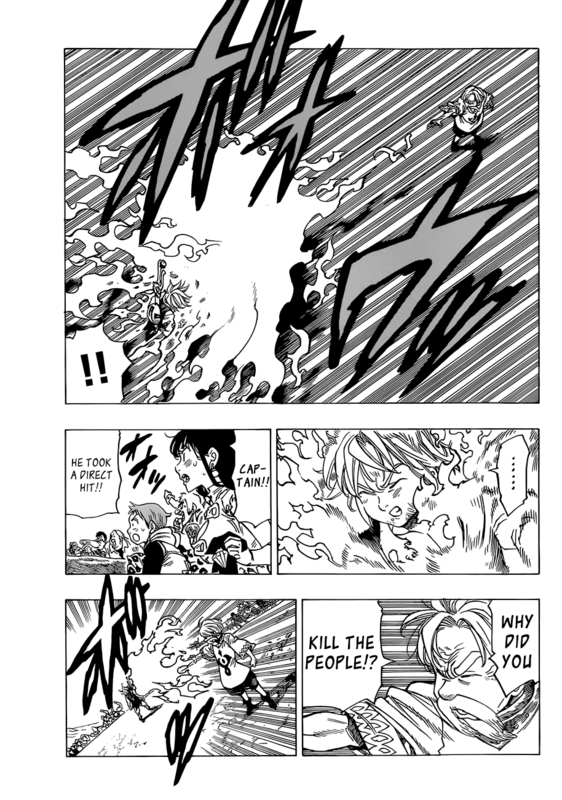 Tanks dozens of attacks from Ban. 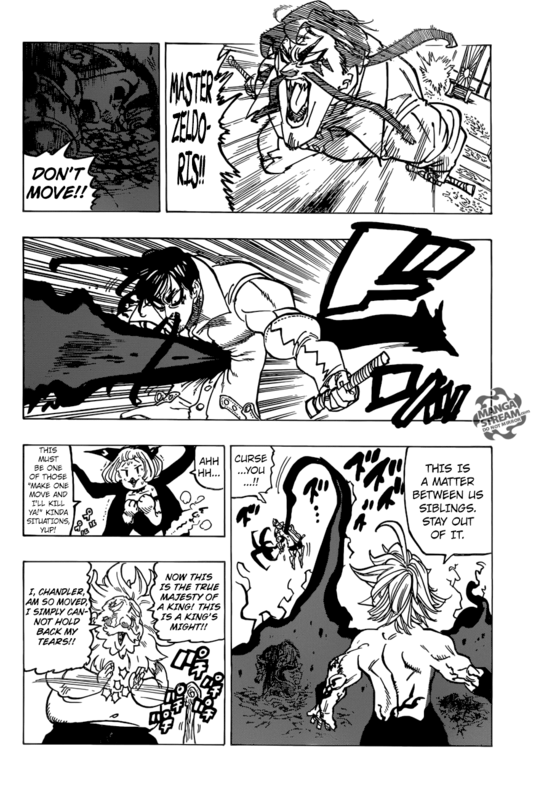 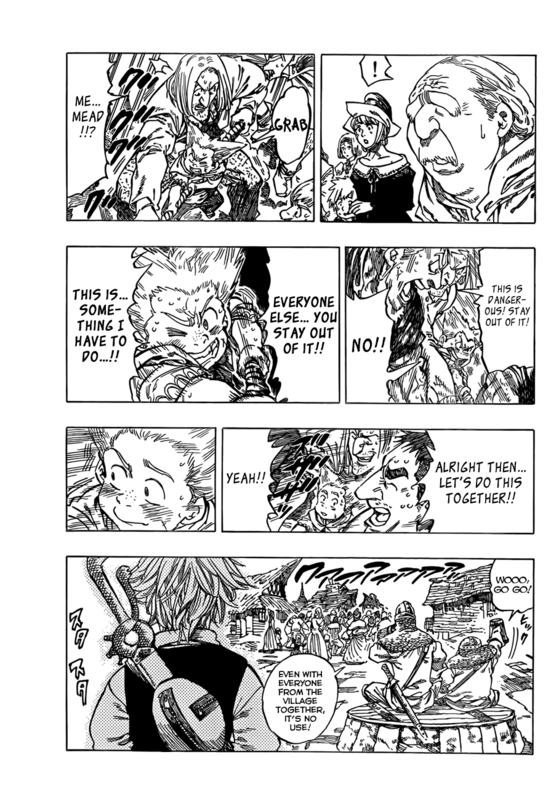 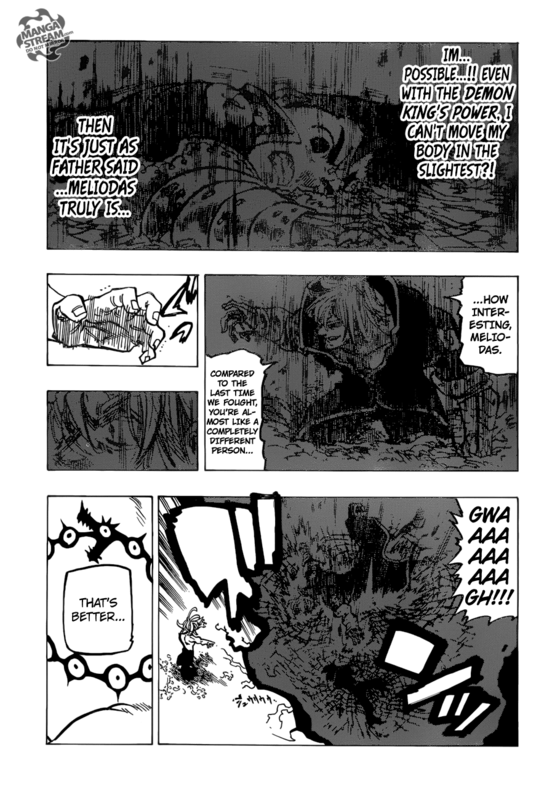 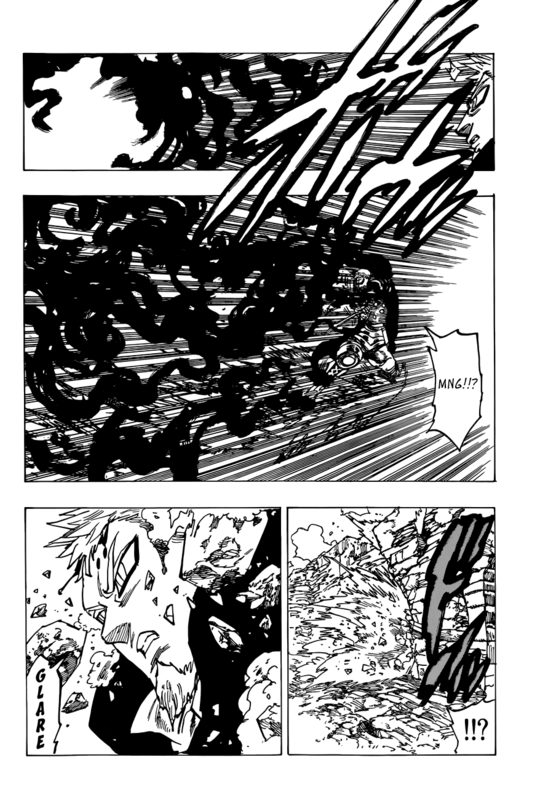 Ban steals strength from Meliodas, and then proceeds to give him a large beating. 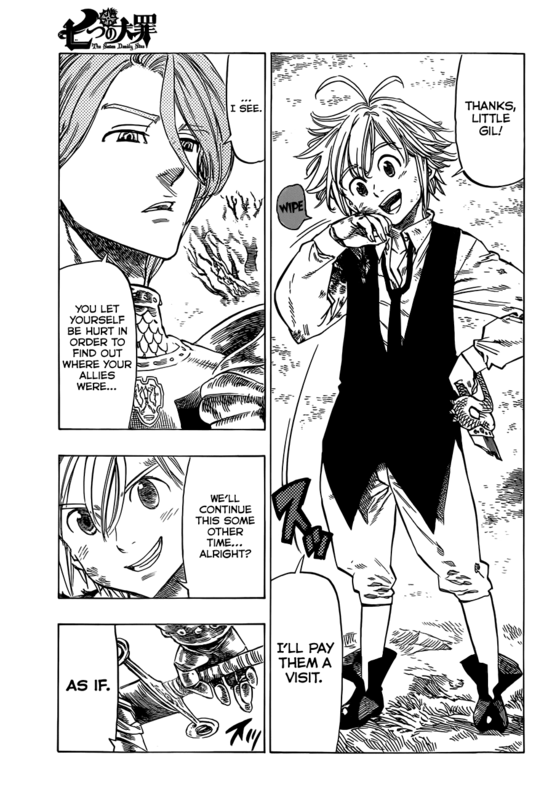 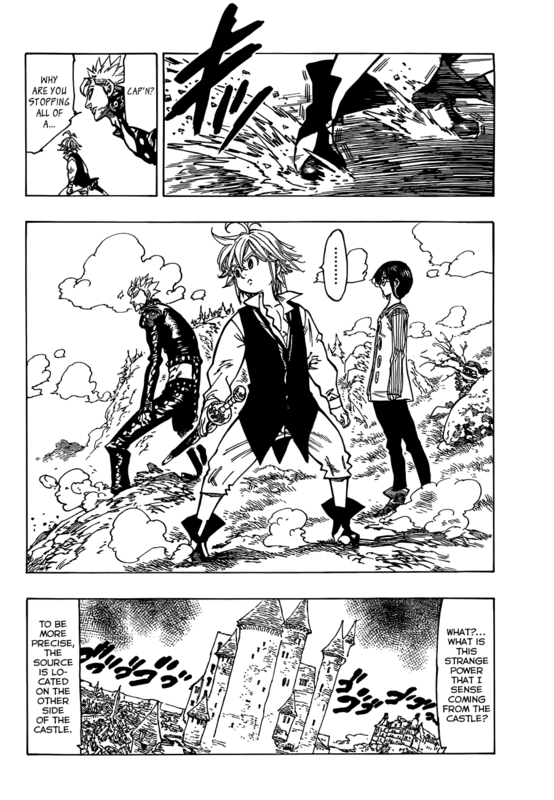 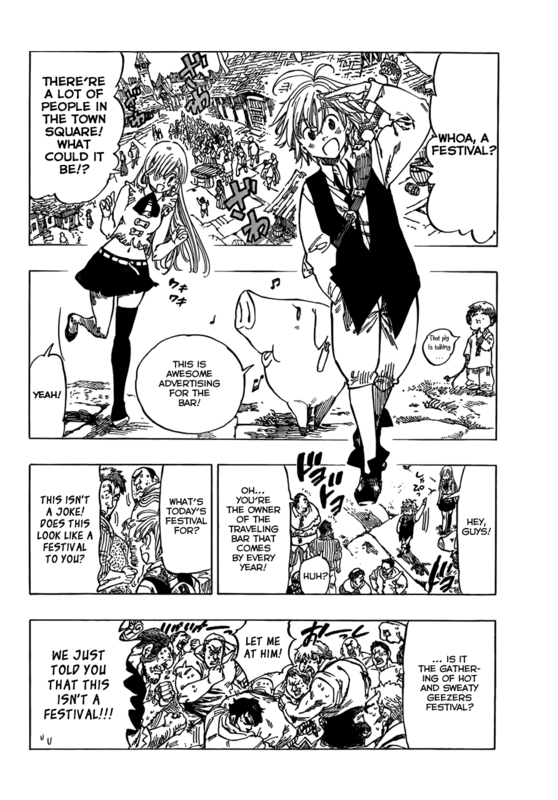 Meliodas is extremely casual here. 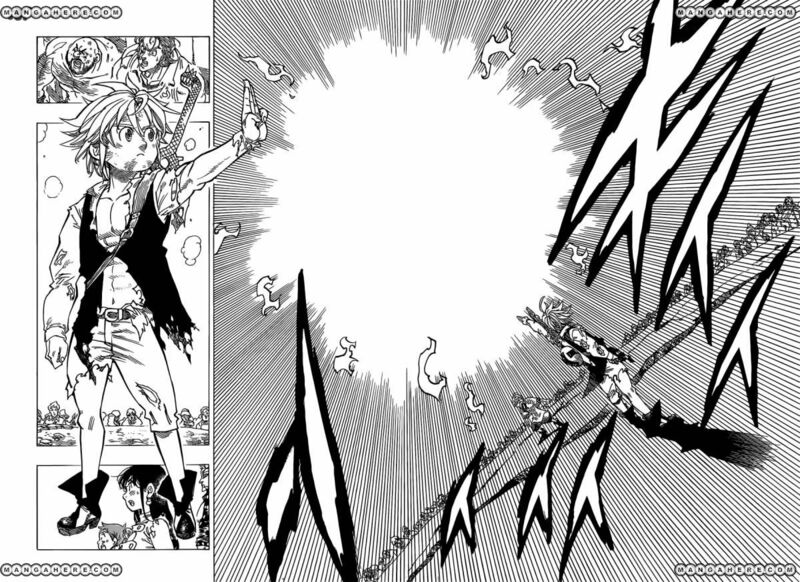 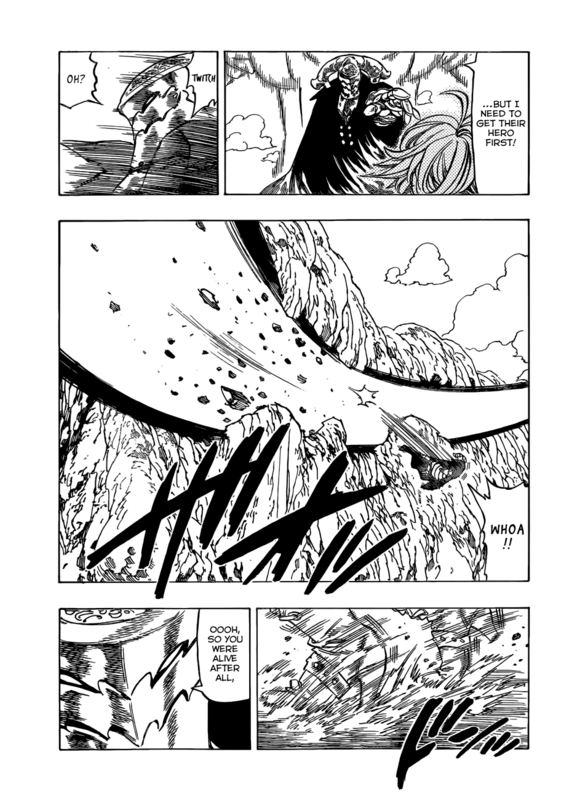 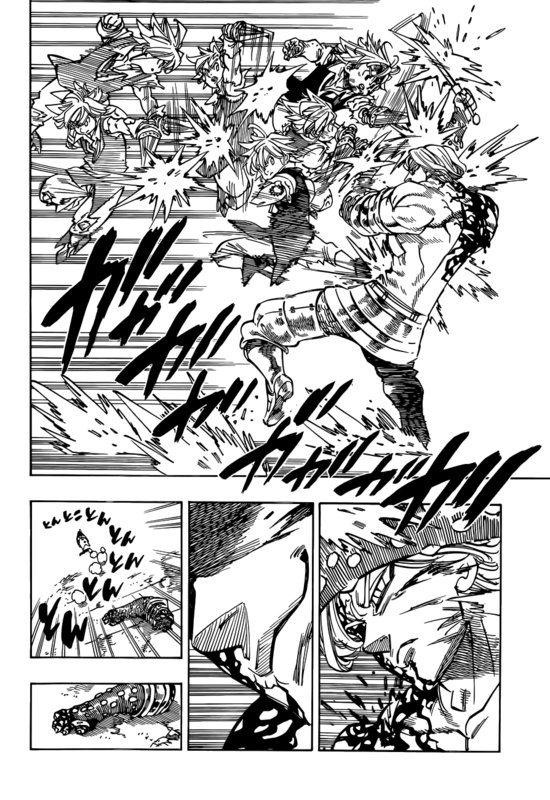 Ban steals all of Meliodas' power, however, he still withstands a hit, though with heavy damages. 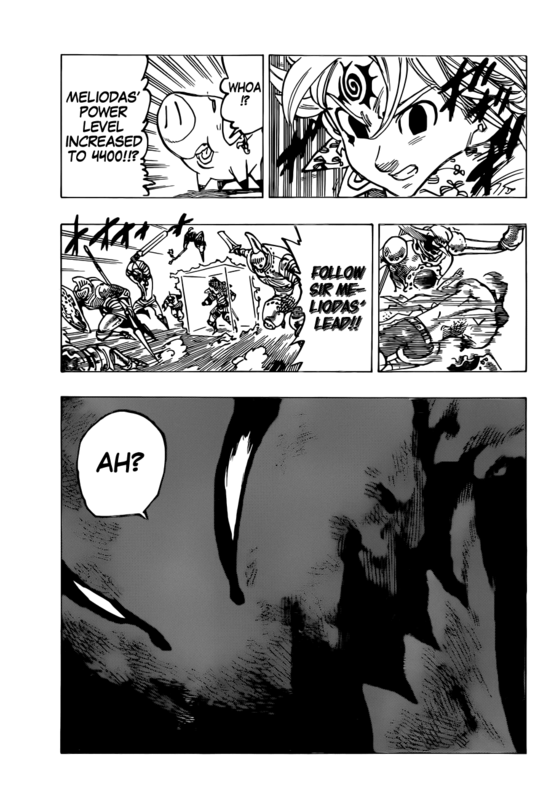 Note: Ban is not holding back, this also proves that. 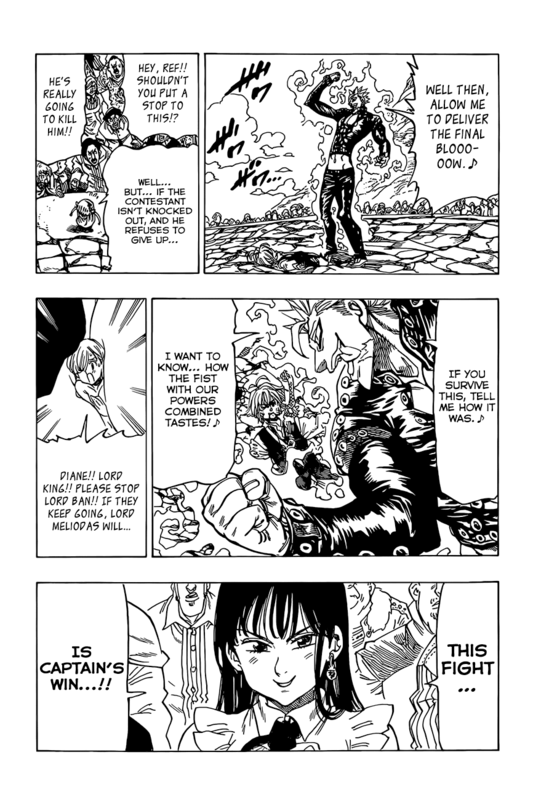 Withstands fire attacks from Cain. 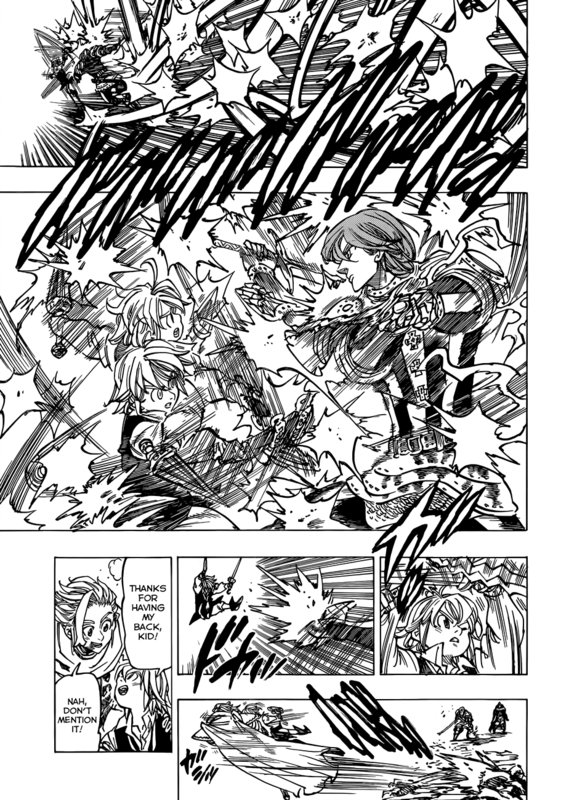 Withstands a serious hit from Mini Dianne, which split up Byzel Rock. 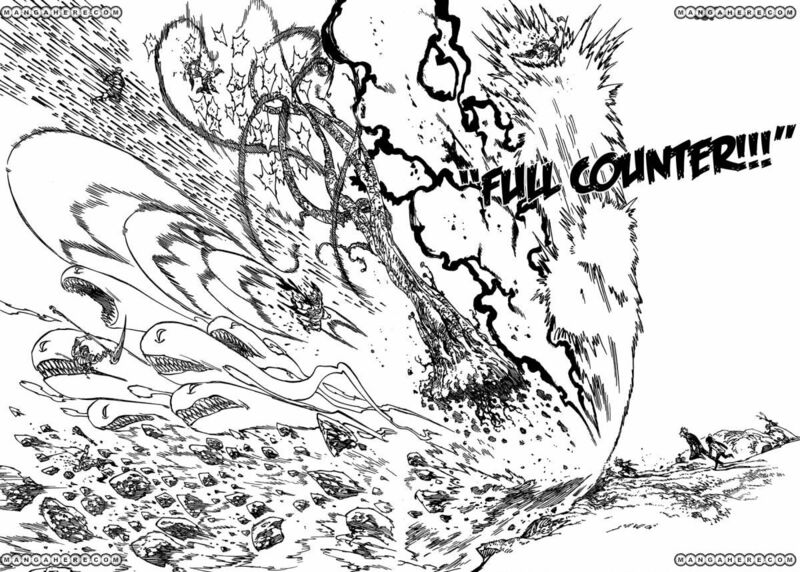 Withstands a chain of Guila's explosions, just one of which could wreck villages, and this is the amount. 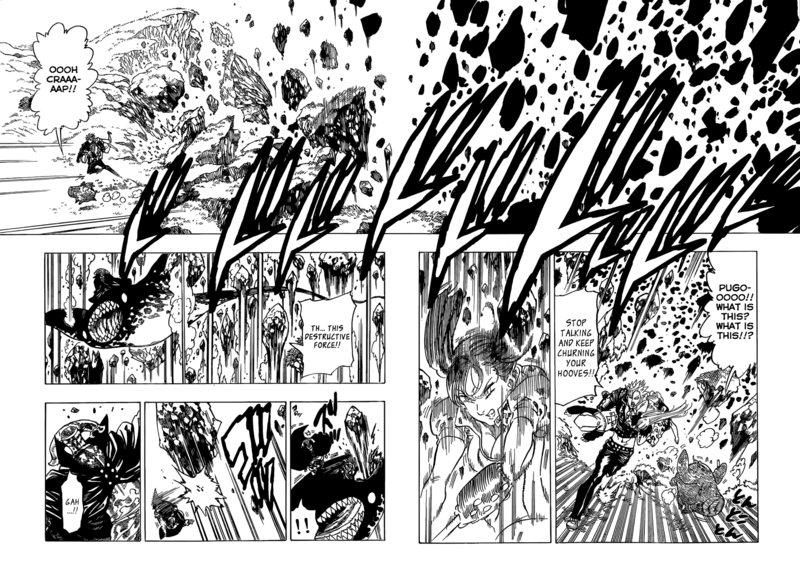 Tanks being thrown 40 Miles within a minute or two (judged on how long they were speaking), regardless it was faster than sound. 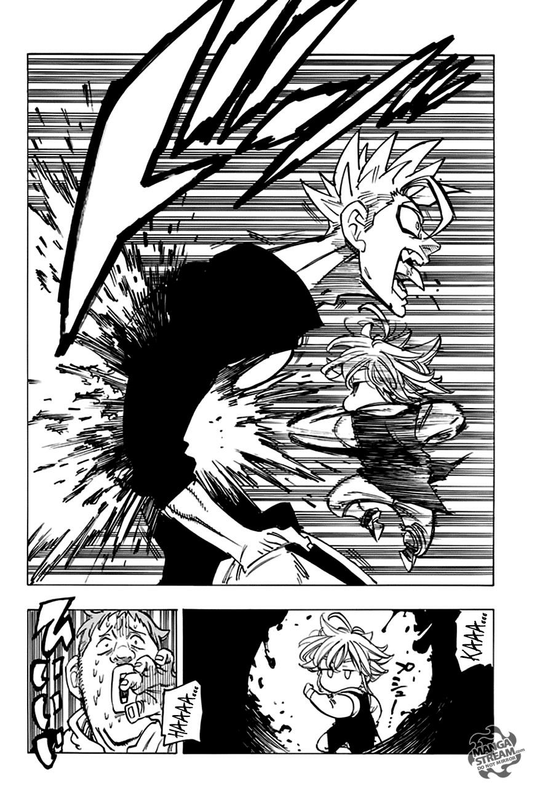 Smashed through a building by Gilthunder at extremely high speed. 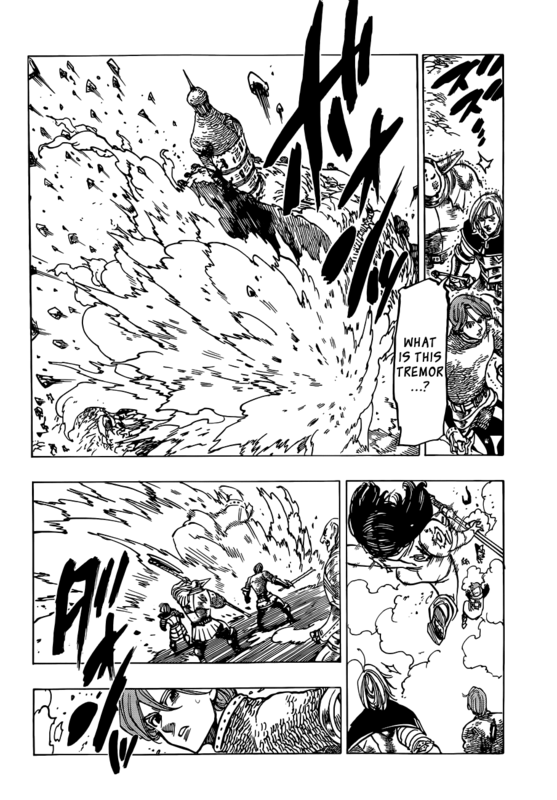 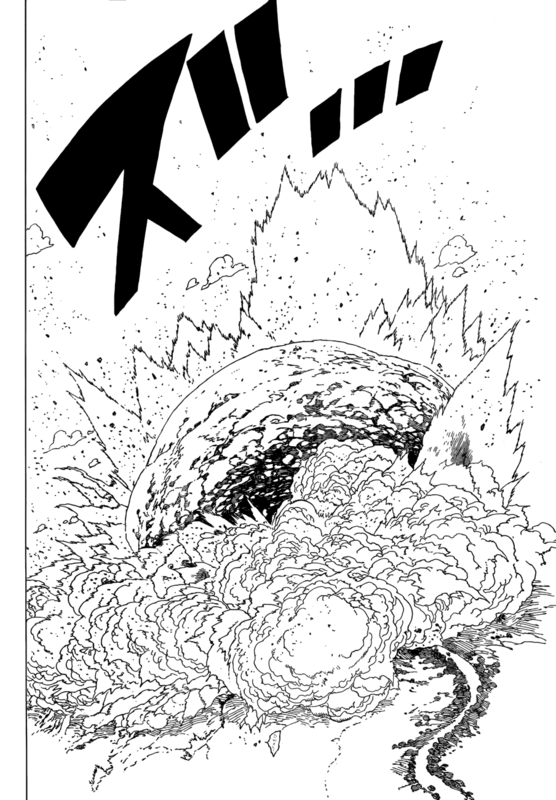 Withstands an amped attack from Gilthunder and Hendrickson, which disintegrates a chunk building. 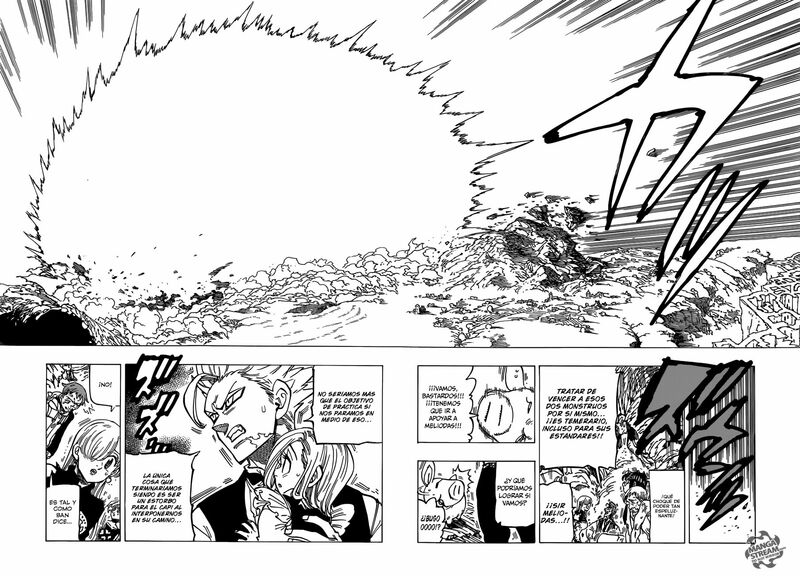 Withstands a massive explosion, which was a combined attack from Gilthunder, Vivian and Hendrickson. 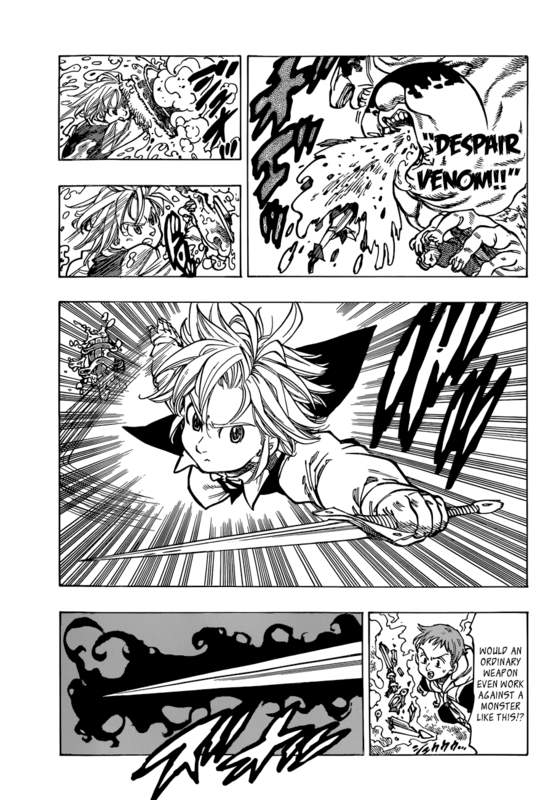 Tanks hits from Demon Hendrickson. 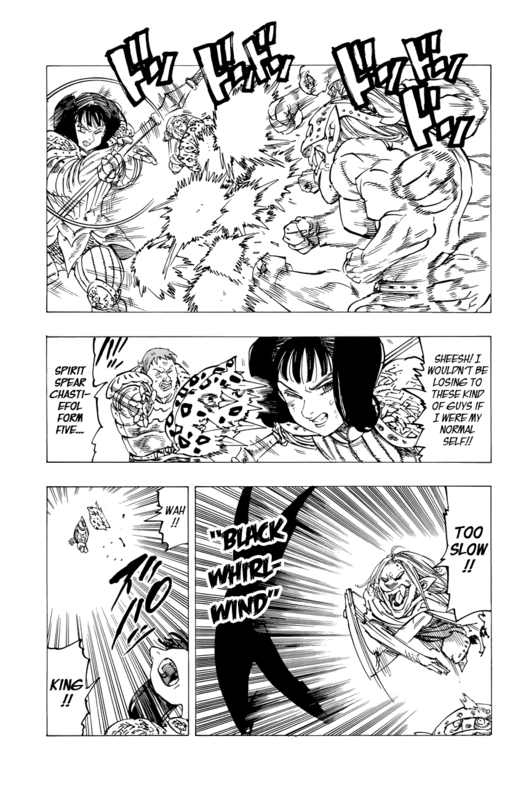 Withstands a hit from Gray Demon Hendrickson. 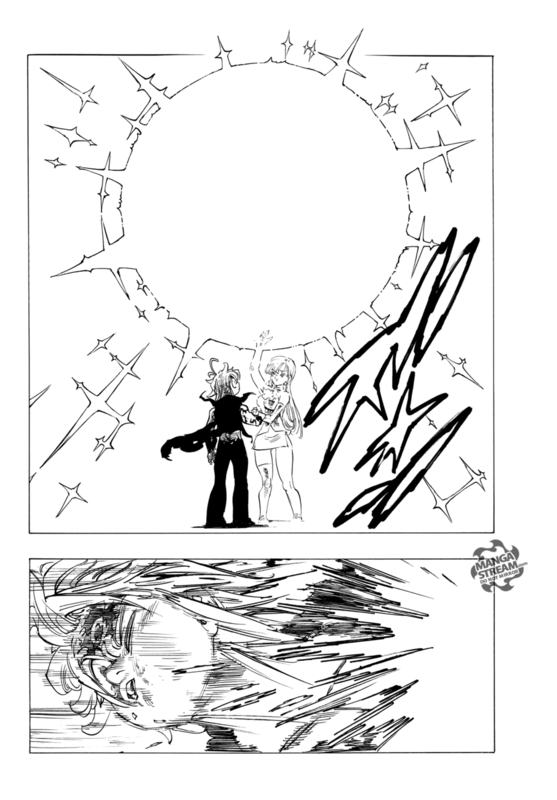 Withstands Grey Demon Hendrickson's Dark Nebula. 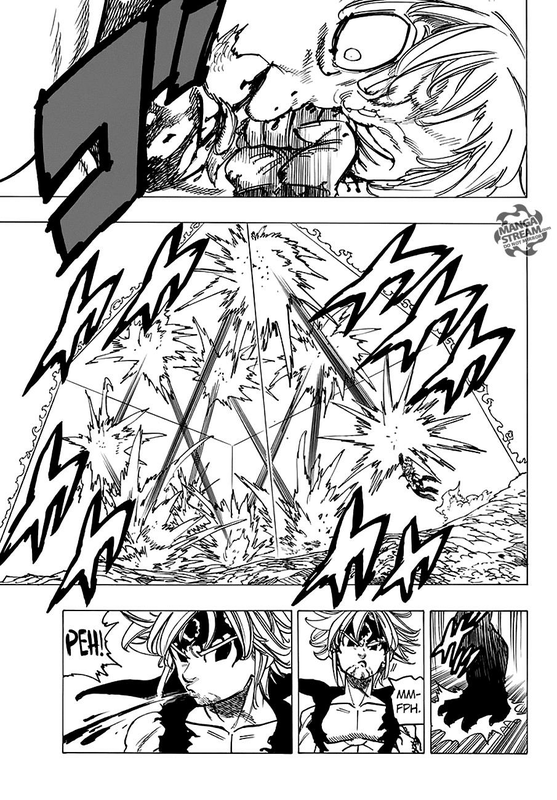 Tanks a massive lightning attack from Glithunder. 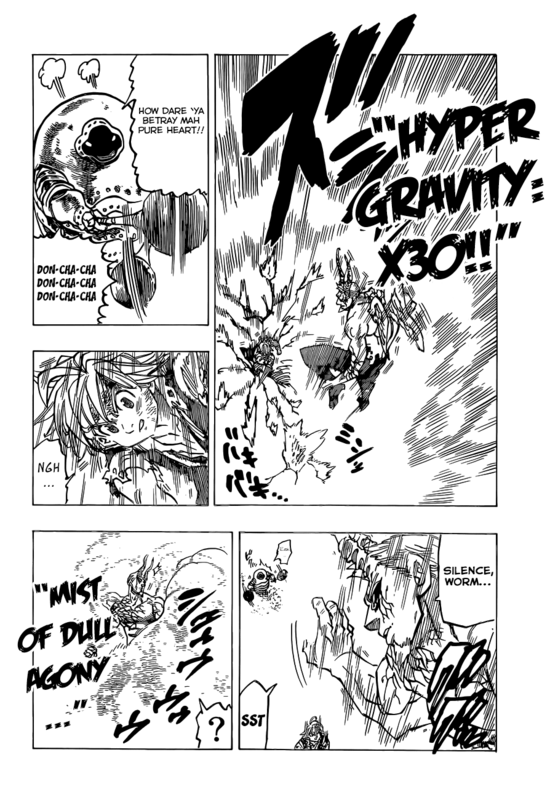 Is subjected with heavy gravity after taking extreme damage, 10-30x g i believe. 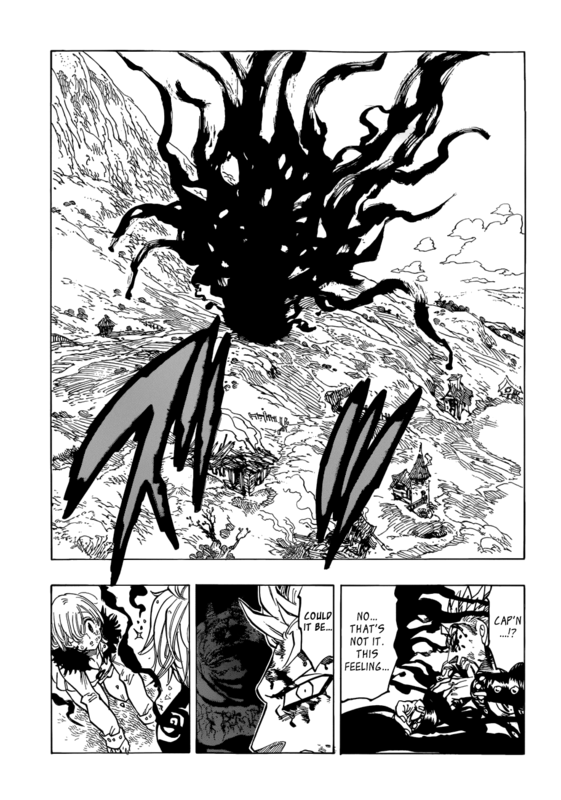 Withstands a massive attack from Grey Demon Hendrickson. 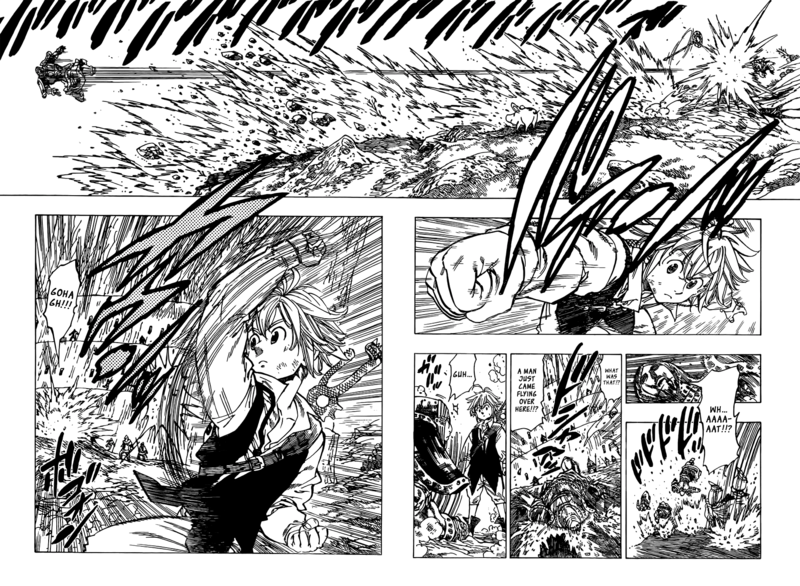 Withstands Grey Demon Hendricson's Storm attack, then withstands a blast from him. 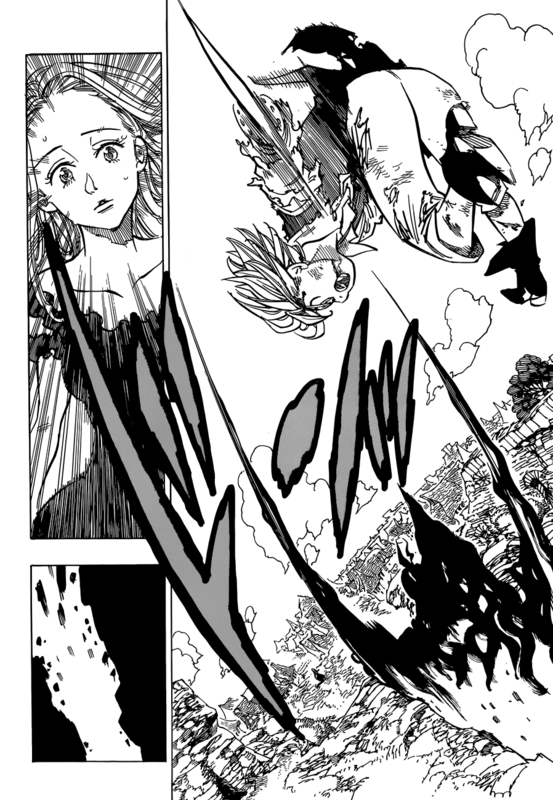 Withstands a barrage of attacks from Dianne. 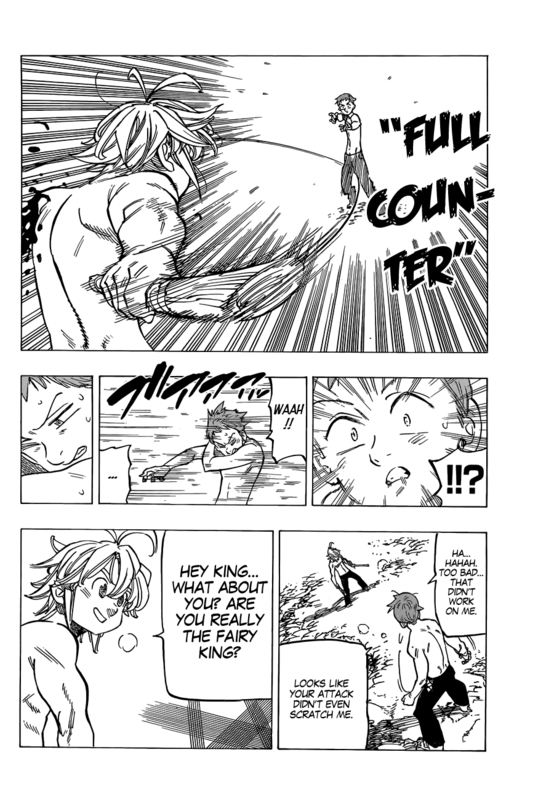 Withstands a massive attack from King. 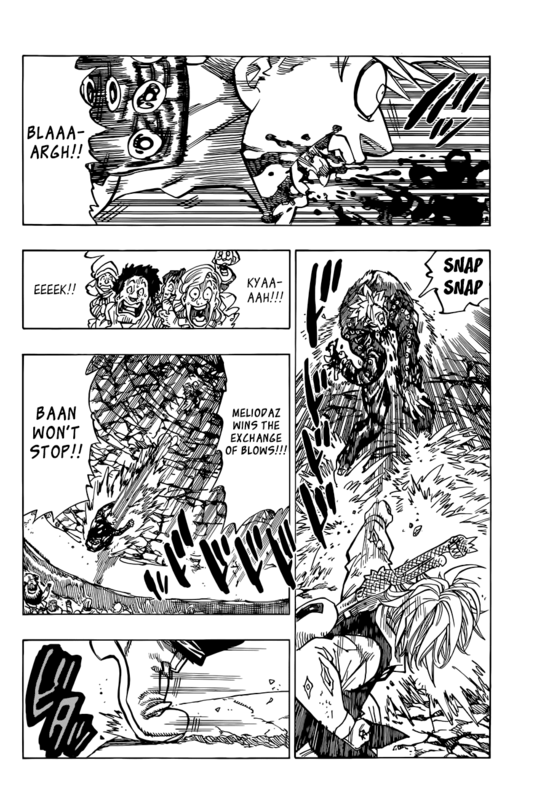 Blocks all of Dogedo's attacks. 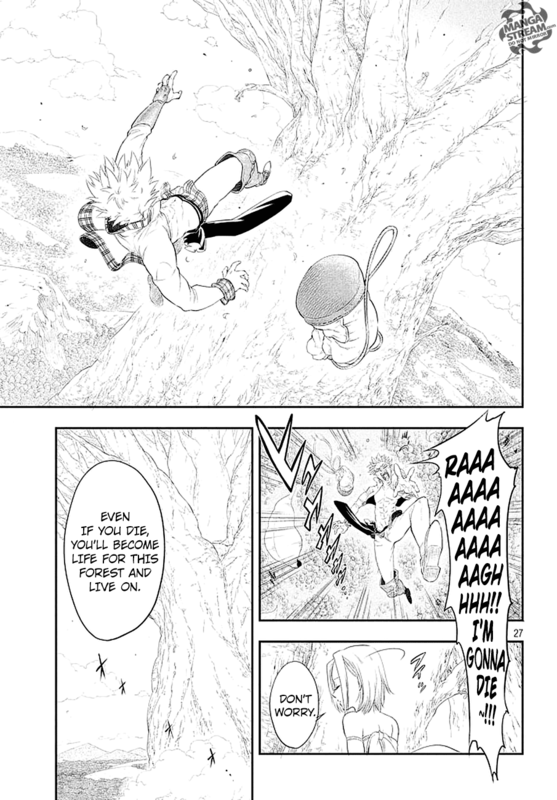 Goes down a falling portion of cliff to save a man and returns to the top. 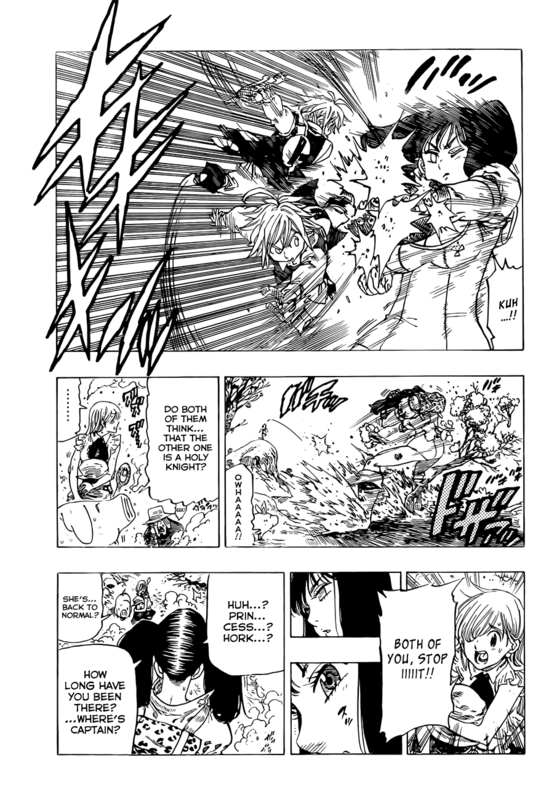 Outruns shockwaves produced by Twigo's sword swings to save Elizabeth. 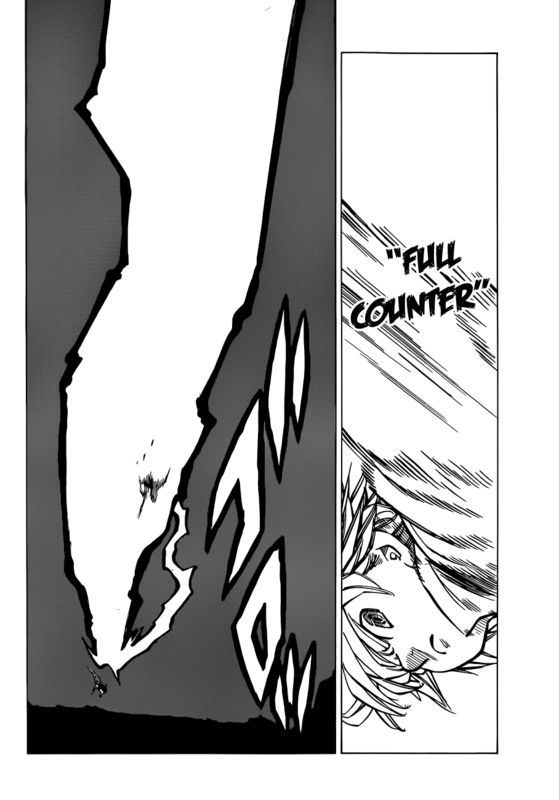 Full counters the shockwaves from Twigo's sword swings before he can notice. 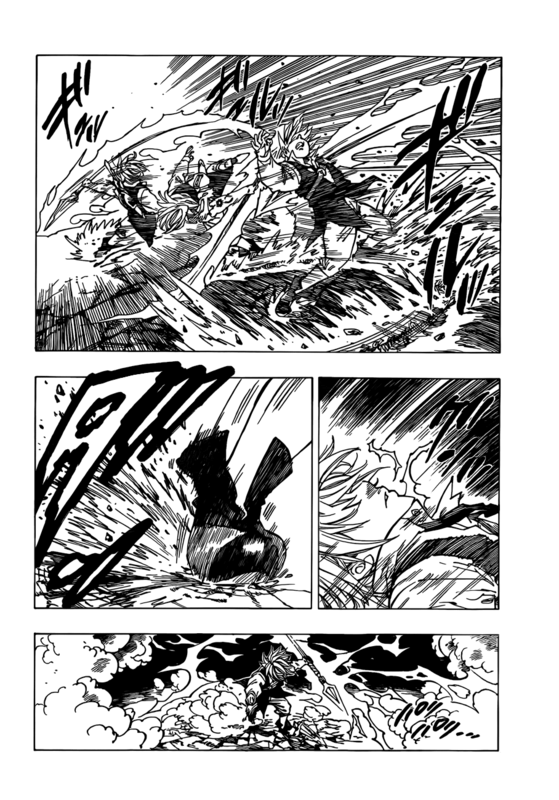 Reacts to Gilthunder's spear toss, which traveled 7.3 miles within a few minutes (Not including angle, so it's likely more). 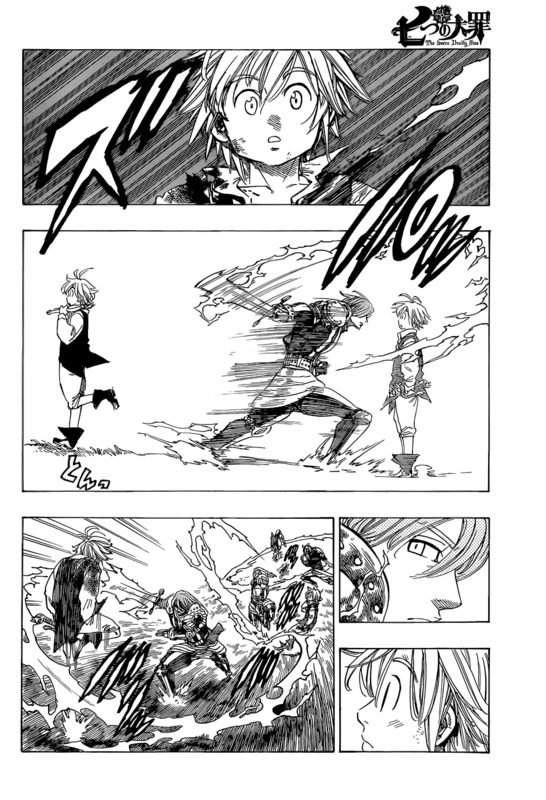 While extremely casual, he dodges Gilthunder's lightning. 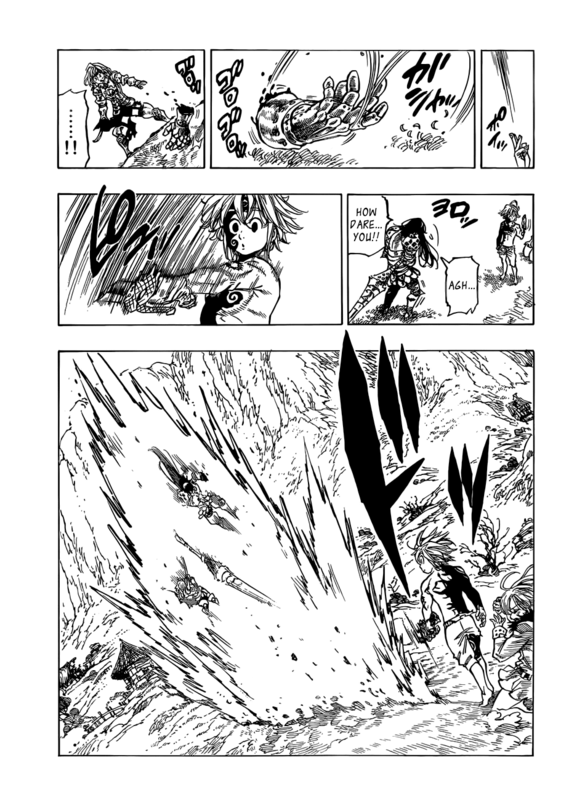 Intercepts Gulia's attack, and Full Counters her explosion. 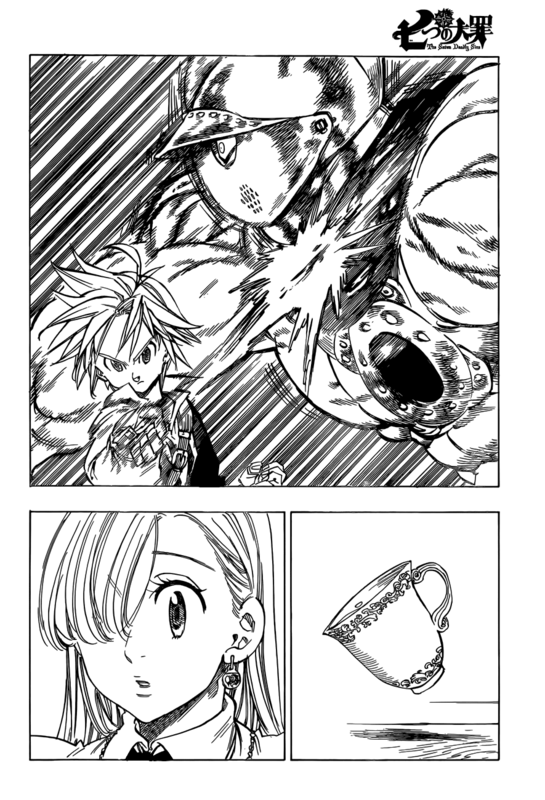 Fights and defeats Griamore before a tea cup hits the ground. 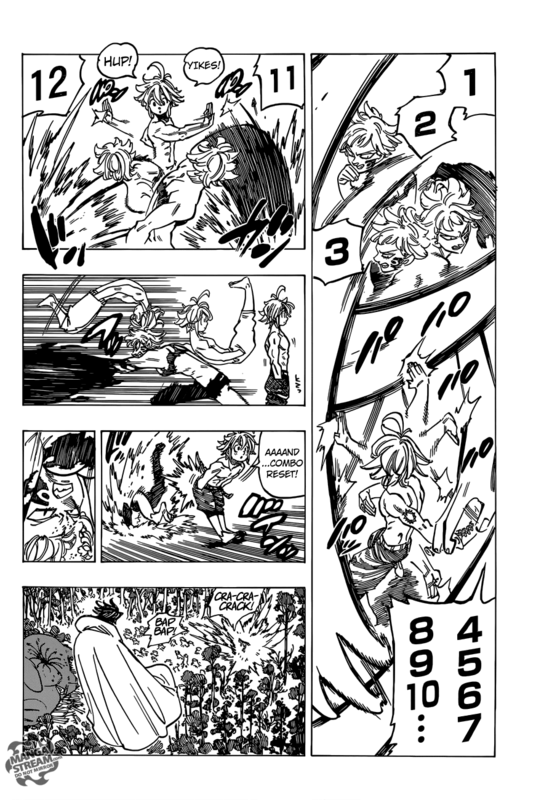 Keeps up with Ban, even though he's faster than Meliodas. 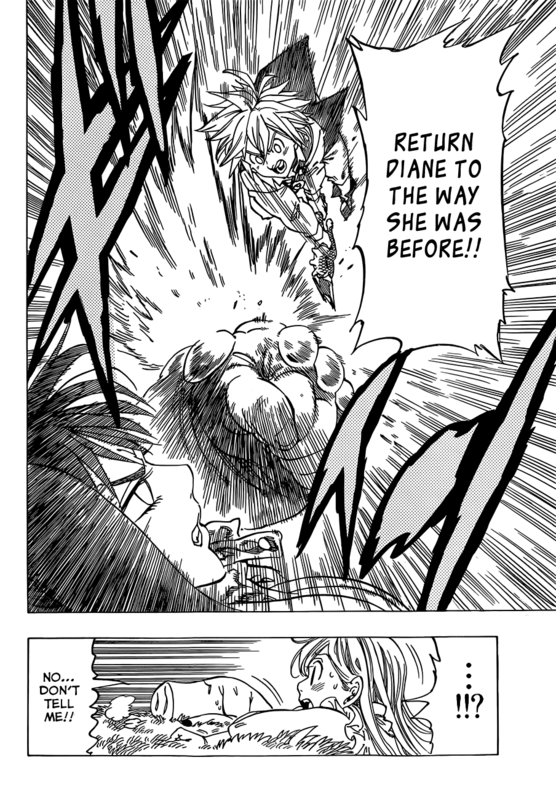 Dodged an attack from Mini Dianne. 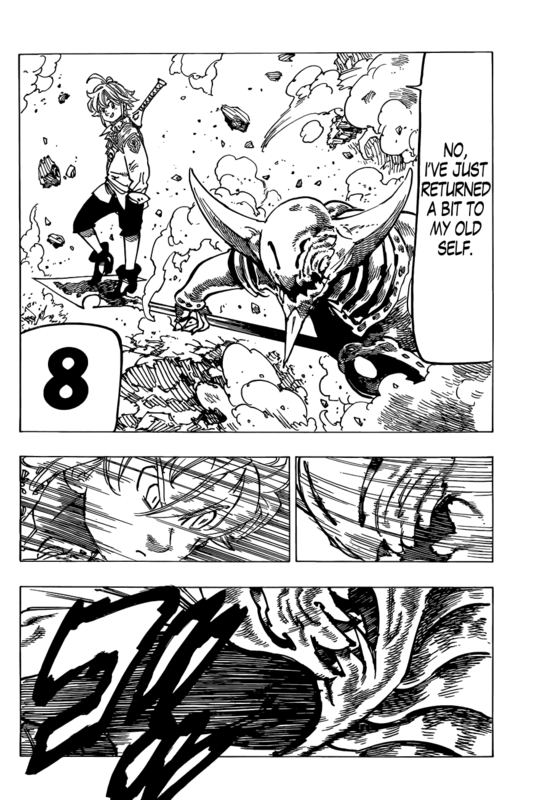 Moves hundreds of meters in 0.5 seconds. 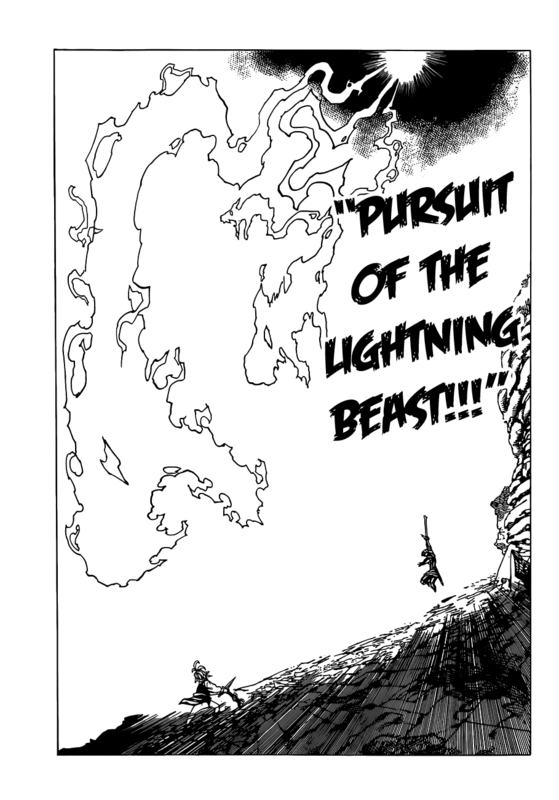 Stated to be faster than sound. 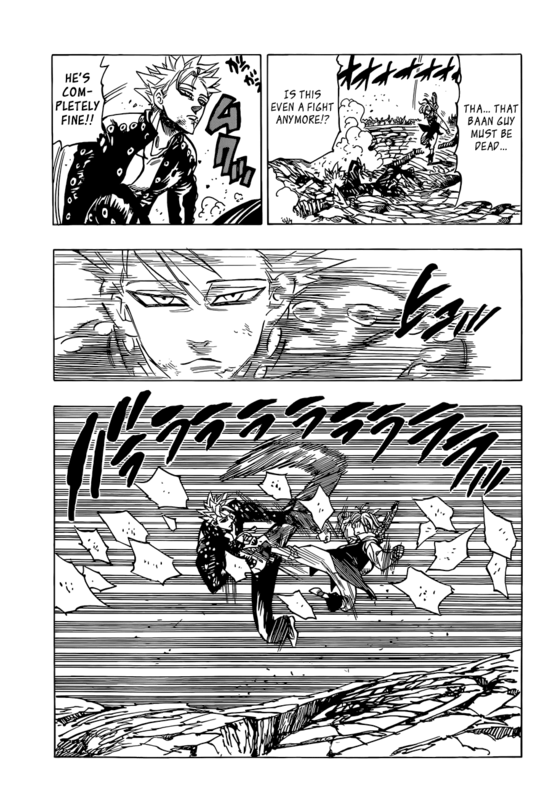 Has an ultra high speed fight. 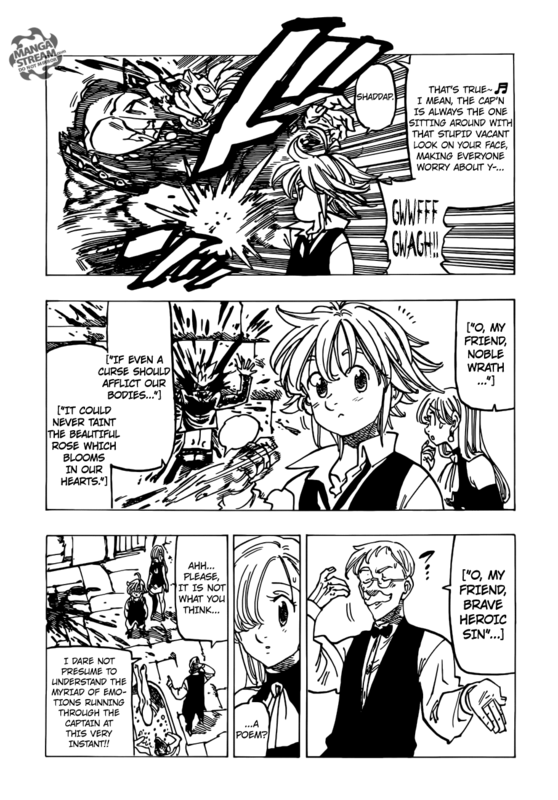 Reacts to a lightning attack from Gilthunder. 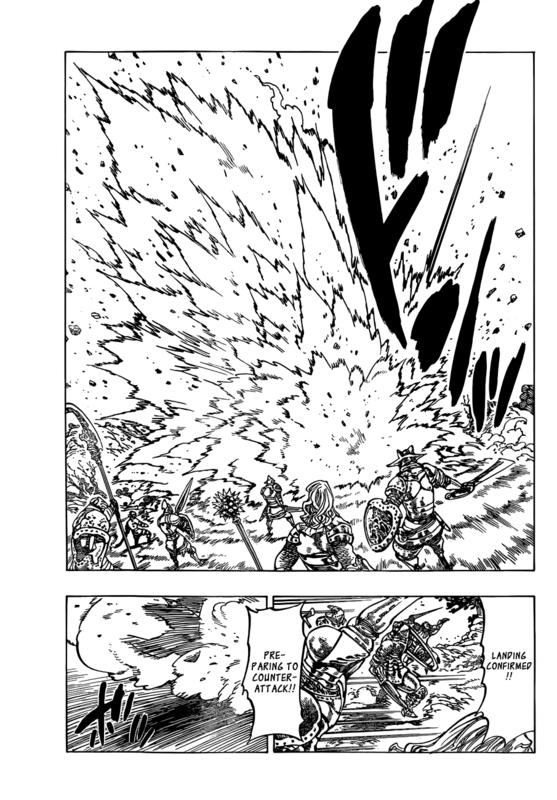 Full Counters a lightning attack. 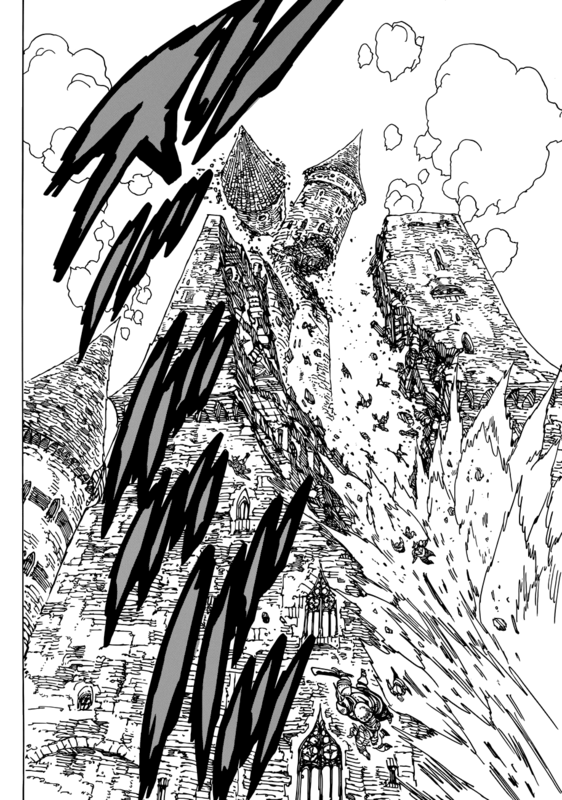 Runs up a building before Gilthunder notices. 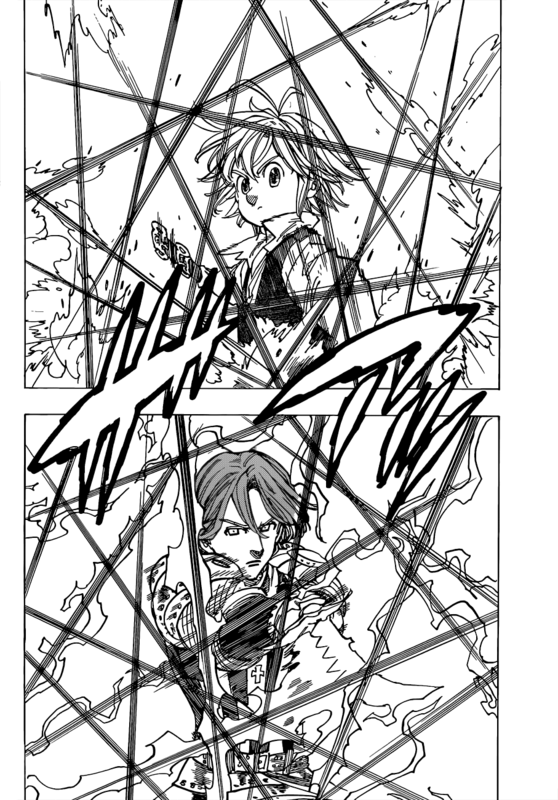 Has a high speed fight with Hendrickson and Gilthunder (Image not available). 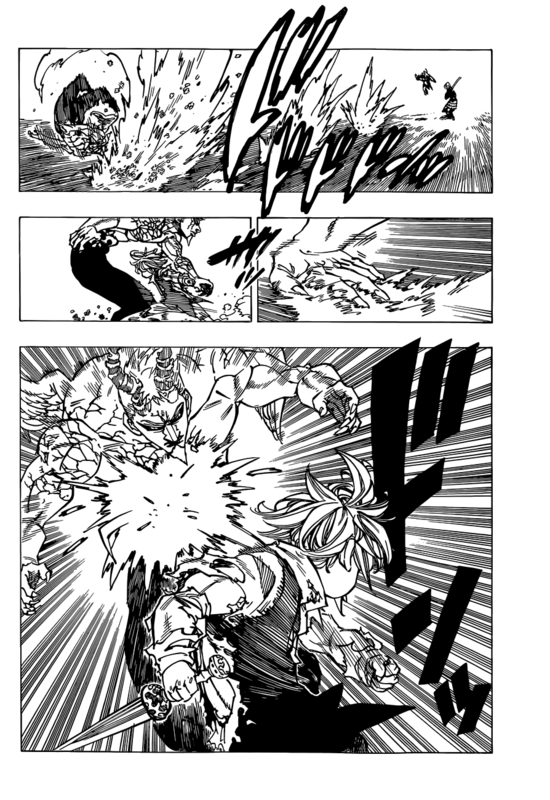 Revolves fast enough to hurt Gilthunder (Not available). 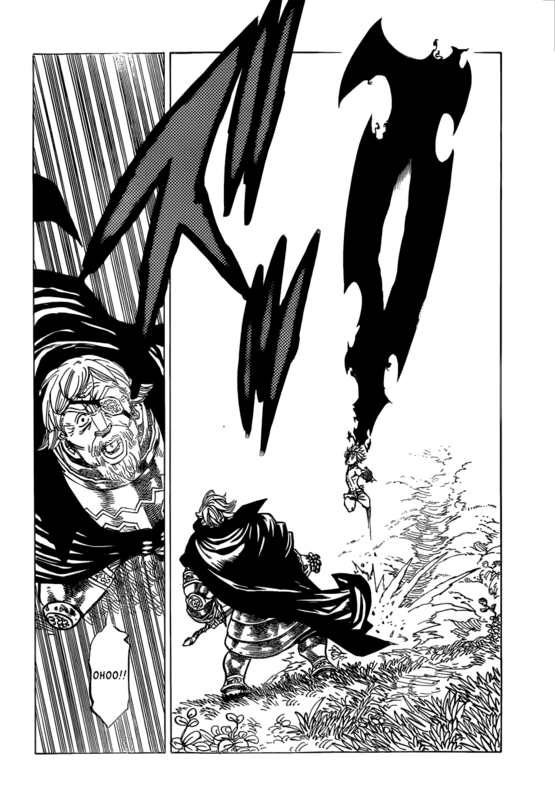 Outspeeds a weakened Grey Demon Hendrickson. 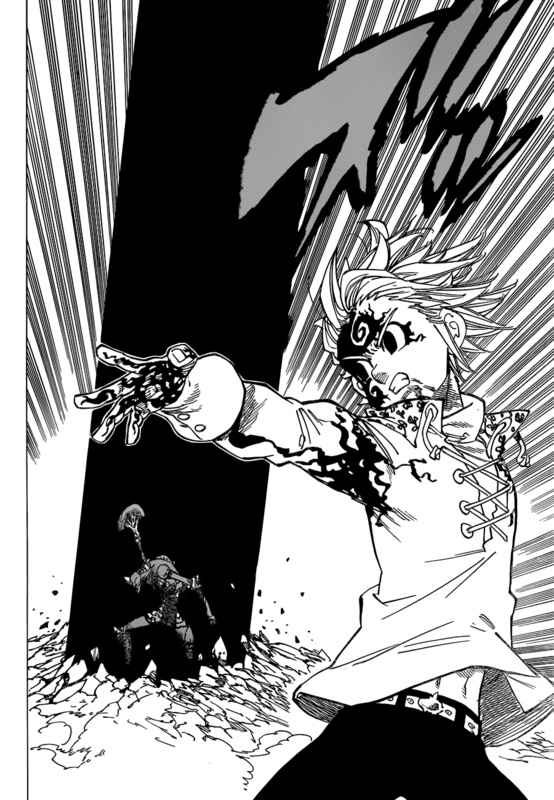 Ban has stolen all of Meliodas' strength, so he goes Demon, crushes Ban's wrist, then blasts his body away, incapacitating him. 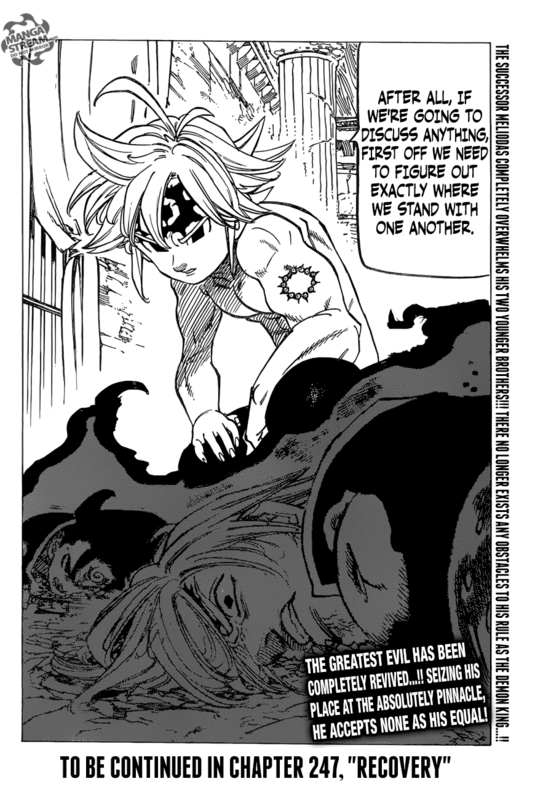 Lost Control of his demon form, allowing him to break out of the goddess amber, which is designed against Demons, and is said to be impossible to break out of. 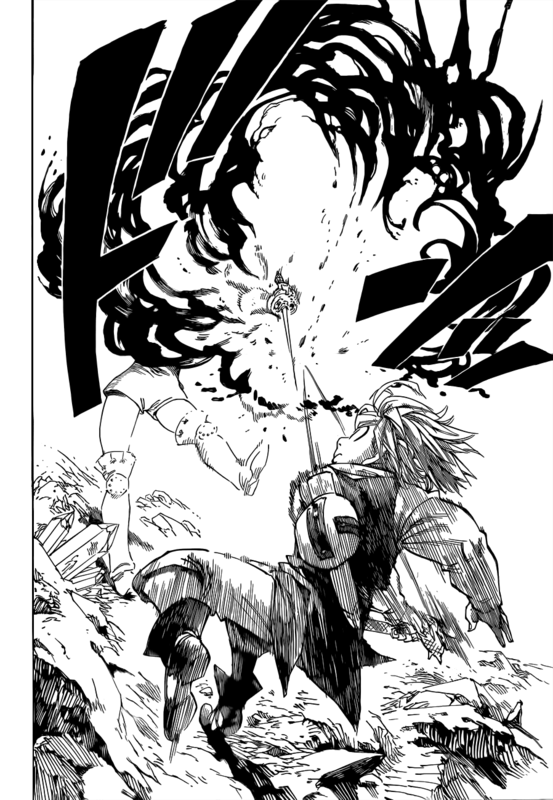 Blitzed Guila, then cuts off her hand without his sword. 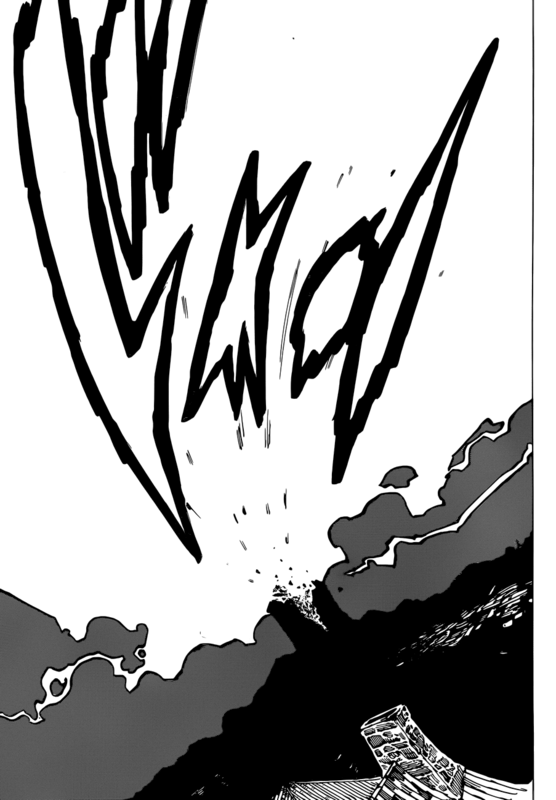 Causes a giant shockwave just by jumping. 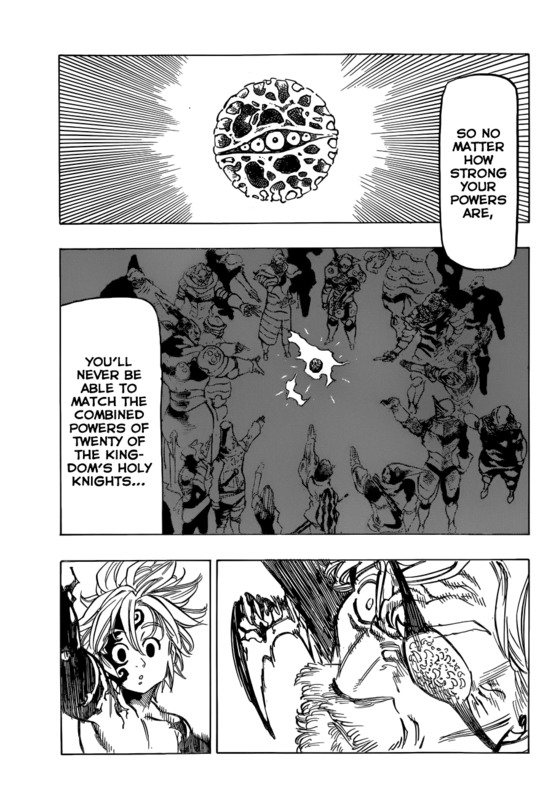 Overpowers Helbram with the power of 20 Holy Knights after evolving his power further. 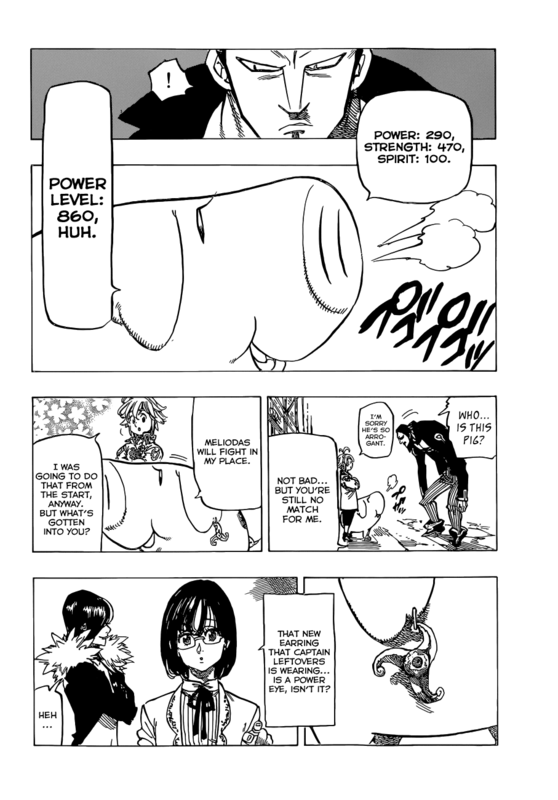 Buffs his power level from 4400 to 10300. 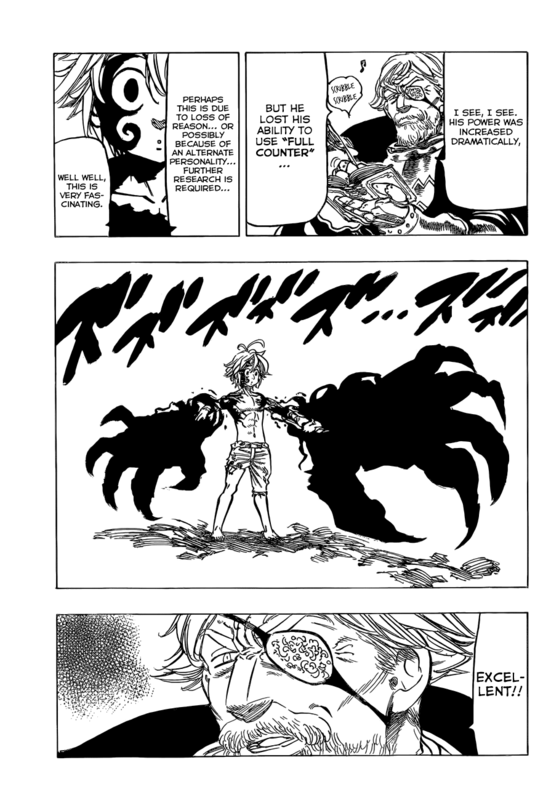 Can control his demon abilities. 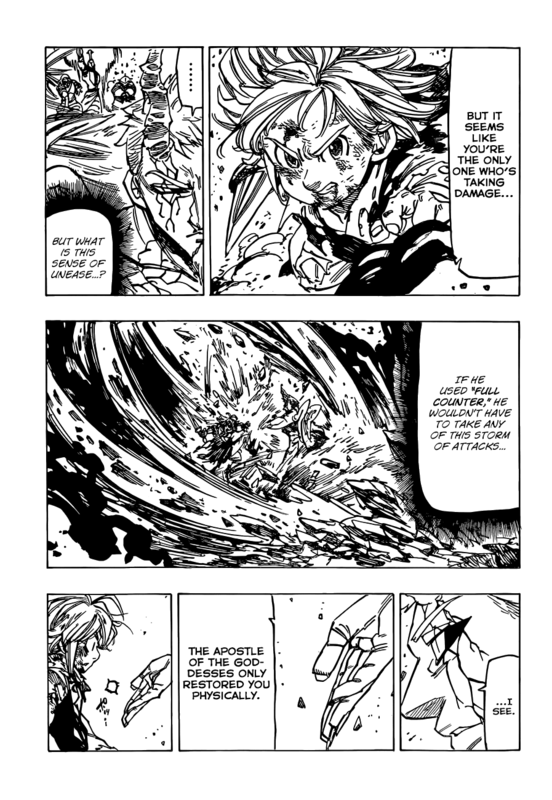 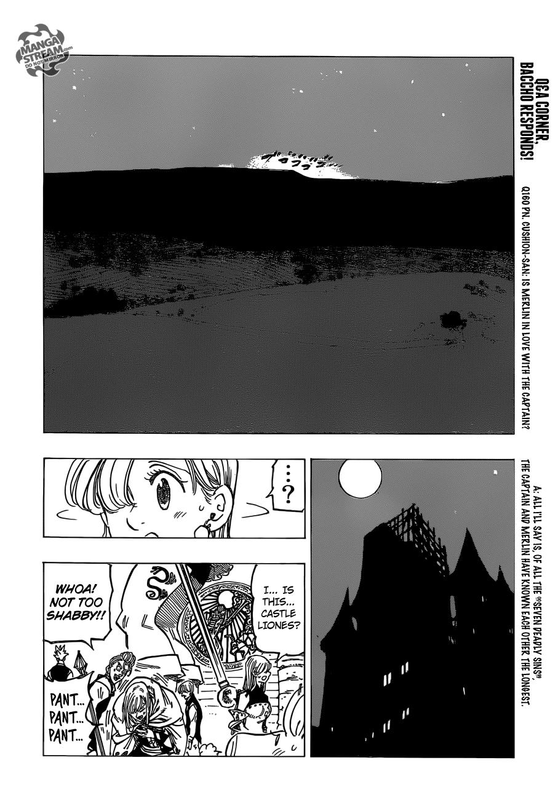 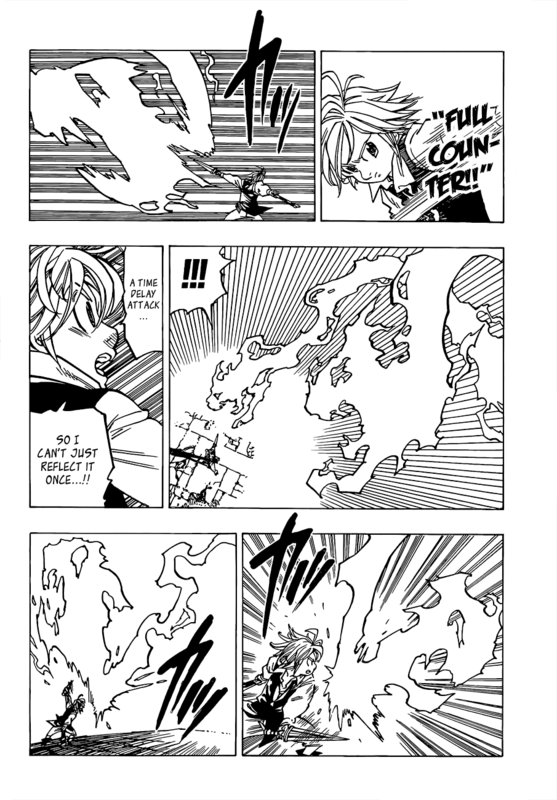 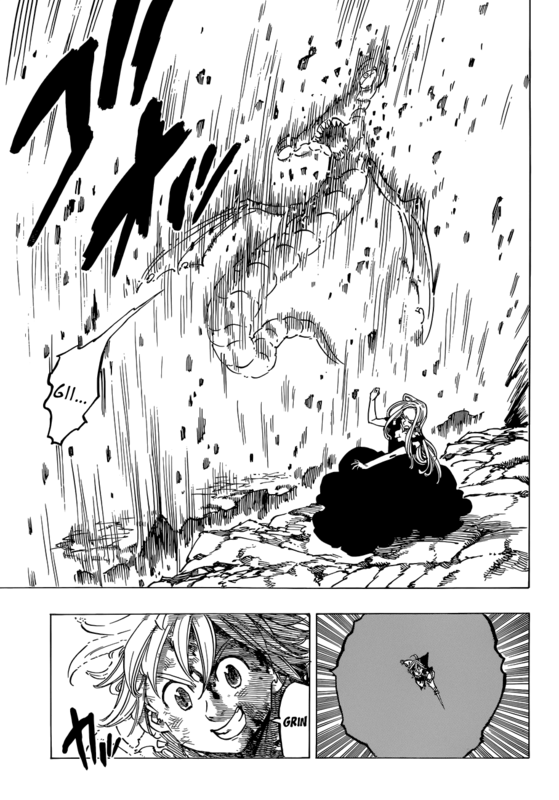 Meliodas gains his full abilities back, which turns the sky dark, and causes tidal activity, with his full capabilities his power shoots from 3370 to 32,500, and that's him while weakened. 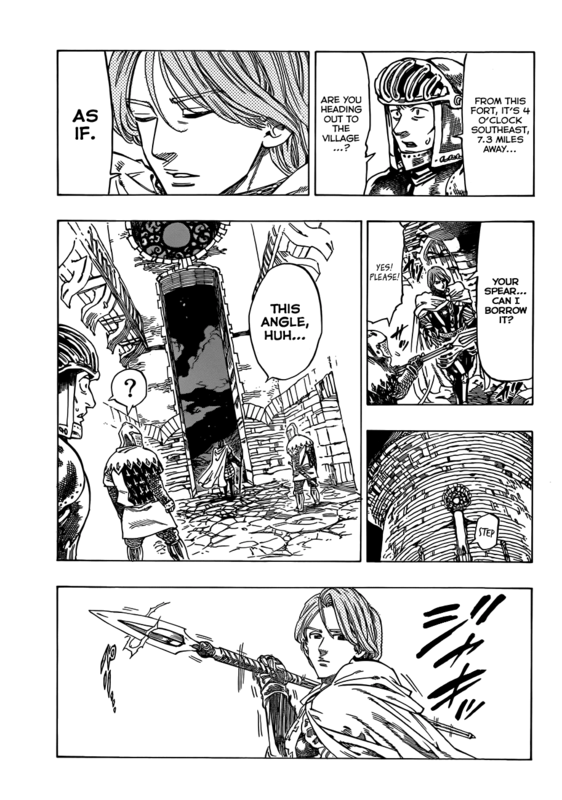 Lifts Rhitta — which Galand couldn't do — with one hand, and carries it throughout their walk the whole time. 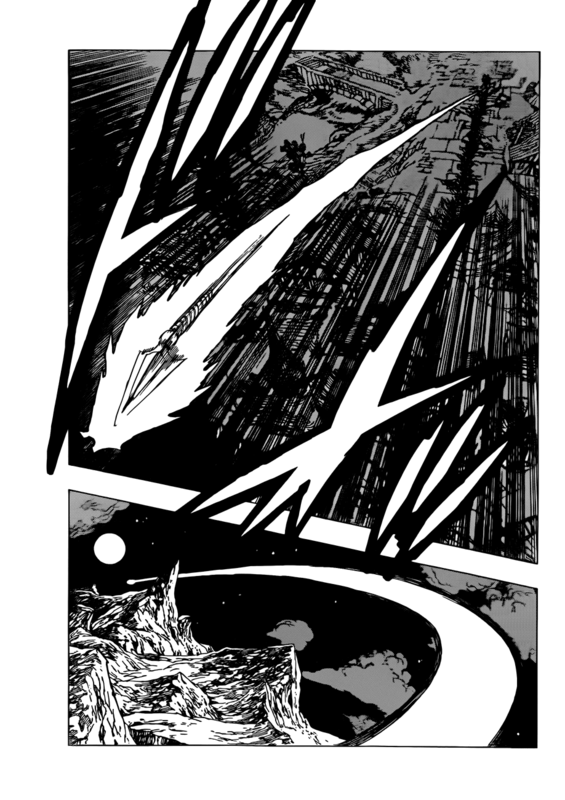 Obliterates a vampire with a Darkness Pillar that cuts a 30,000 foot hole in the ground. 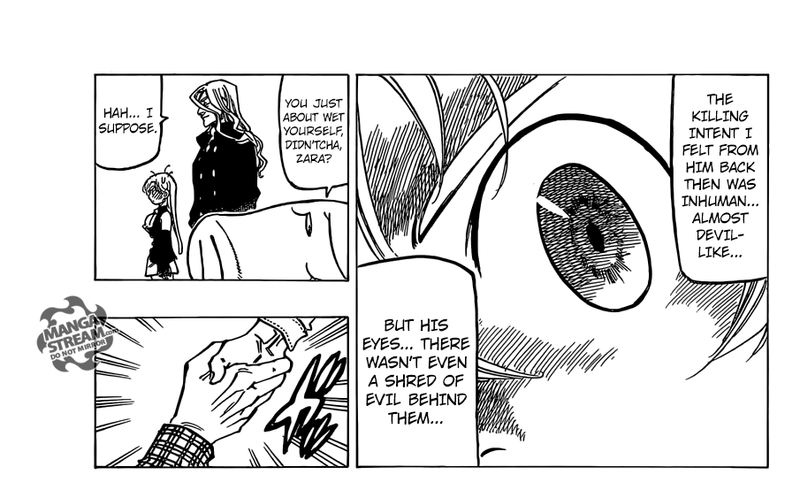 Stomps Zaratras in one panel. 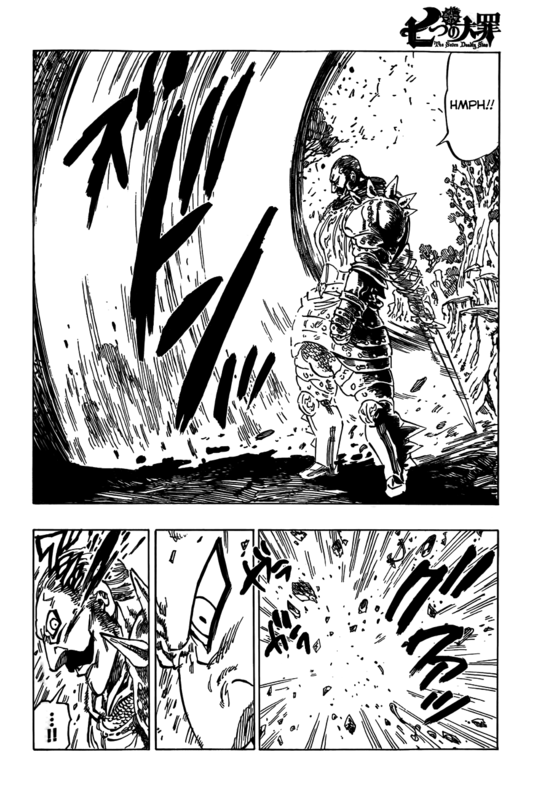 Beats Galand with out any effort, only taking 5 seconds in total. 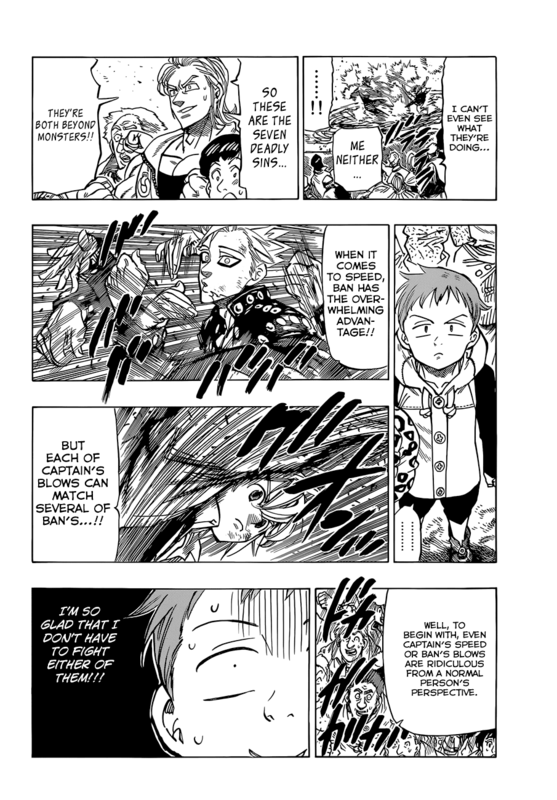 Kills a buch of monsters that Dianne's Sacred Treasure couldn't scratch. 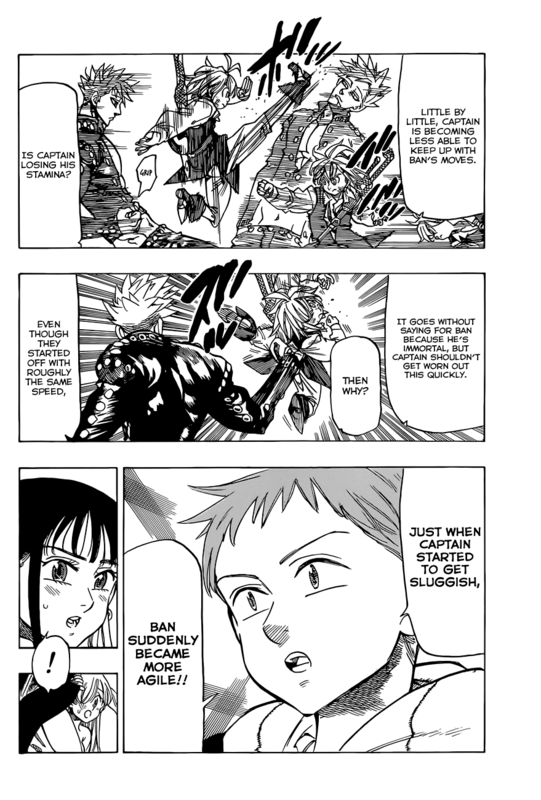 Destroys Ban with a tap. 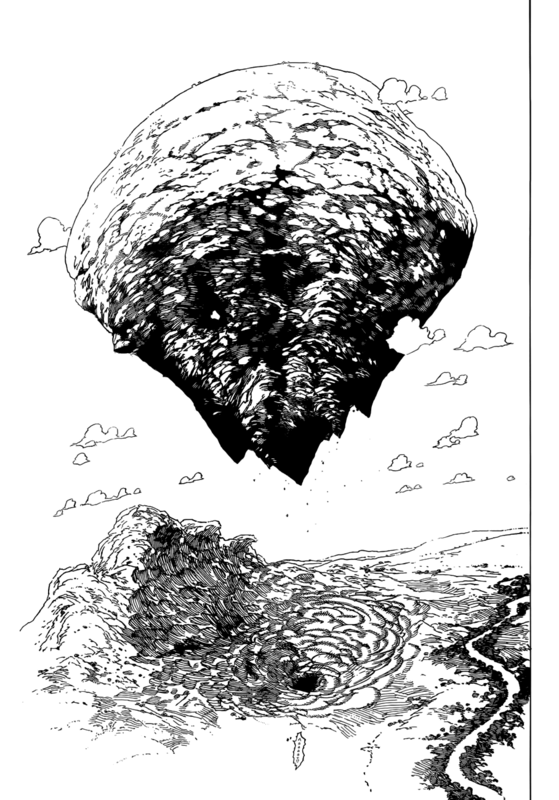 Swinging his sword craters the ground and carves in some a hill, and through another. 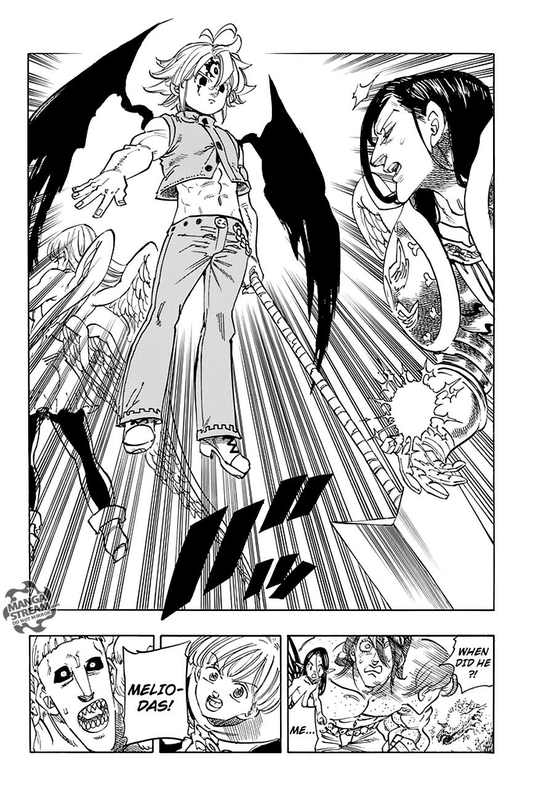 Kicks Ban hard enough to kill a Blue Demon. 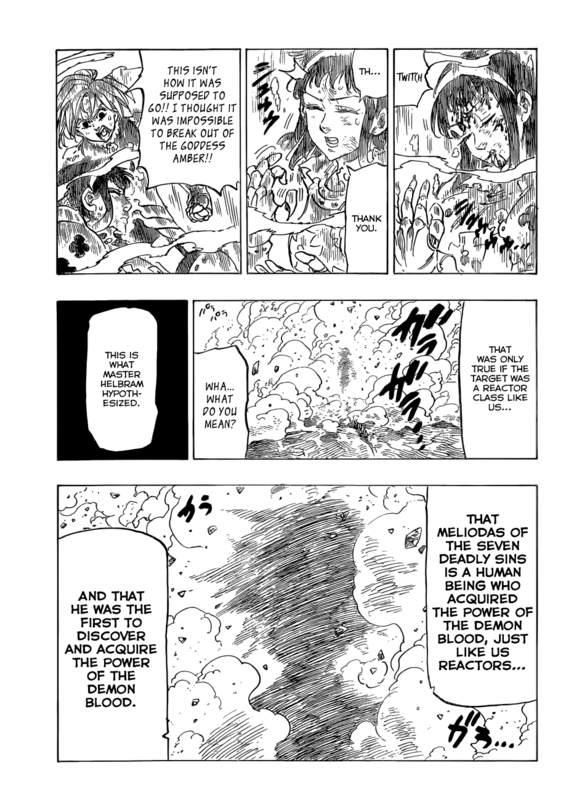 Note: Some people might say that durability feat 4-6 are in Demon form, that's not true. 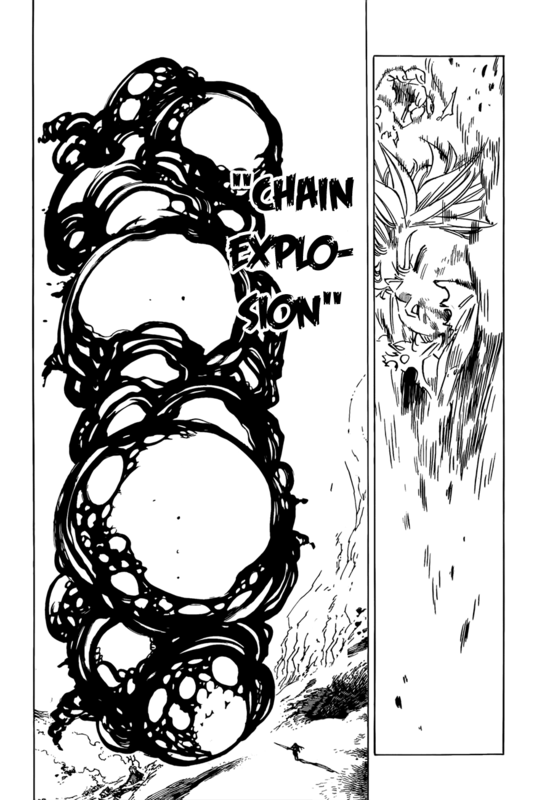 Slammed hard enough to break the ground. 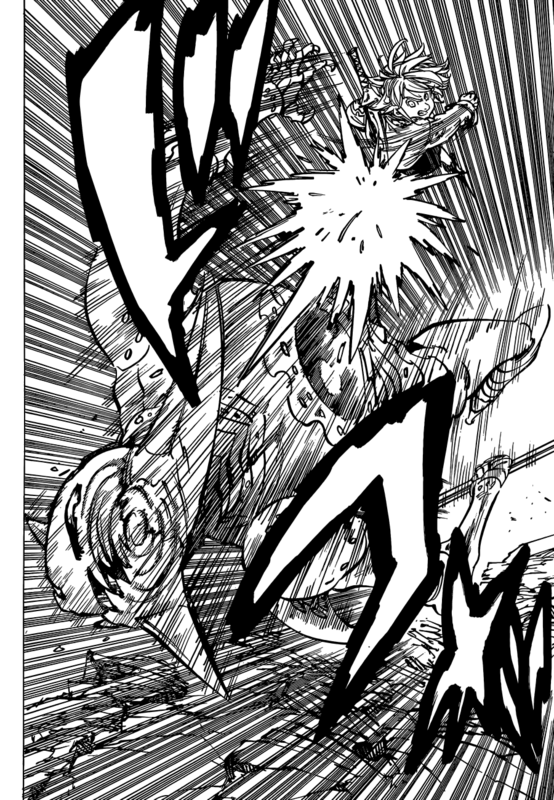 A Blue demon breaks its foot off hitting him. 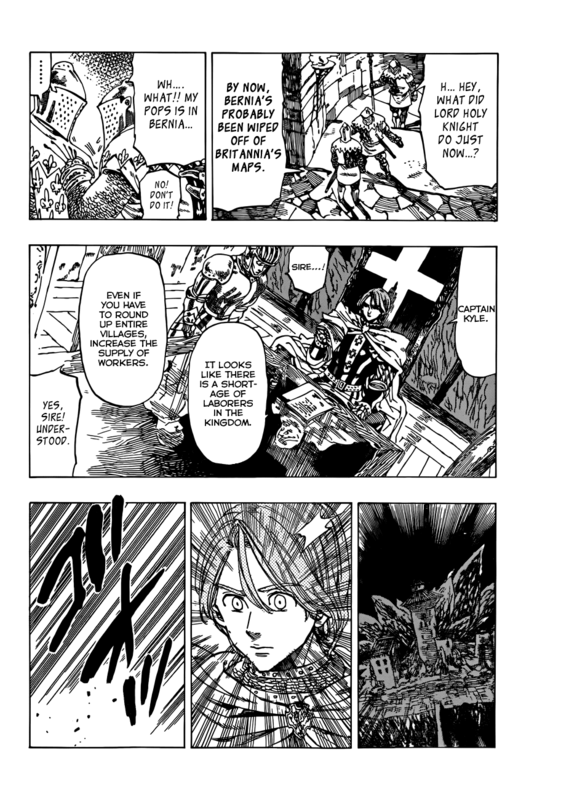 Tanks a trip to nuke town from Gloxina. 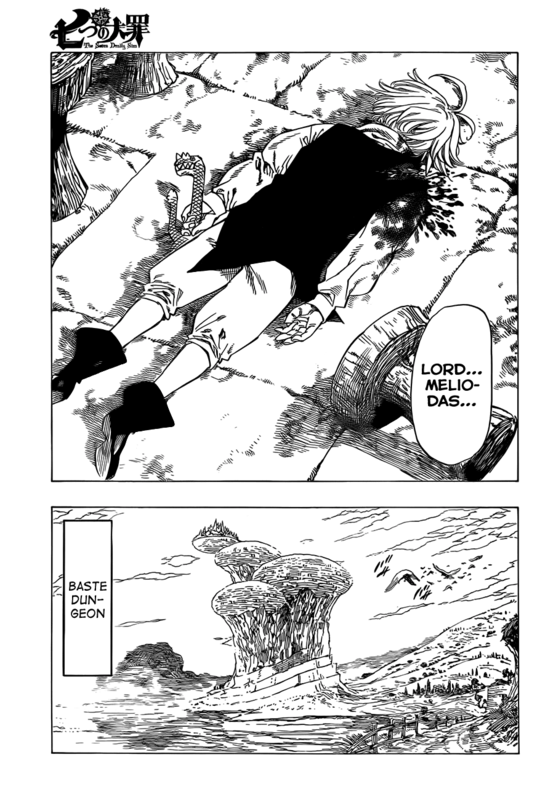 Withstands an attack from Gloxina while half dead. 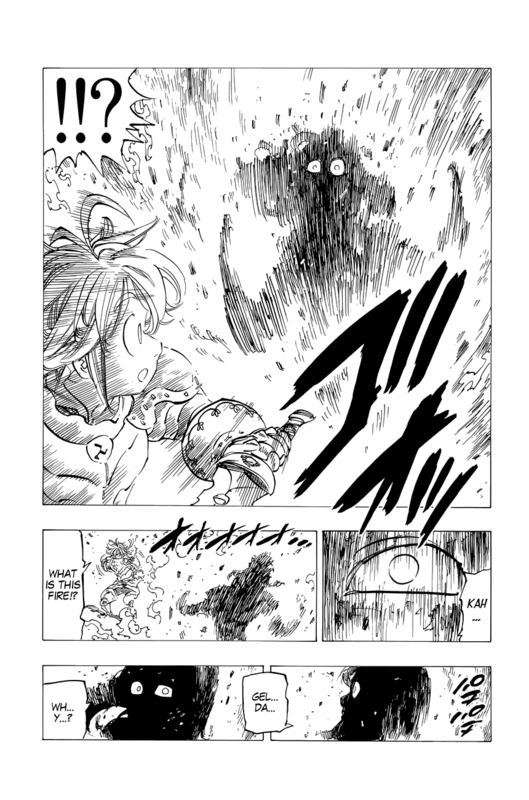 Withstands an attack from Fraudrin. 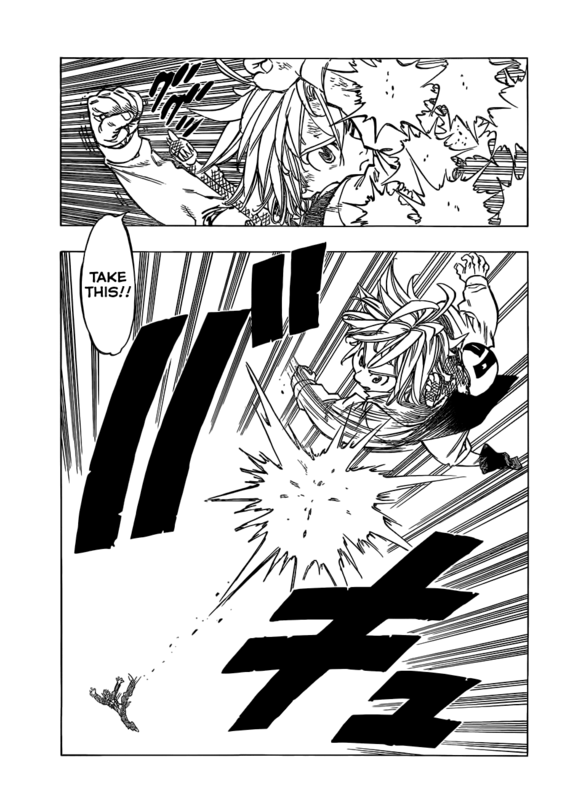 Easily deals with a Vampire's speed, with fodder Vampires being able to keep up with sin level beings. 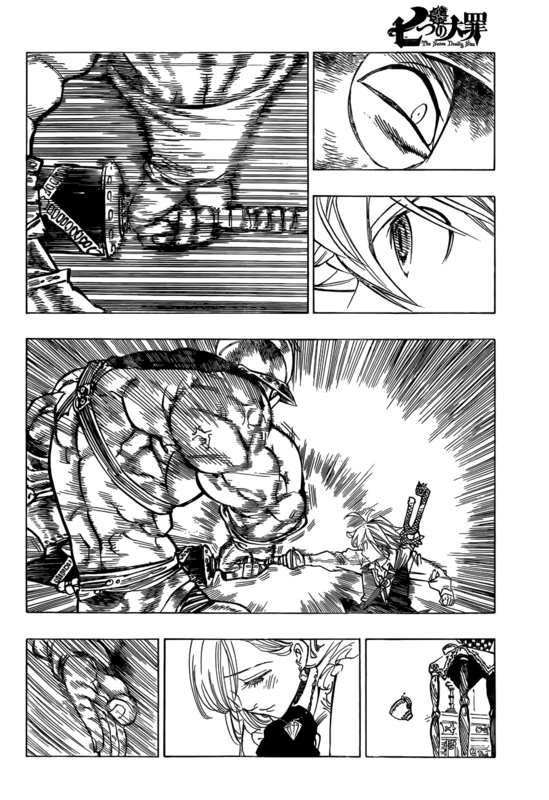 Destroys Danafor, which is shown multiple times. 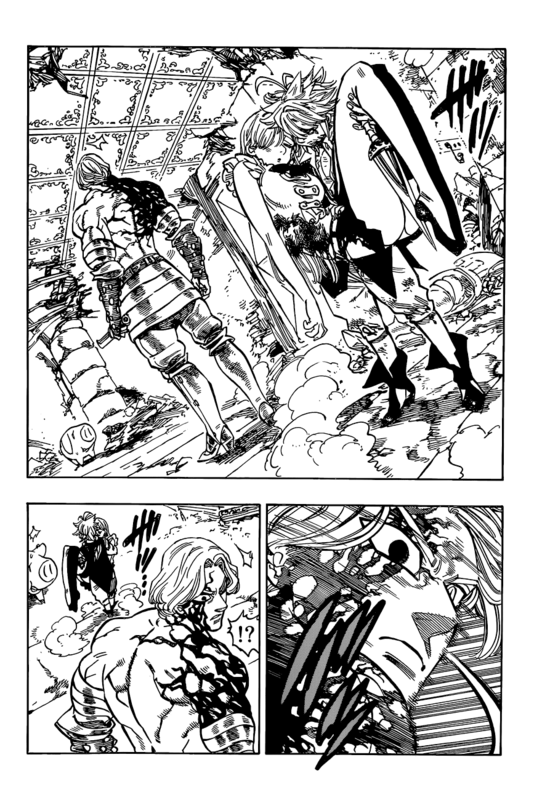 Chops up Gloxina's attacks, then nearly kills him. 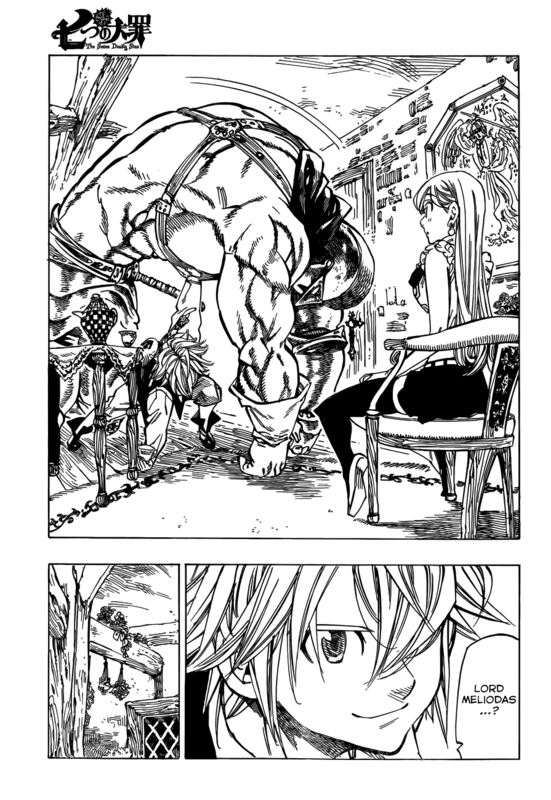 Tanks a full strength Drole's Giga Crush. 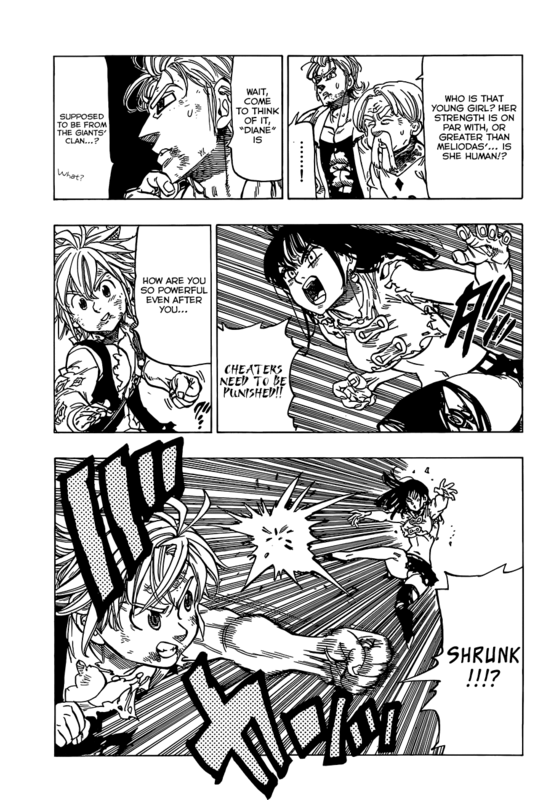 Easily beats up Gloxina and Full Strength Drole. 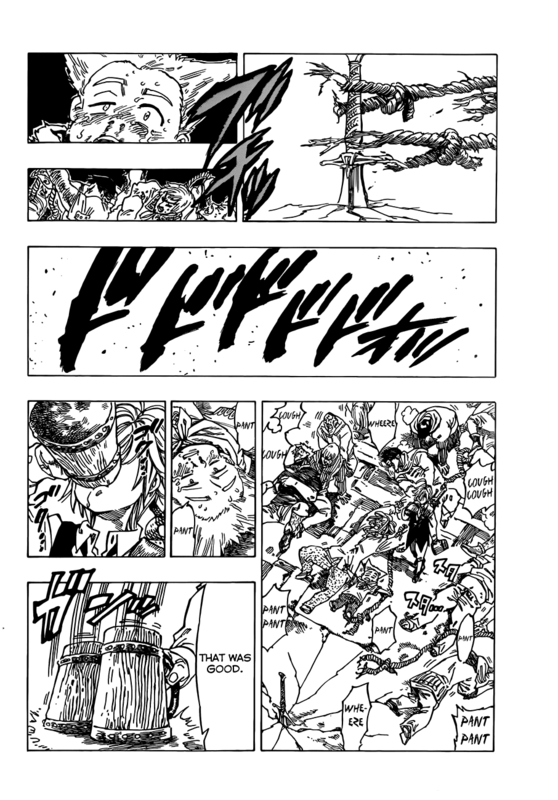 Blocks dozens of Combo Star attacks from Derieri, though they do break his guard and cripple his arms eventually. 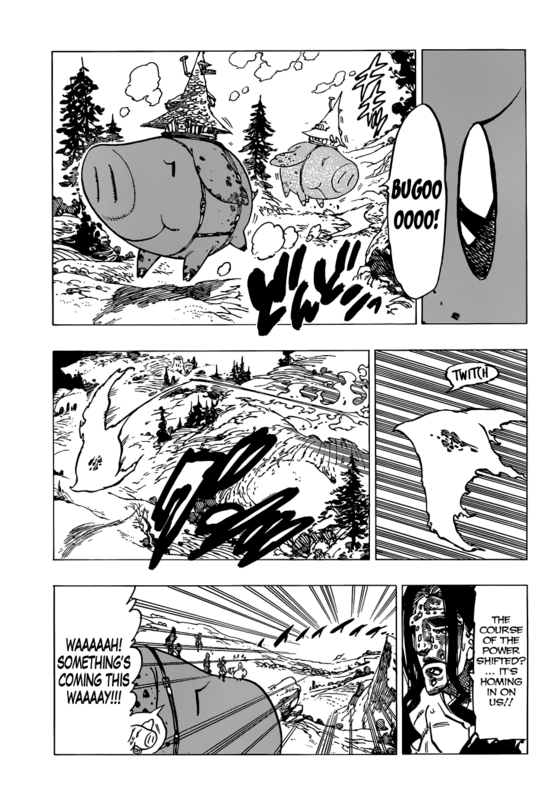 Moves many kilometers in 2-3 seconds. 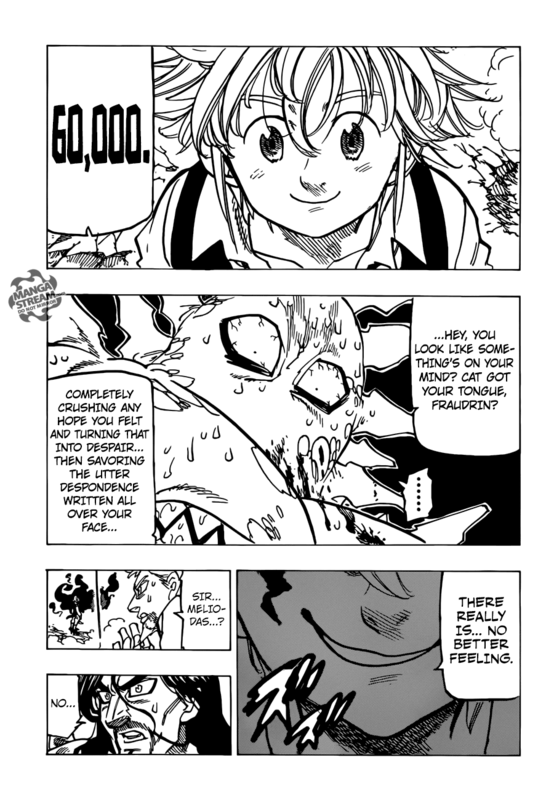 Power Level of 60,000 in base, making him stronger than his Previous Demon Form . 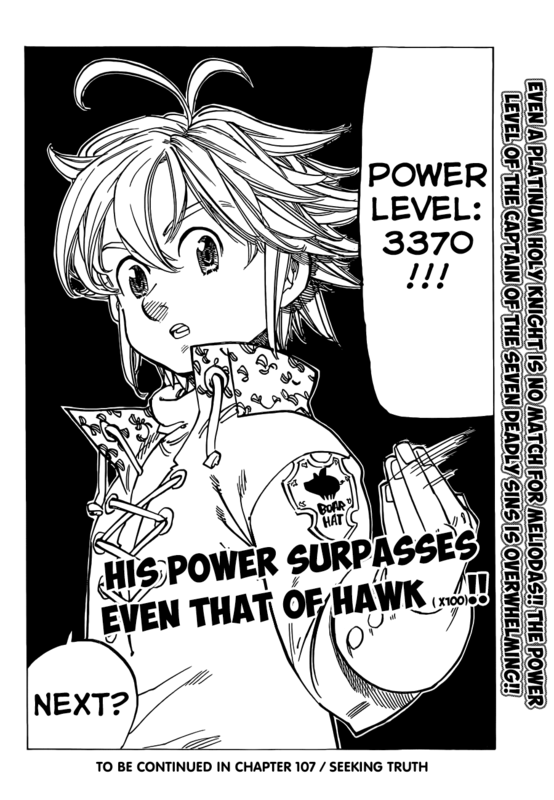 Credit to Zero7772 for this: Had 10x the power level (Combat Class) of Hawk as an infant. 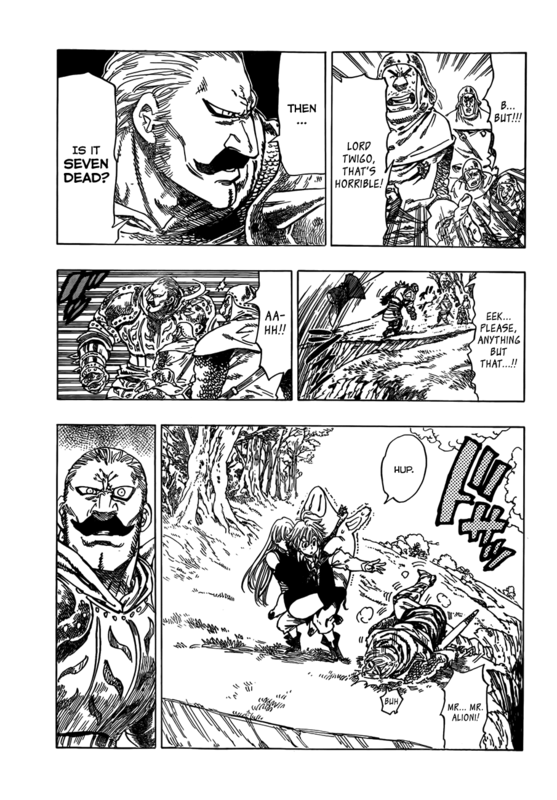 Vastly Superior to Drole and Gloxina. 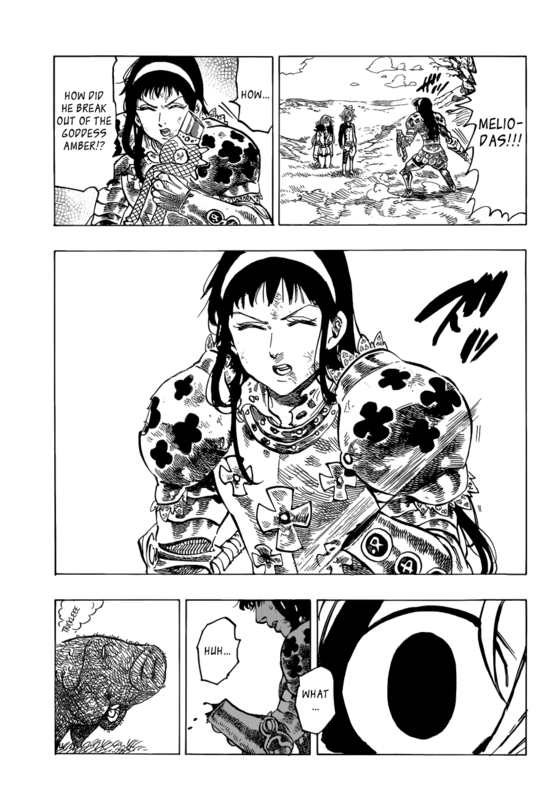 Punches Derieri's rib out her chest. 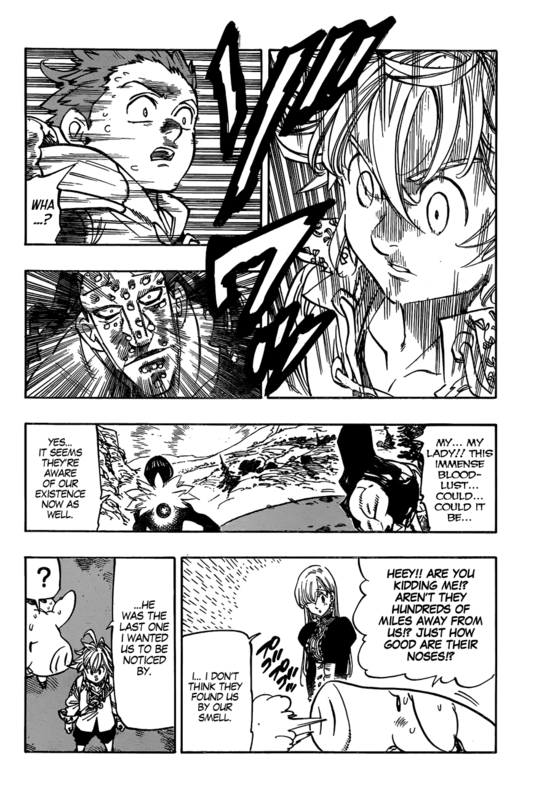 Pretty easily beats on Derieri. 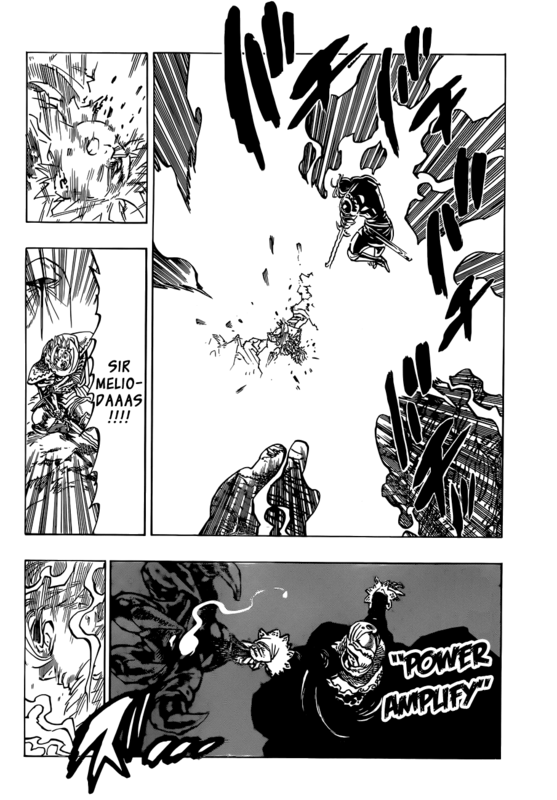 Half power clone beats up Fraudrin. 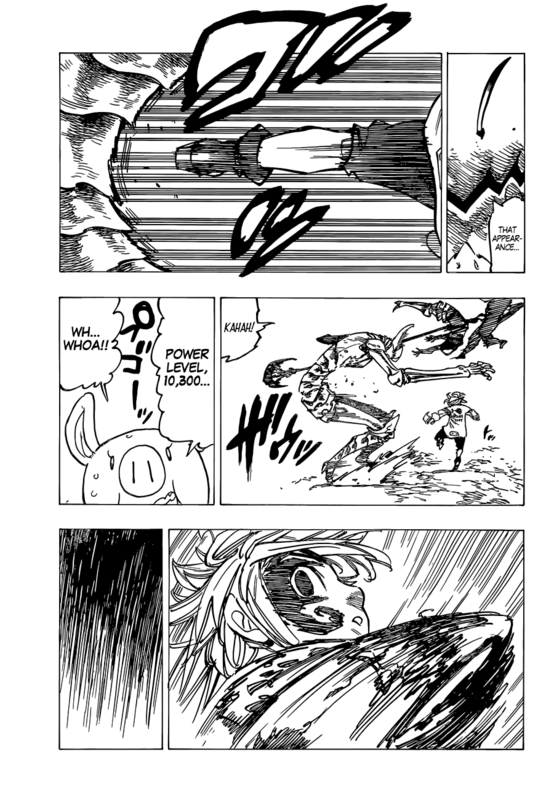 He was at half power level, not half strength, speed, etc. 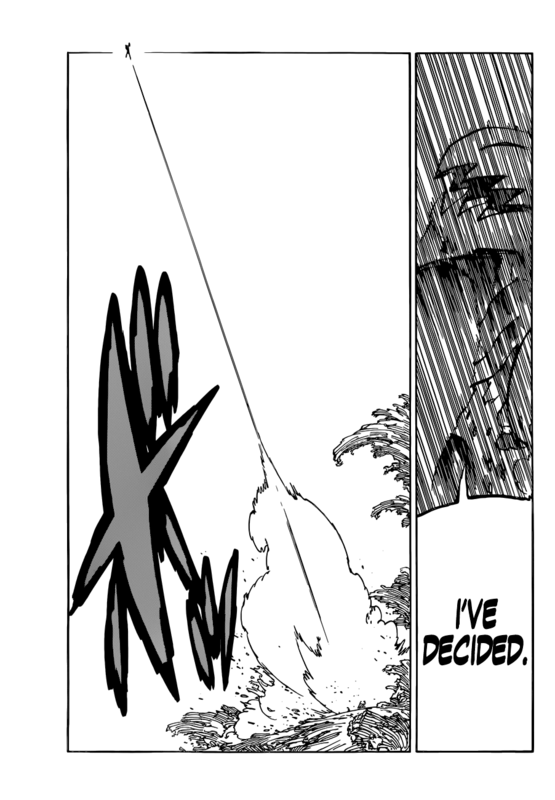 Easily beats Ban and King, only using a flick on the latter, which also takes out a mountain. 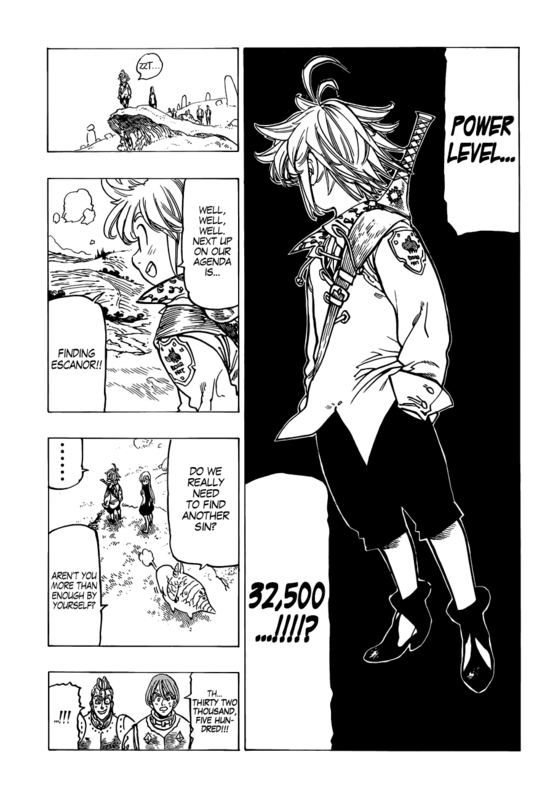 King recently raised his PL to over 41,600. 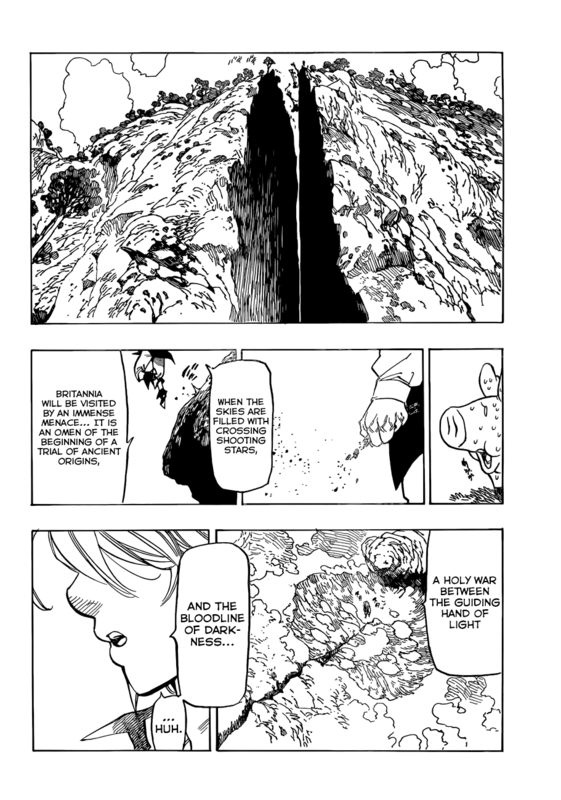 Could withstand a magical barrier made of Goddess Magic, which breaks down darkness particles. 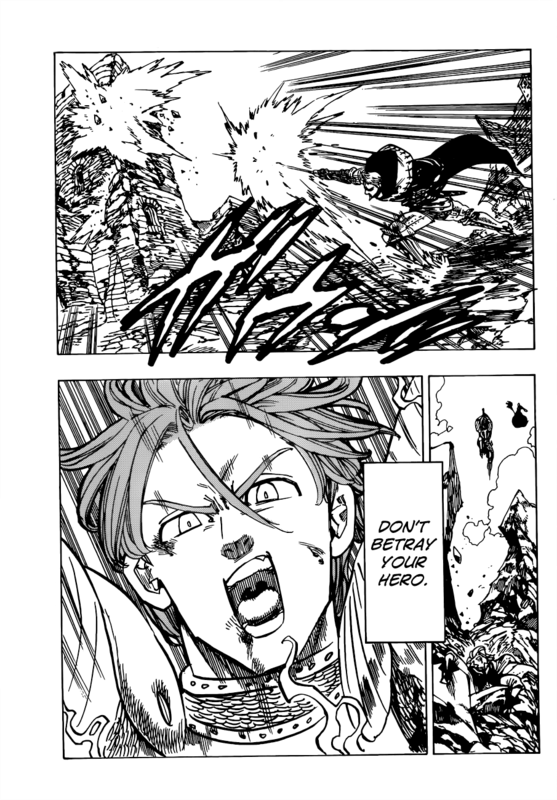 His half power clone tanks a hit from Fraudrin. 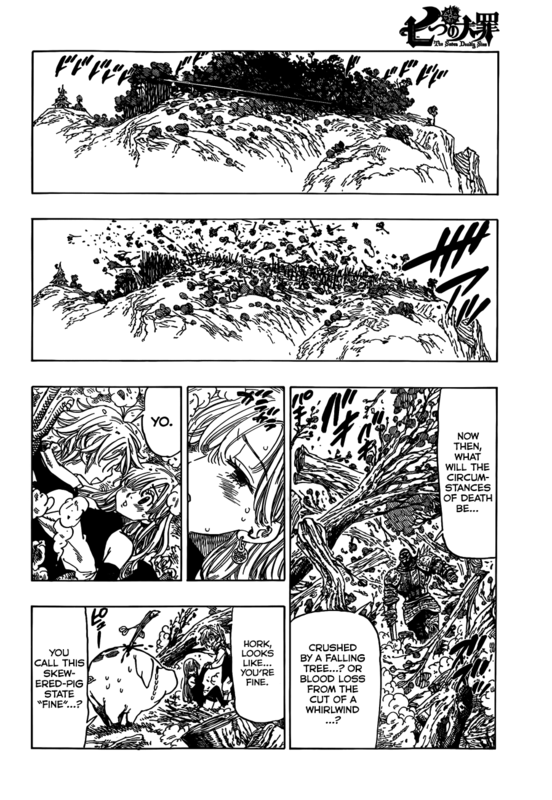 Blitzes hundreds of Demons. 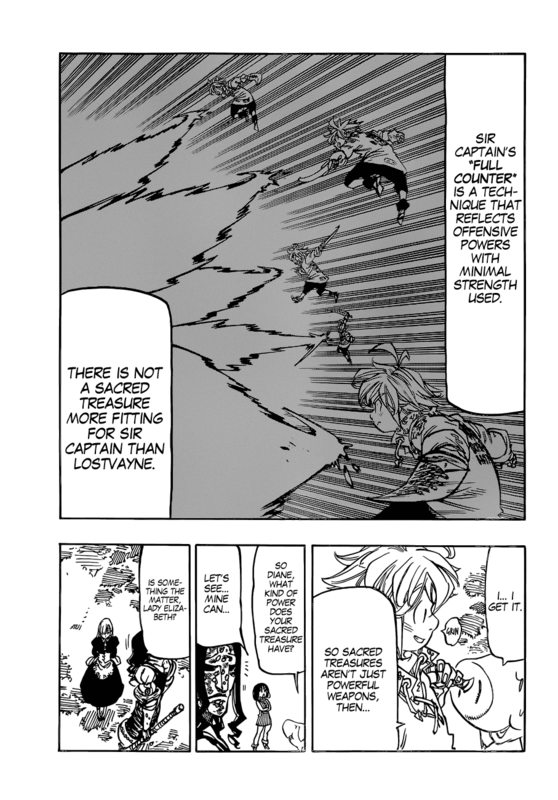 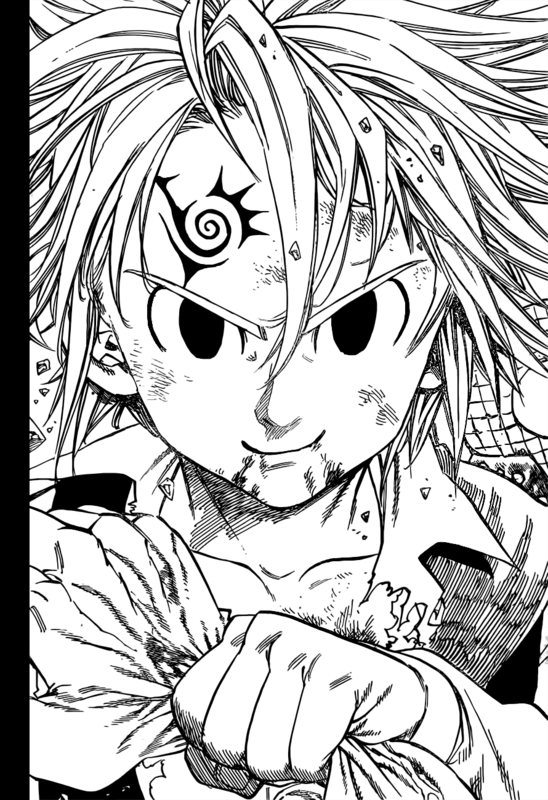 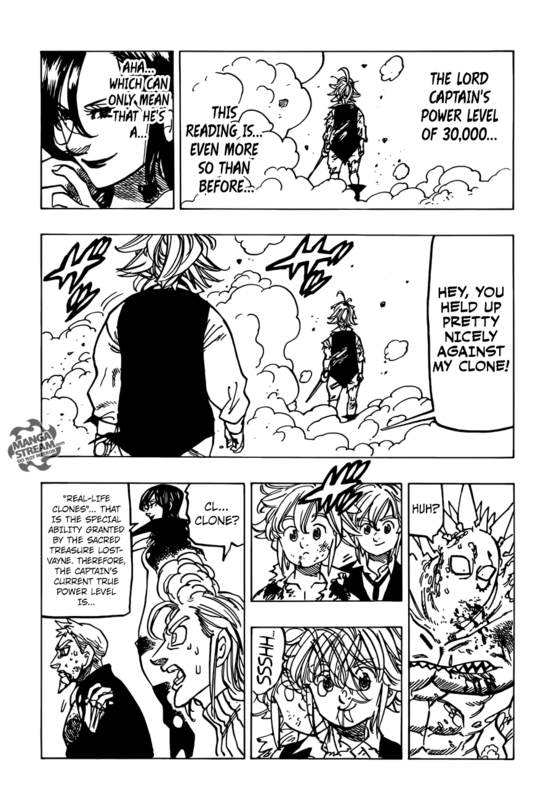 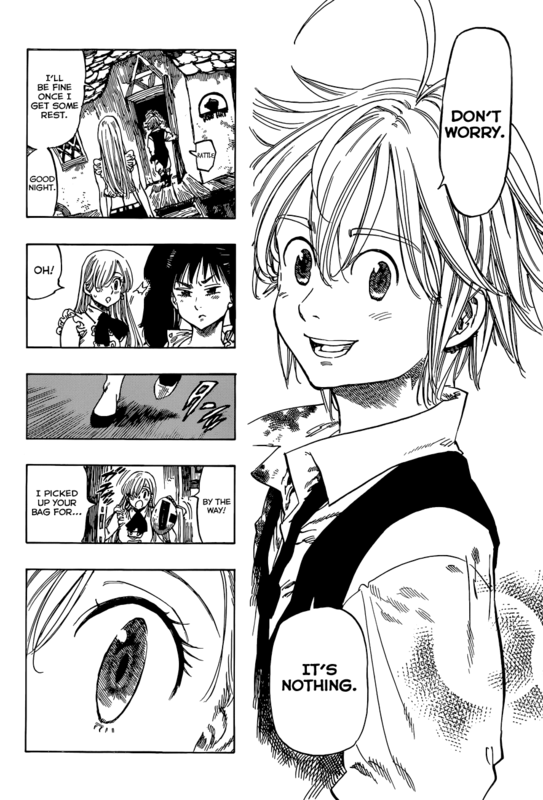 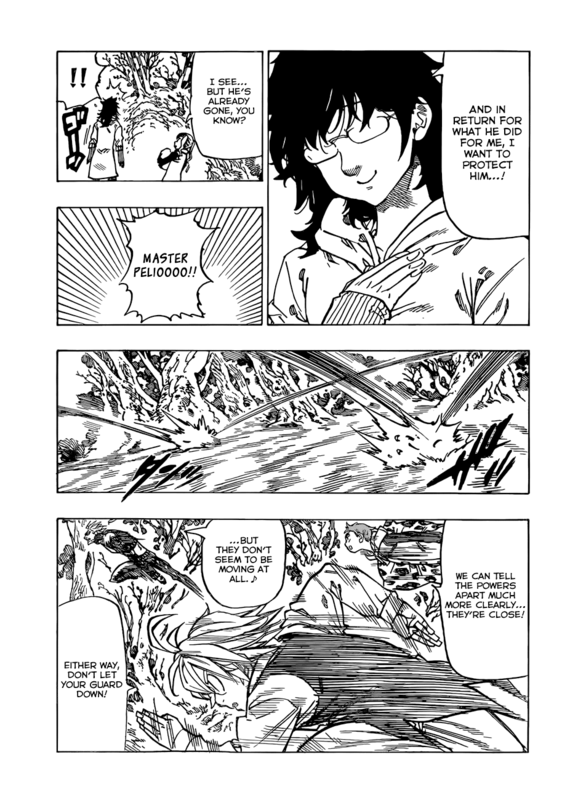 - Note: Grey Demons can keep up with Ban and Restricted Meliodas level opponents. 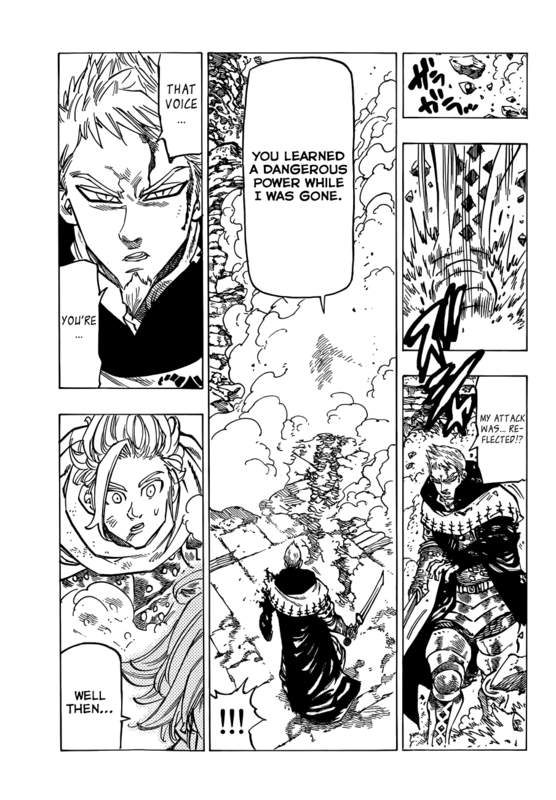 Half power clone blitzes Fraudrin. 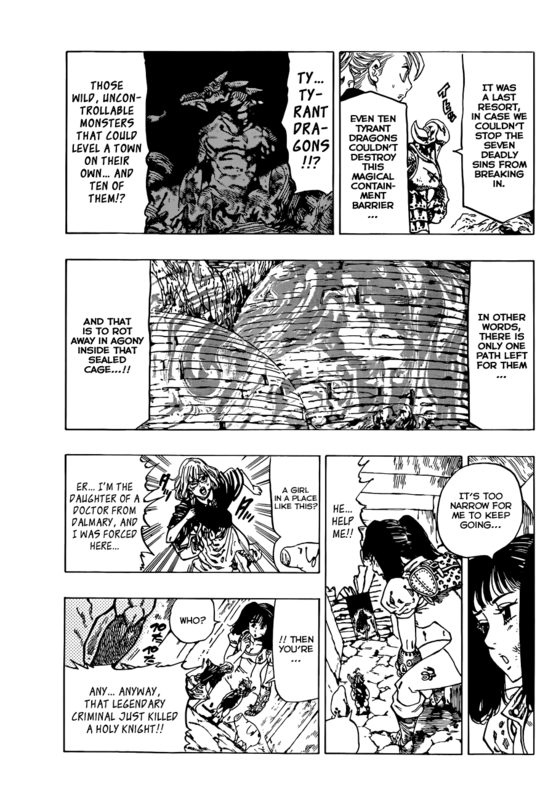 Is the strongest out of the Ten Commandments, and the Goddess Clan were afraid of him. 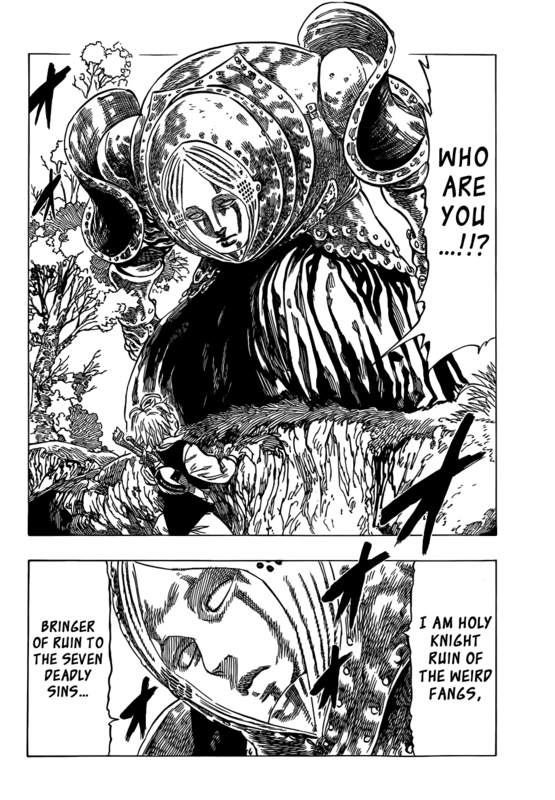 He is also the successor to the Demon King. 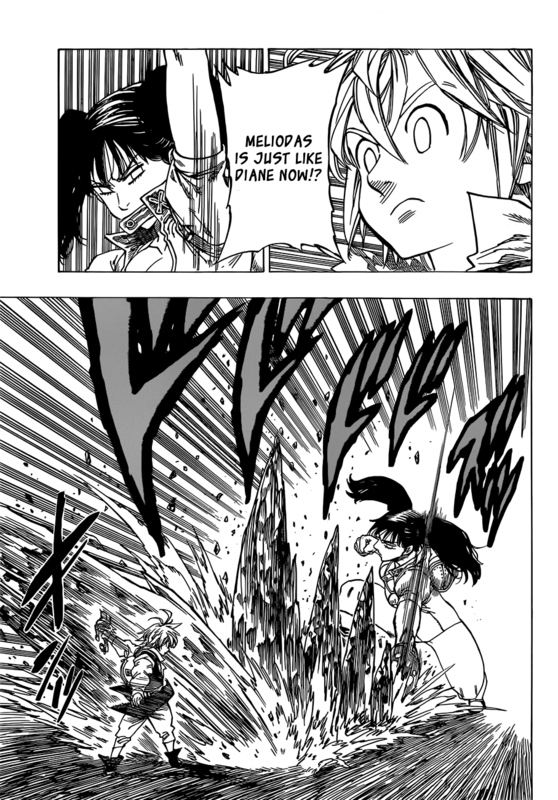 He and Estarossa defeated groups of Archangels with Meliodas killing the Angel shown in the Middle by throwing his sword. 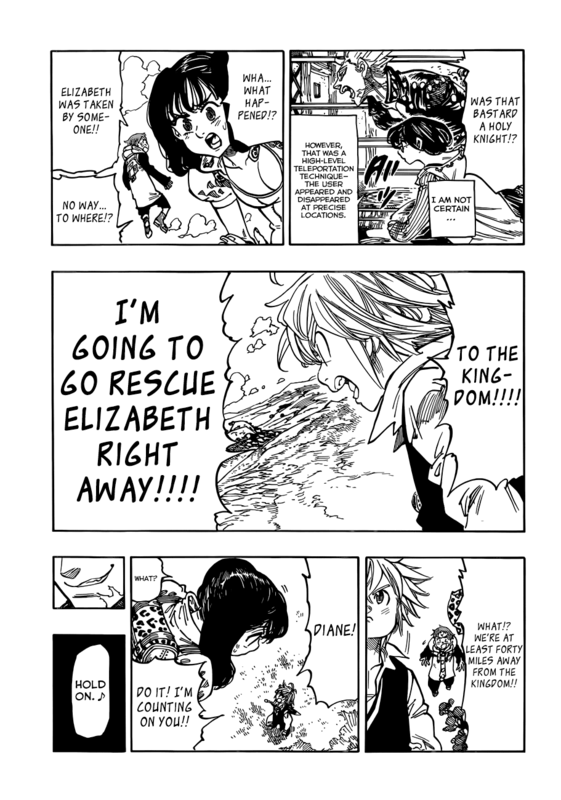 Keeps up with the Goddess Elizabeth. 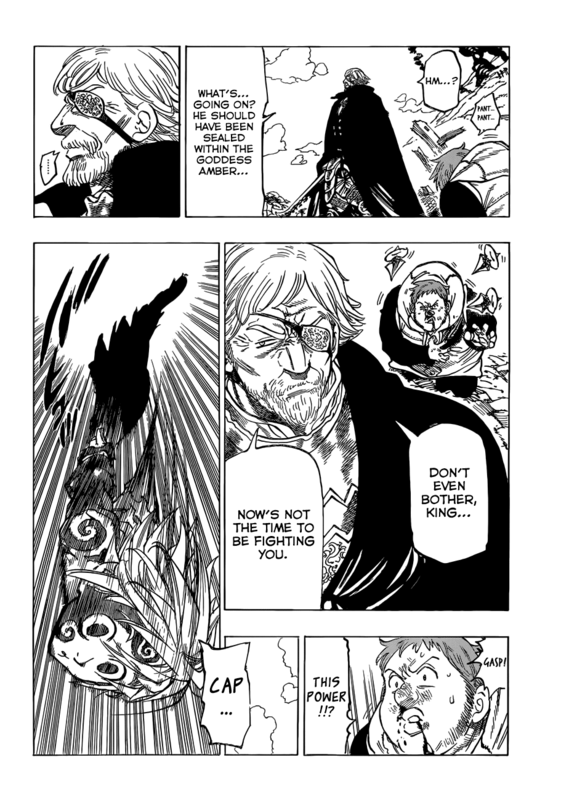 Demon king = All the Commandments combined. 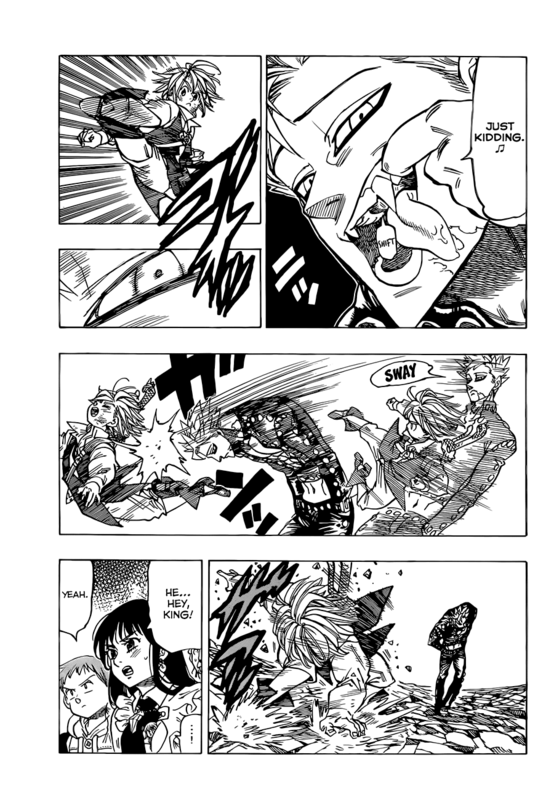 Beats up Fraudrin with ease. 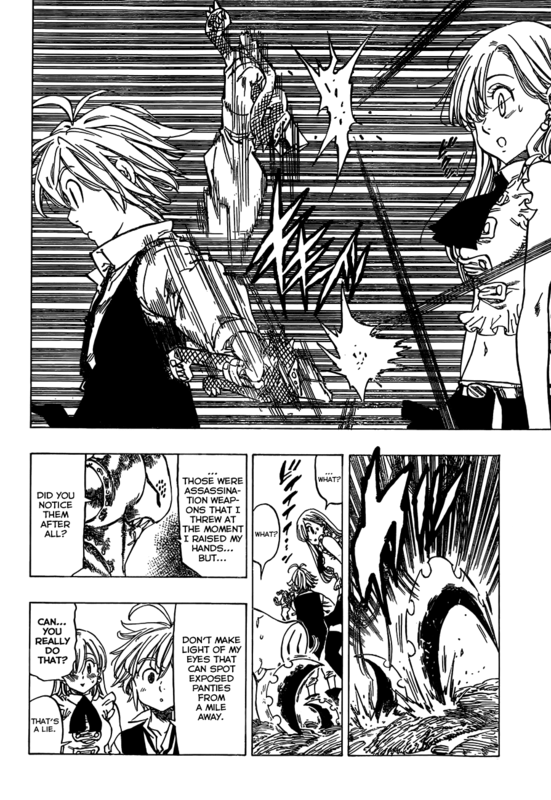 Merlin says he can take Fraudrin's self destruction, which has enough power to destroy Liones. 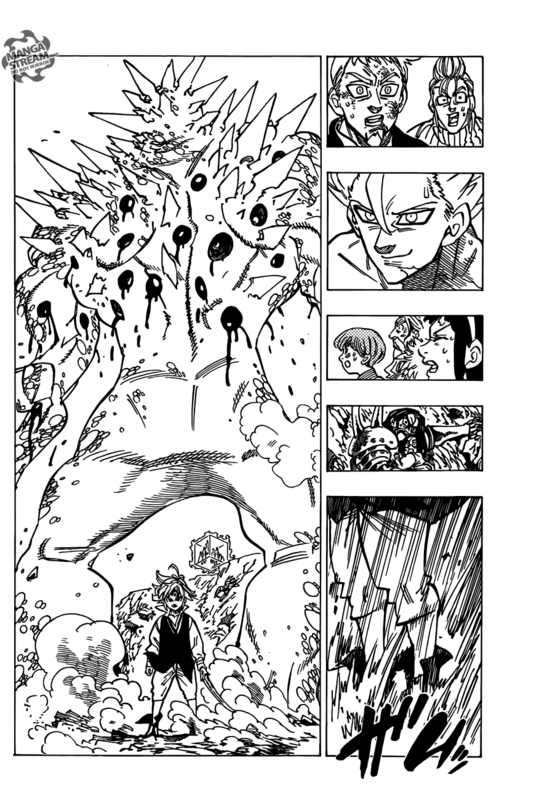 One shots the Massive Fraudrin. 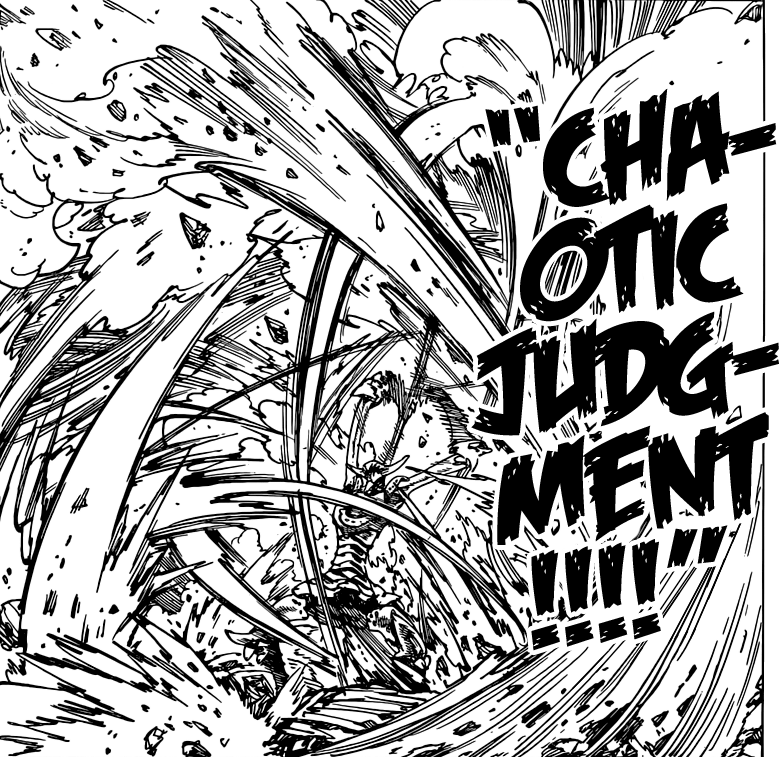 Destroys a bridge without contact to it. 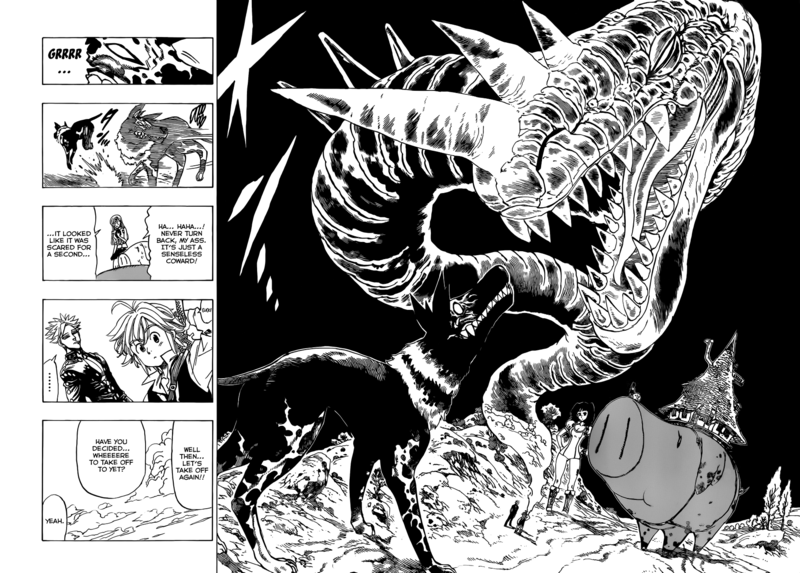 Is the successor to the Demon King. 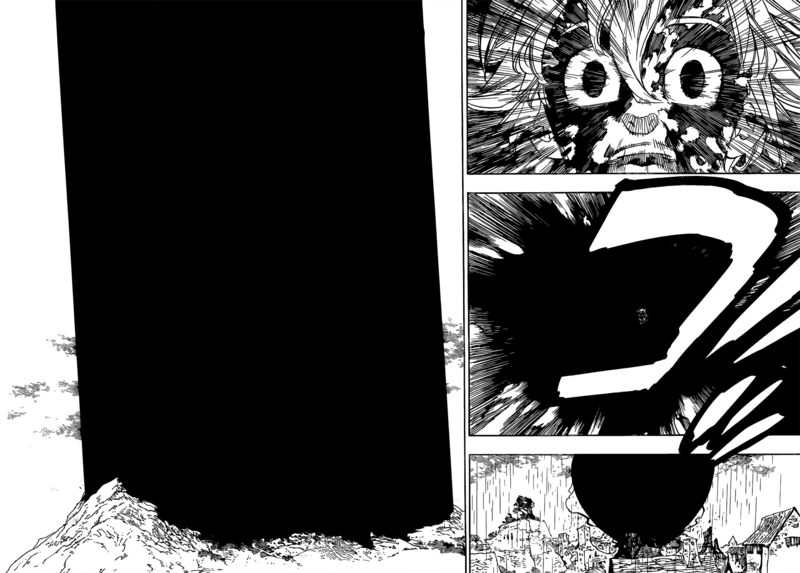 Breaks the Dark Cocoon without even fully transforming, which his Demon form couldn't do at all. 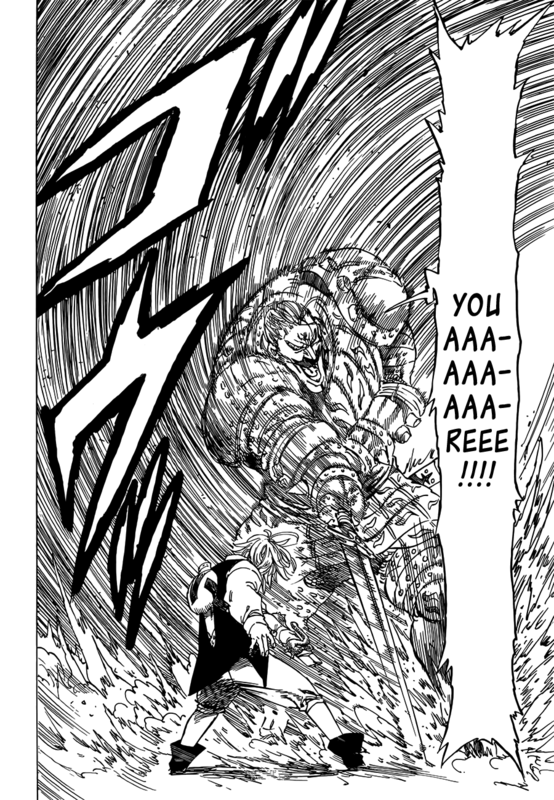 Note: He doesn't even use his full strength of his Assault form at first. 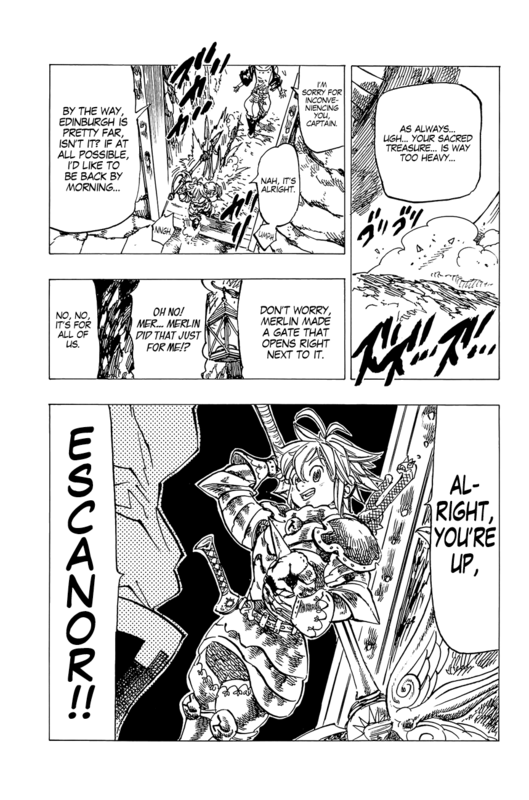 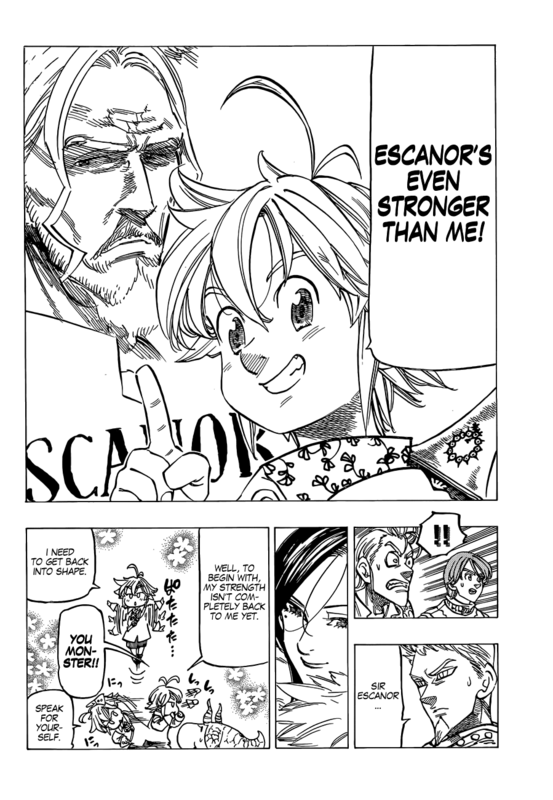 Effortlessly Stomps Escanor who had a PL of 114,000, and was a few minutes from Mid Day, but was 30 minutes when he stomped Estarossa. 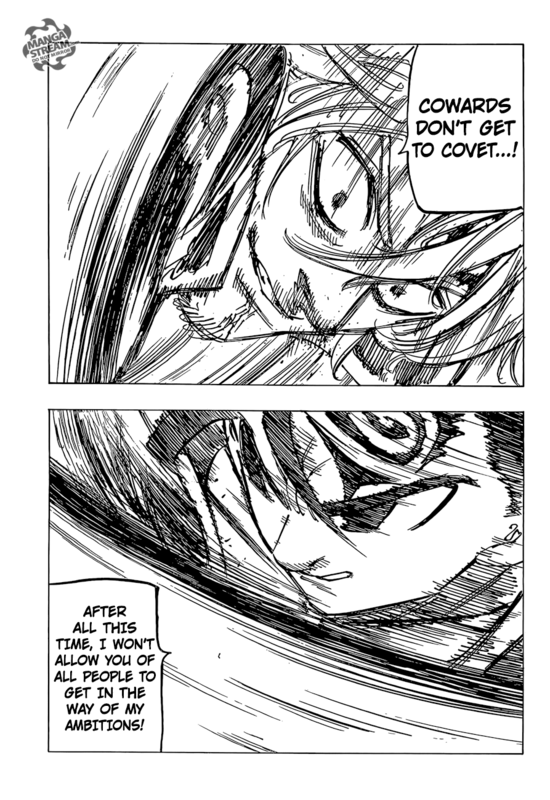 Effortlessly restrains an amped Zeldris and Estarossa at the same time. 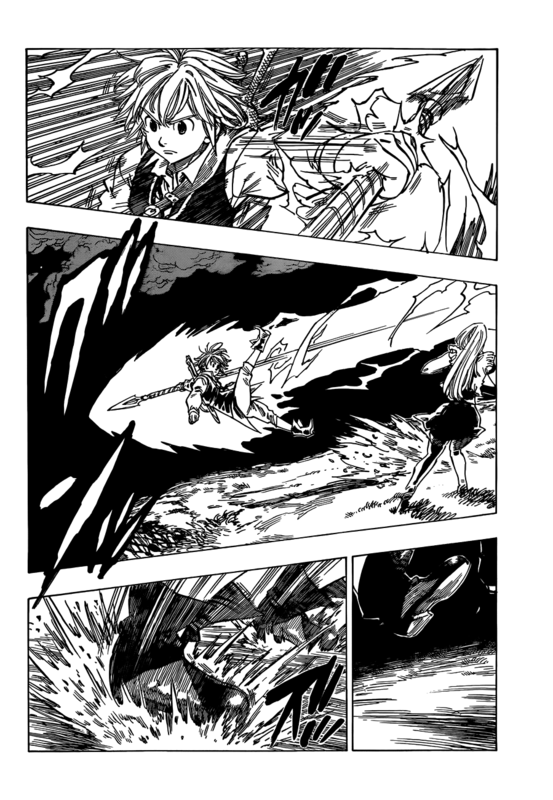 Tanks an attack from Elizabeth, who is in touch with her Goddess abilities. 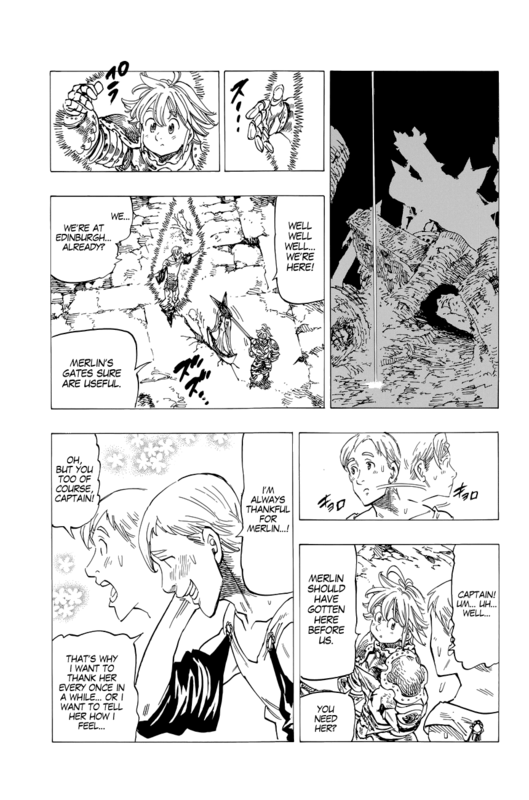 It's revealed Arthur with excalibur did nothing. 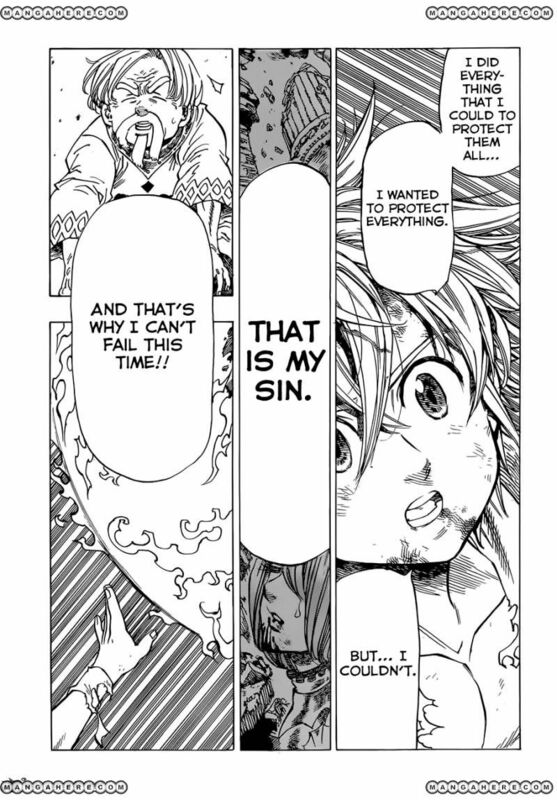 Absorbed 5 of the Commandments' commandments. 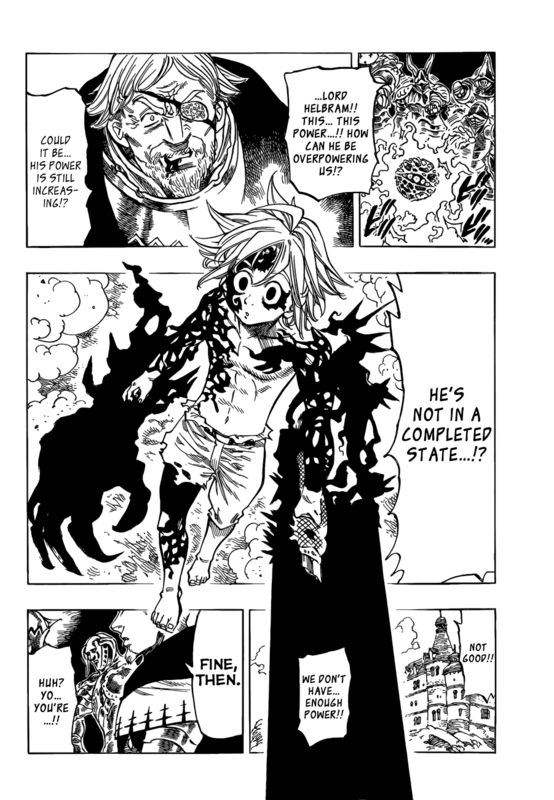 Firstly, there is Black Matter manipulation, it is a common misconception that he can only do this in his demon form, however, that is not the case, though it is at a vastly higher level when in Demon Form. 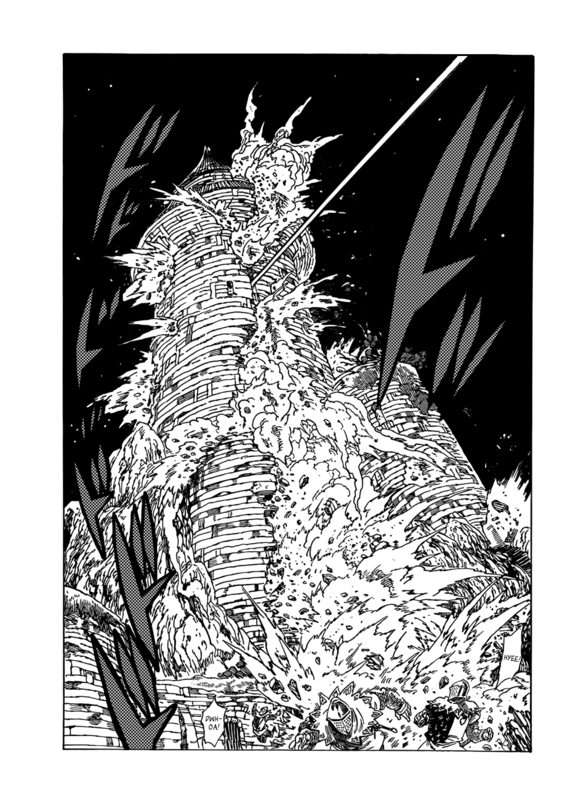 Enhances his sword with Hellblaze using his base. 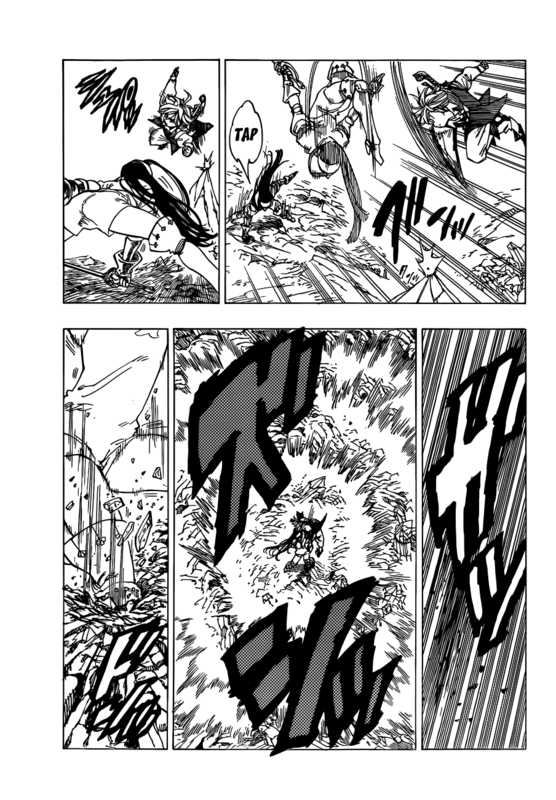 Full Counter: Can deflect shock waves, status effects, explosions, Hell Blaze, and other non direct and magic attacks. 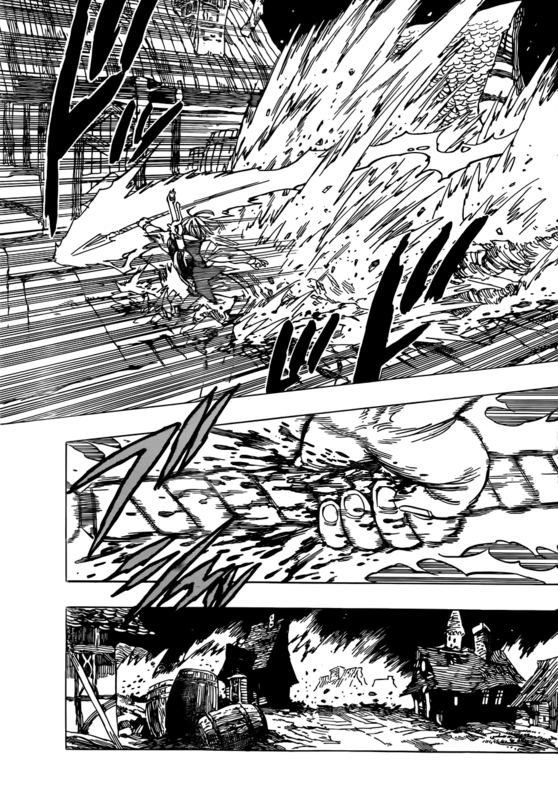 Works on multiple attacks, and doesn't require strength. 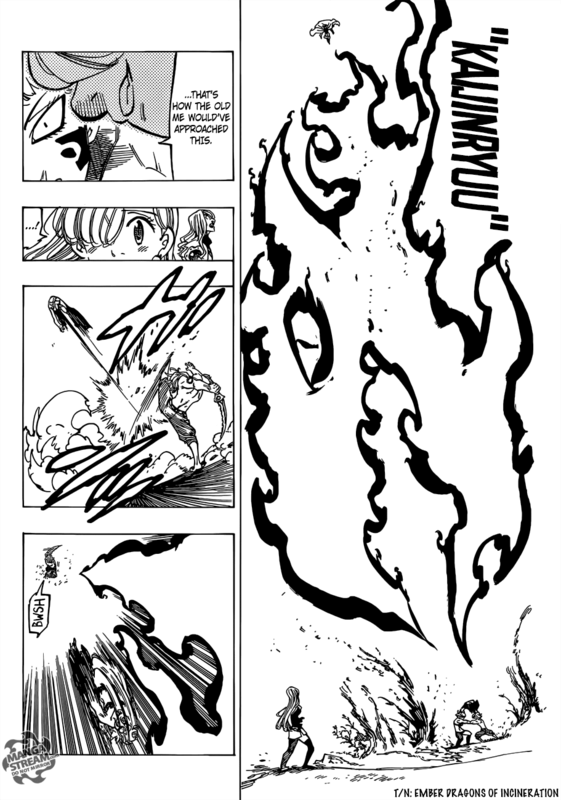 Uses Counter vanish to delete fire balls and implies he can delete Monspeet's firebird. 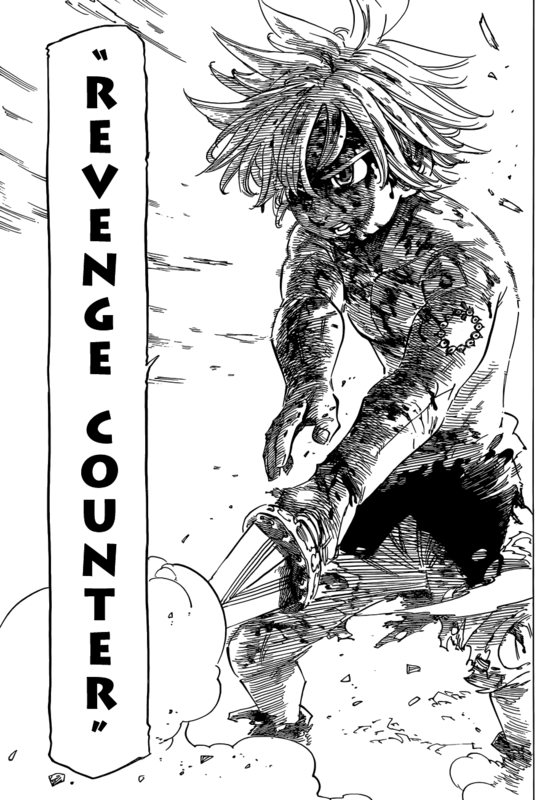 Revenge Counter: He reflects all the damage he has taken on to an opponent. 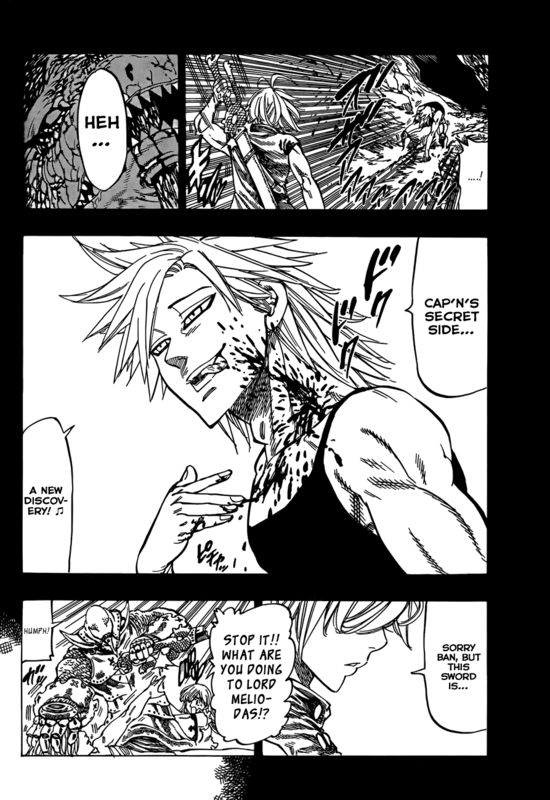 His Hellblaze Nullifies Ban's regeneration, causing a permanent scar - Yes, it's Hellblaze. 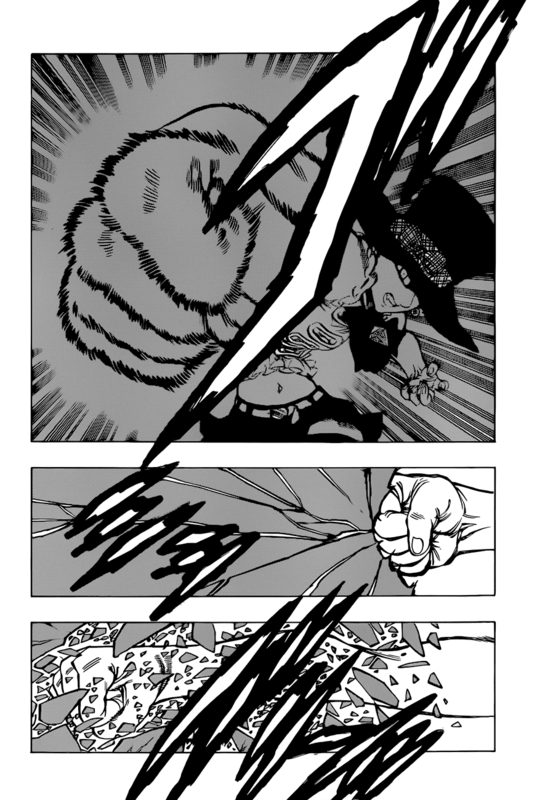 Can enhance his punches with Hellblaze. 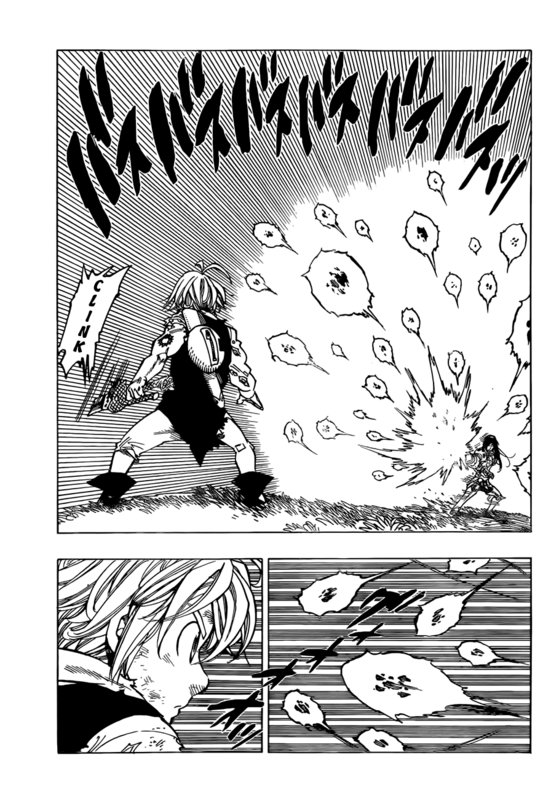 Has enhanced (blocks invisible blows) senses. 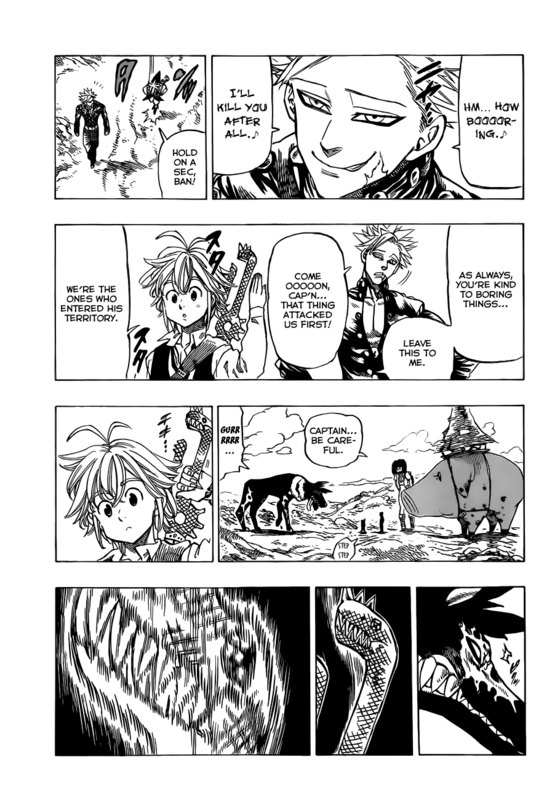 Can strike fear in beings with his killing intent. 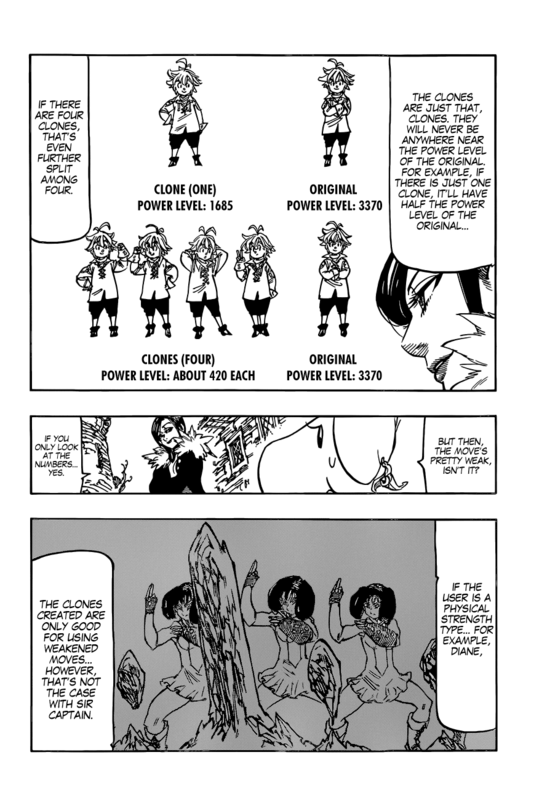 Can clone himself with Lostvayne. 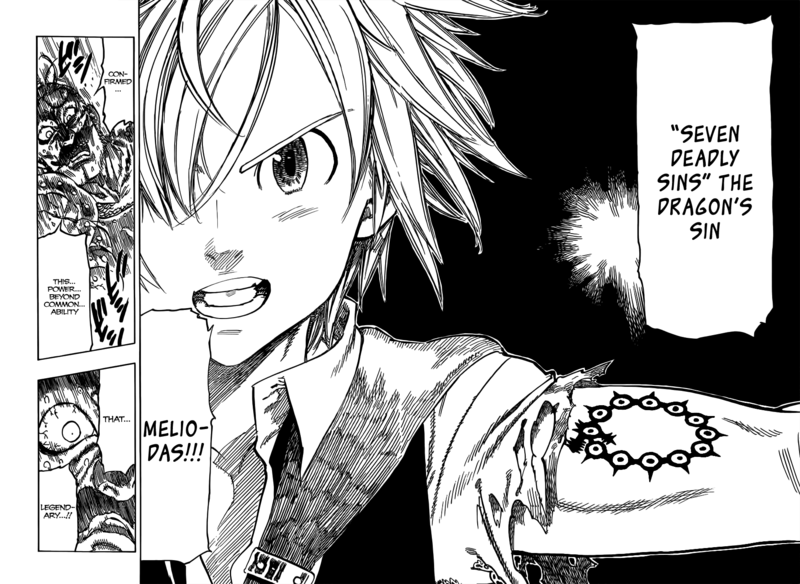 - Can create wings to fly. 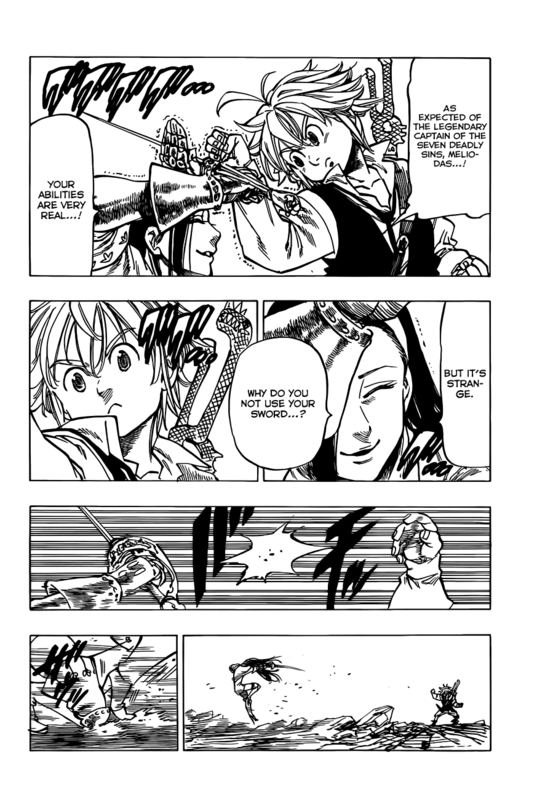 - Can create large blades. 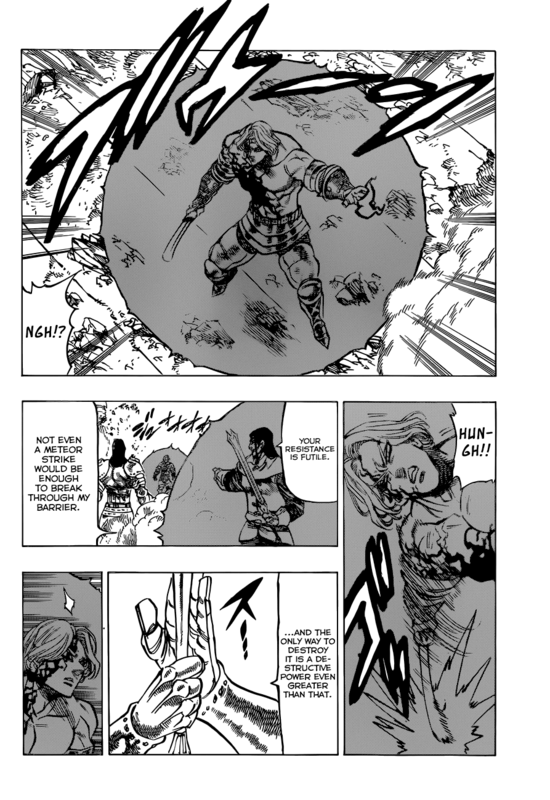 - Shielded himself to withstand a sword blow. 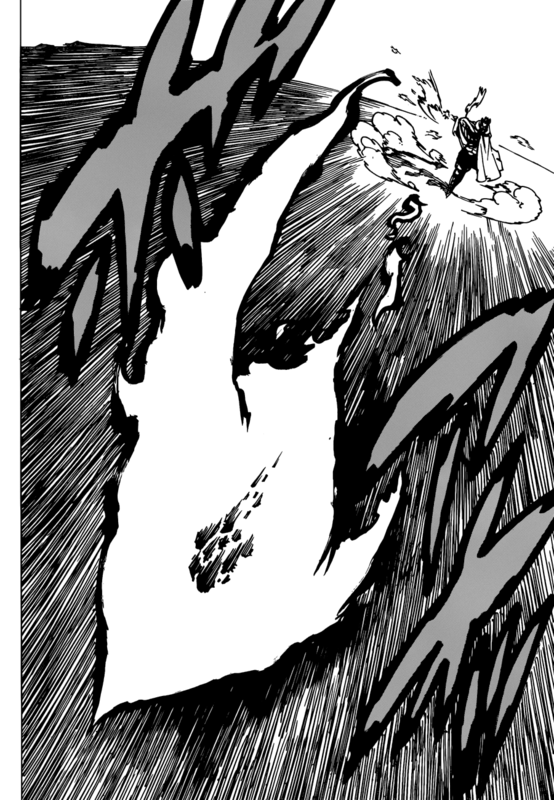 - Forms a claw and blade. 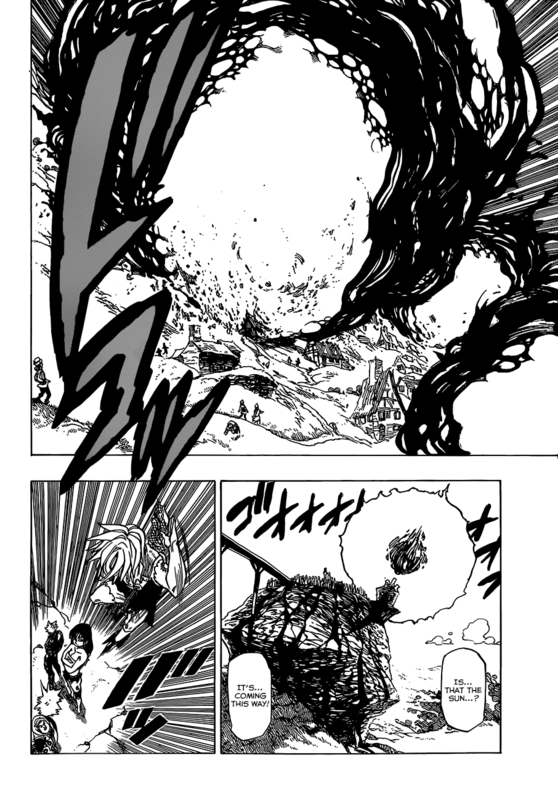 Turns the Black Matter from his Demon form into a ball. 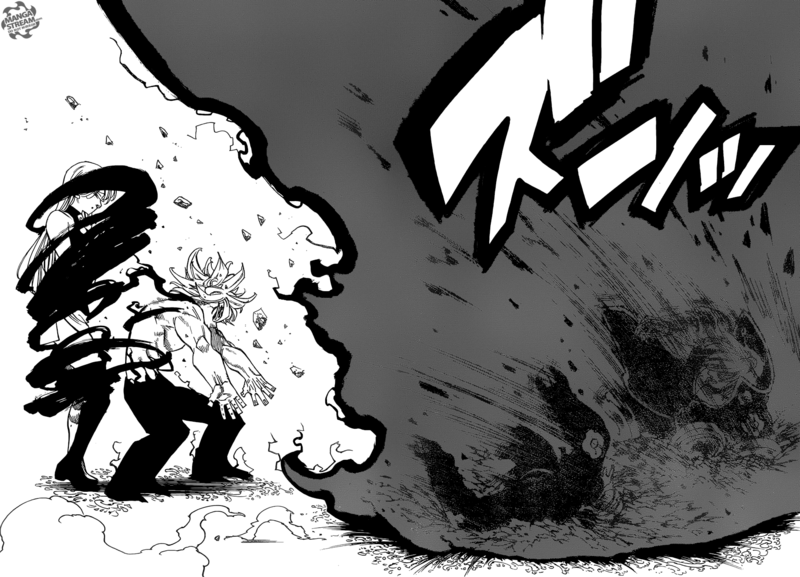 His demon form allows him to regenerate, though he still retains the damage, larger replacements need extreme exertion, It also has hard set limitations due to being based on magic power. 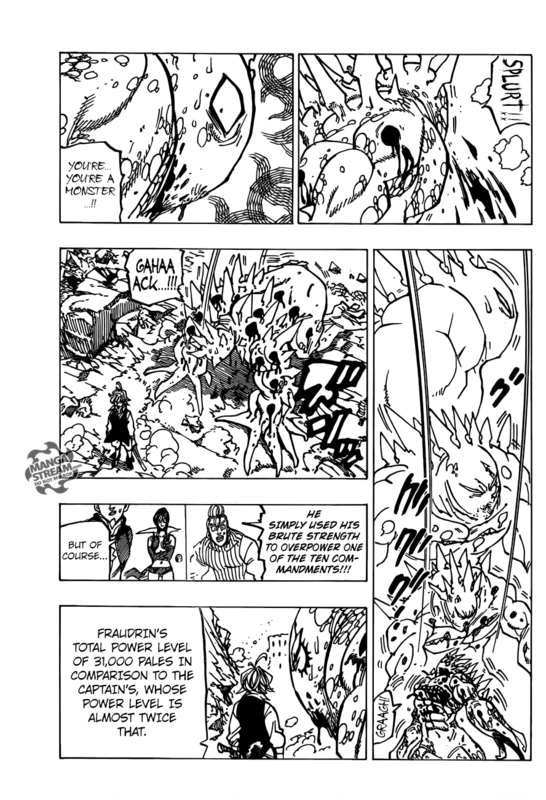 Due to being a member of the Demon Clan, he is immune to the acid down ability. 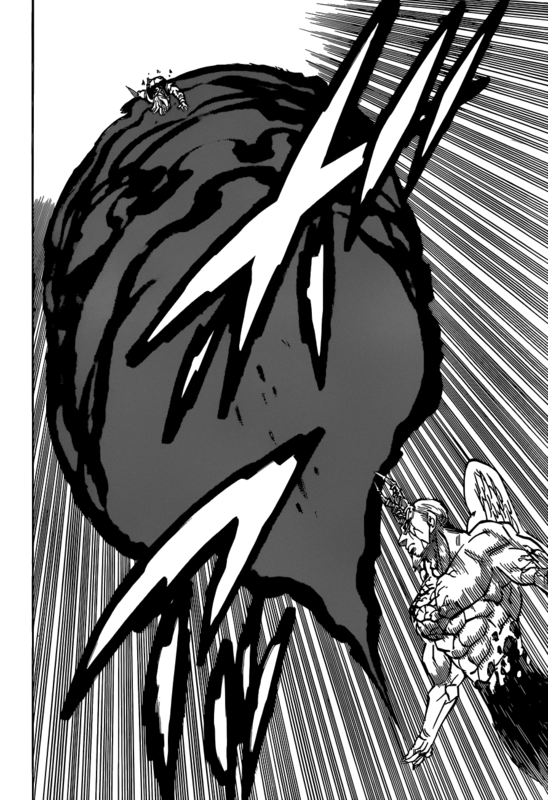 Can absorb the commandments commandments. 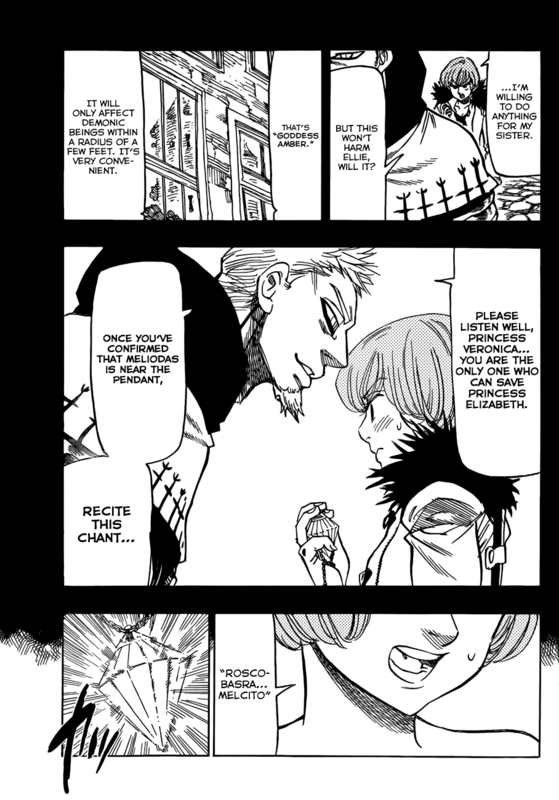 Note: It was revealed that Elizabeth's goddess powers healed him from that poison. 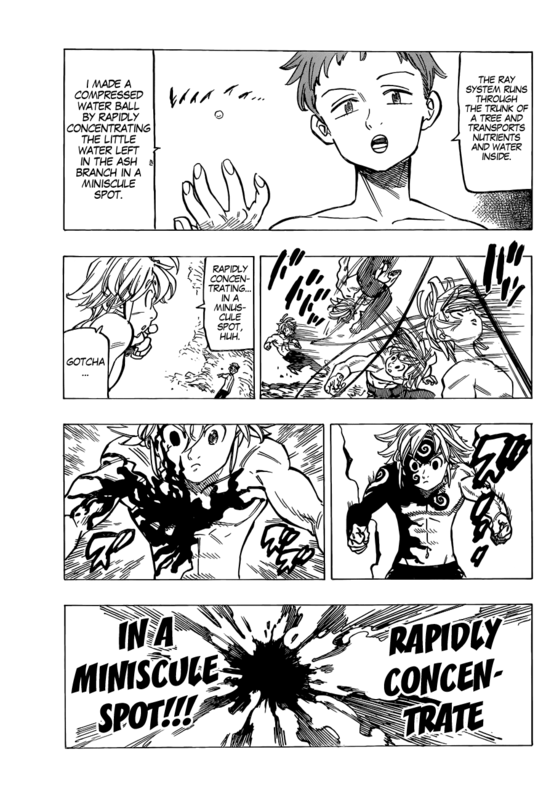 While he is extremely resistant to physical trauma, he can bleed out, but is at the point now where that much bloodloss is superficial. 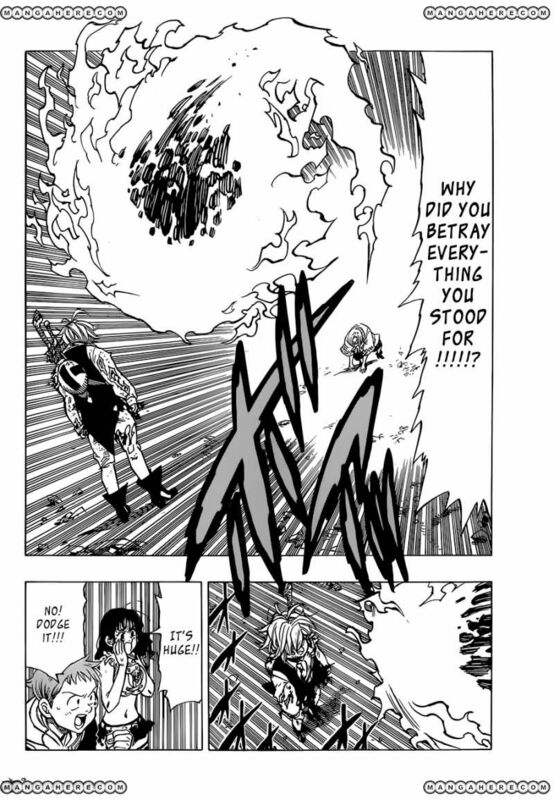 If all 7 hearts are destroyed, he will die. 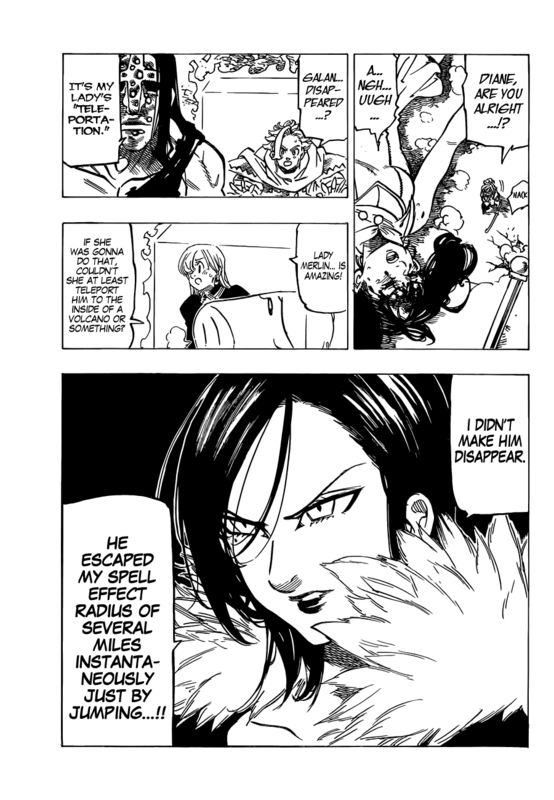 As mentioned above, his healing abilities restore his appearance, rather than his viatality. 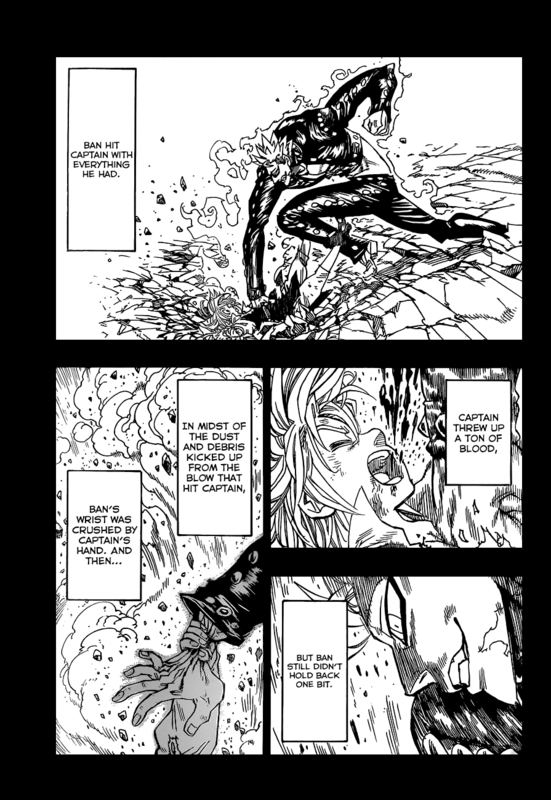 Formerly vulnerable to losing control of his demon abilities. 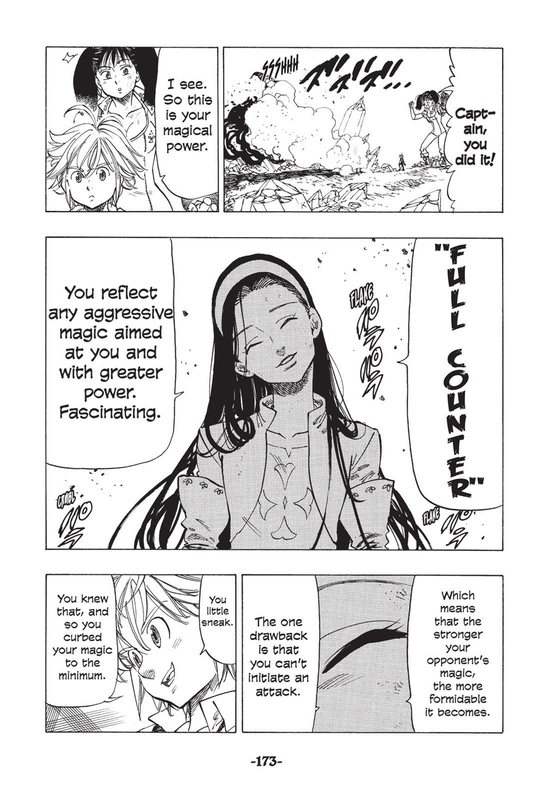 Full counter doesn't reflect timing based abilities.